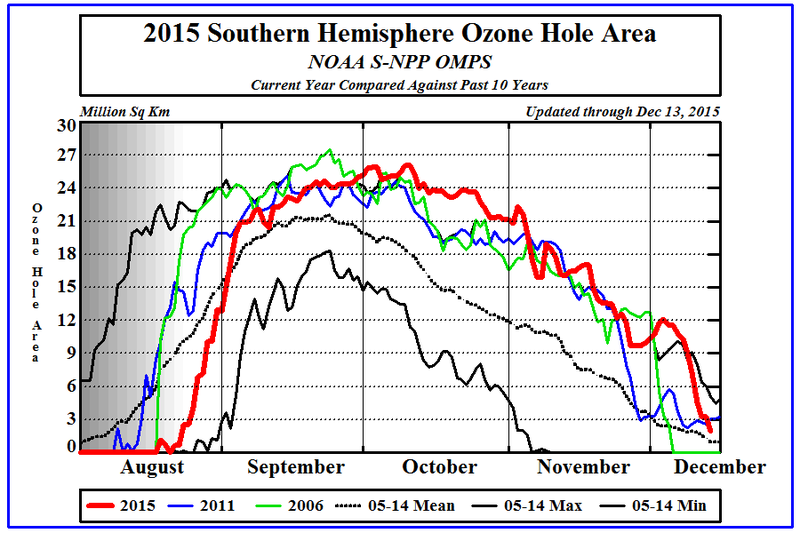 NOAA monitors meteorological conditions and ozone amounts in the stratosphere. 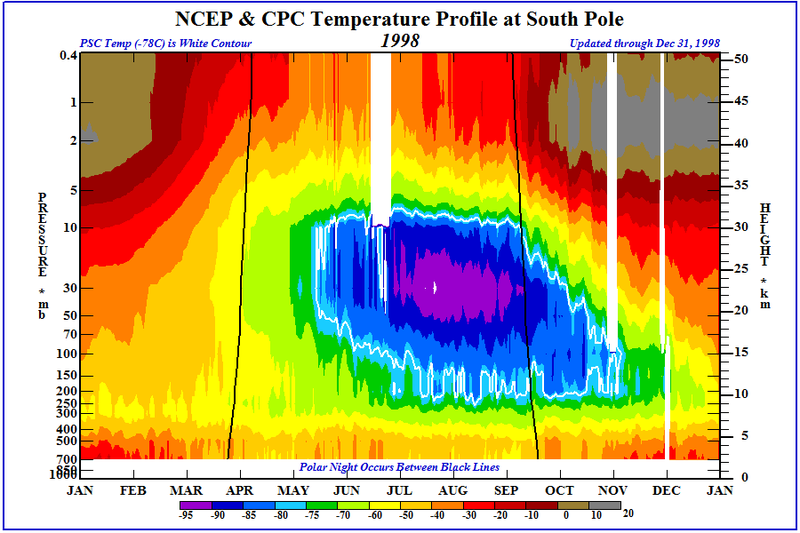 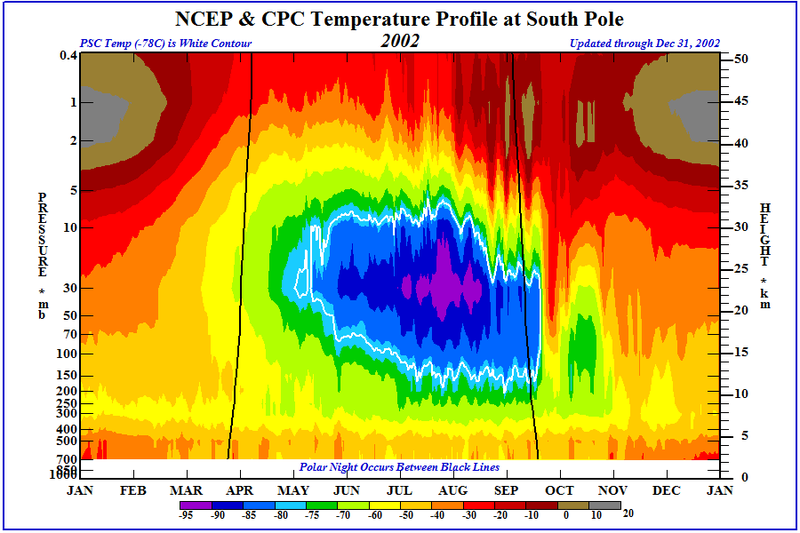 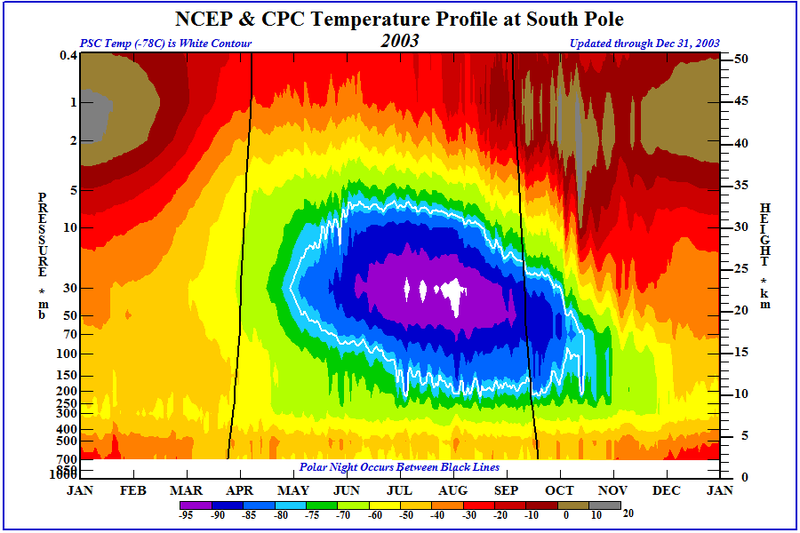 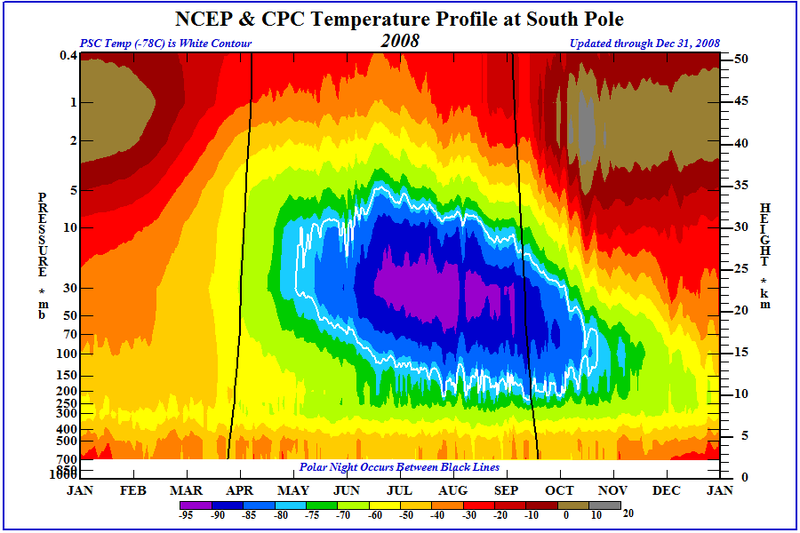 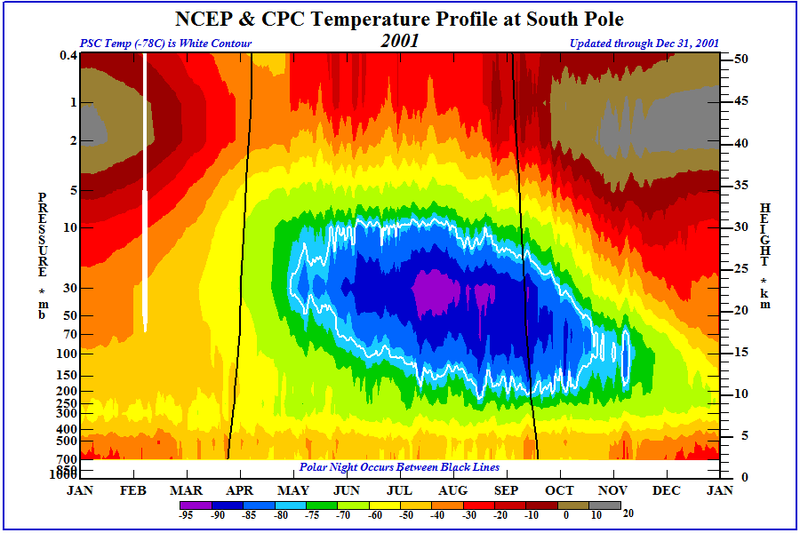 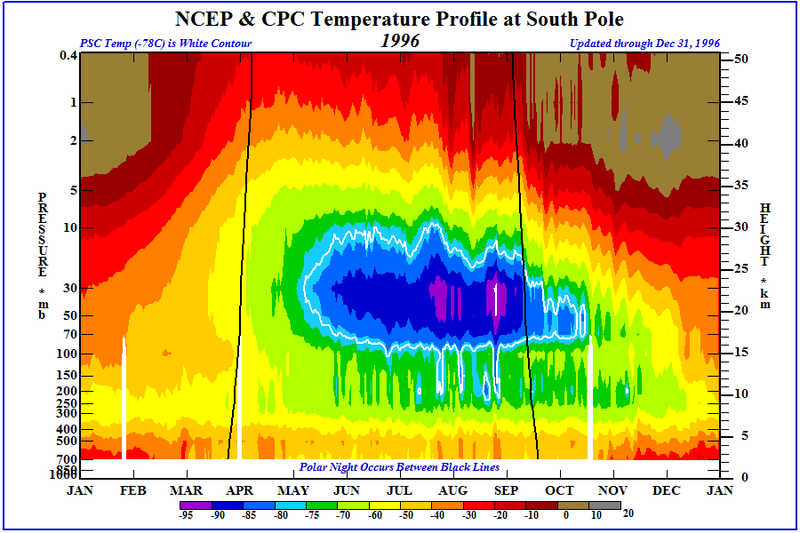 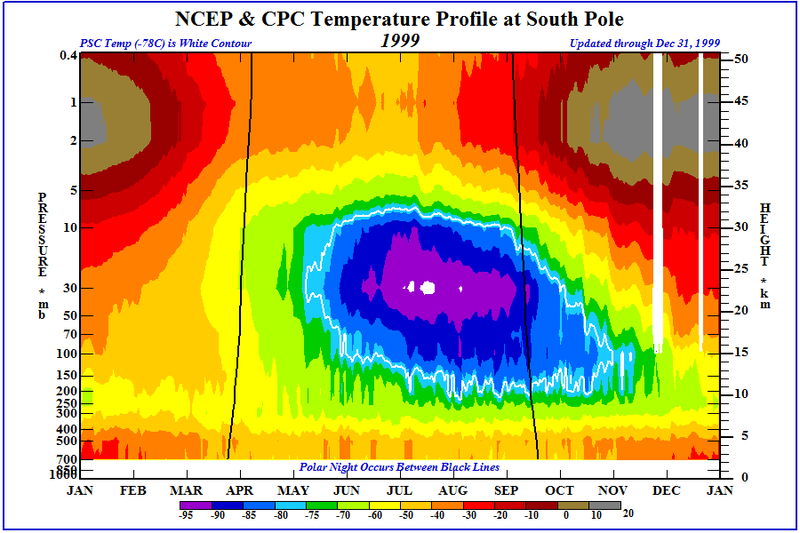 On this page we present graphics to aid in visualizing the evolution of the South Polar "ozone hole" and factors important for ozone depletion in the polar areas. 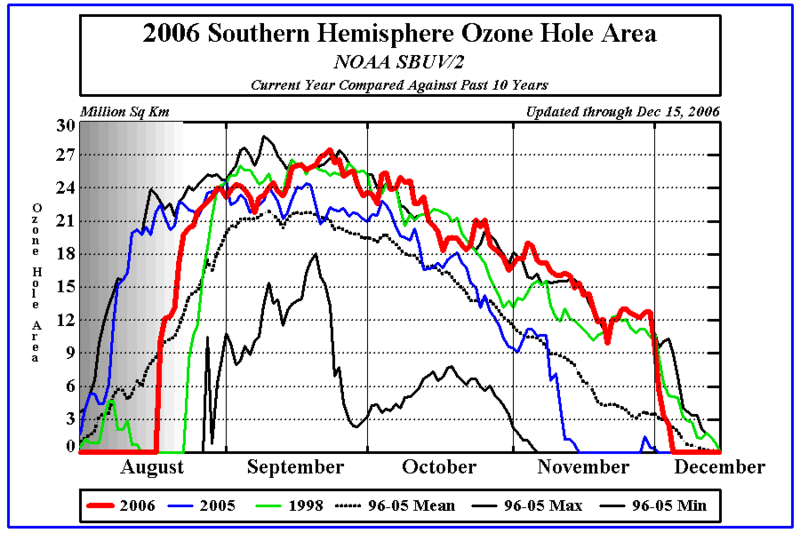 Several other web pages (see links) discuss the processes of ozone depletion. 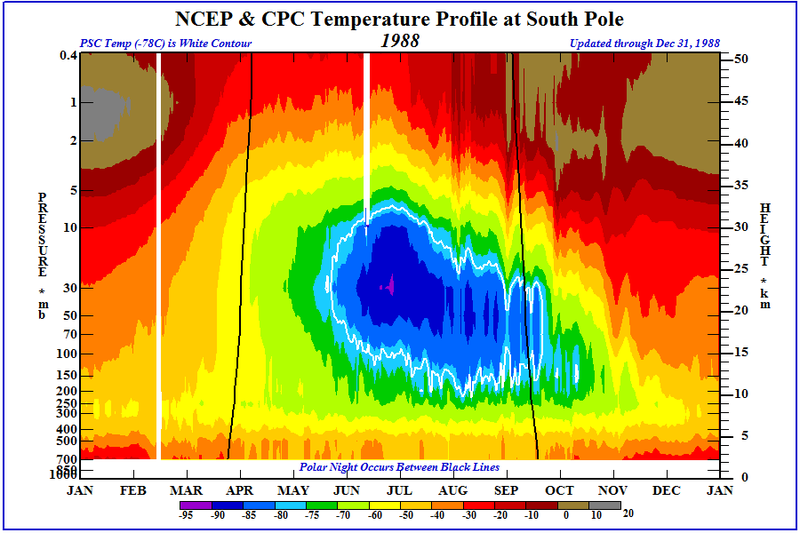 Here we provide information on the size of the polar vortex, the size of the ozone hole, the size of the area where air is cold enough to form Polar Stratospheric Clouds (PSCs), and which parts of this cold air are sunlit such that photo-chemical ozone depletion processes can occur. 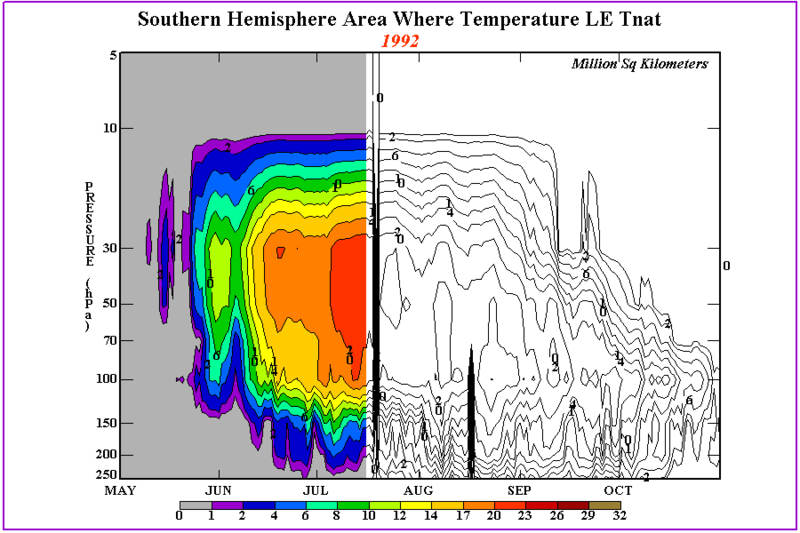 In addition, the latitudinal-time cross sections shows the thermal evolution at all latitudes. 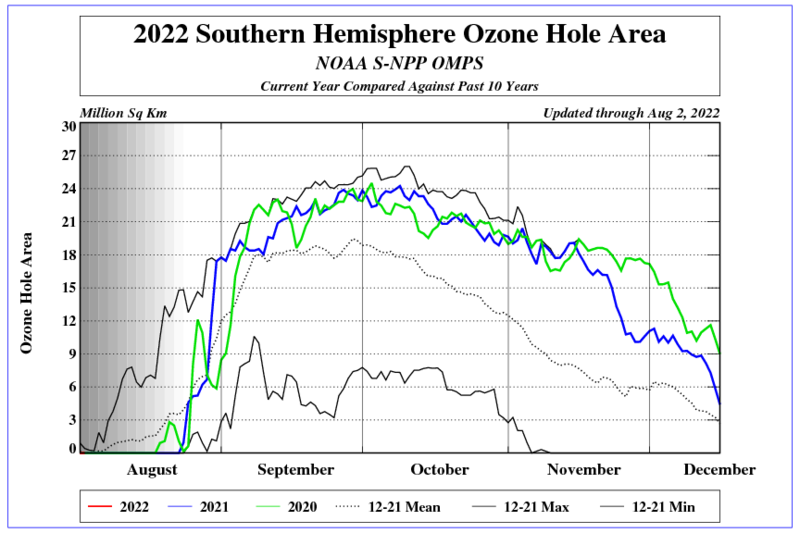 These maps shows the most recent analayis of the Southern Hemsisphere total ozone from the Ozone Mapping and Profiler Suite (OMPS) instrument on board the S-NPP and NOAA JPSS polar orbiting satellites. In austral spring the analyses show the "ozone hole" (values below 220 Dobson Units)over Antarctica and the Antarctic Ocean. 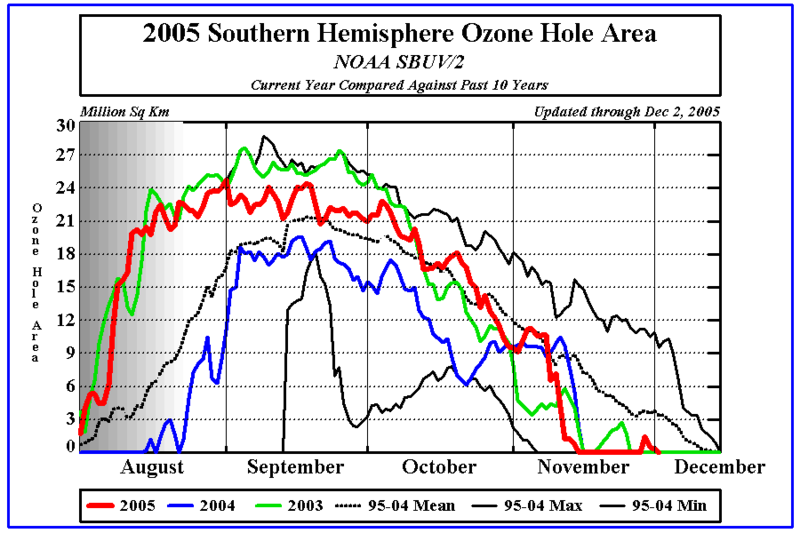 This area of low ozone is confined by the polar vortex. Usually circular in August and September, the vortex tends to elongate in October, stretching towards inhabited areas of South America. 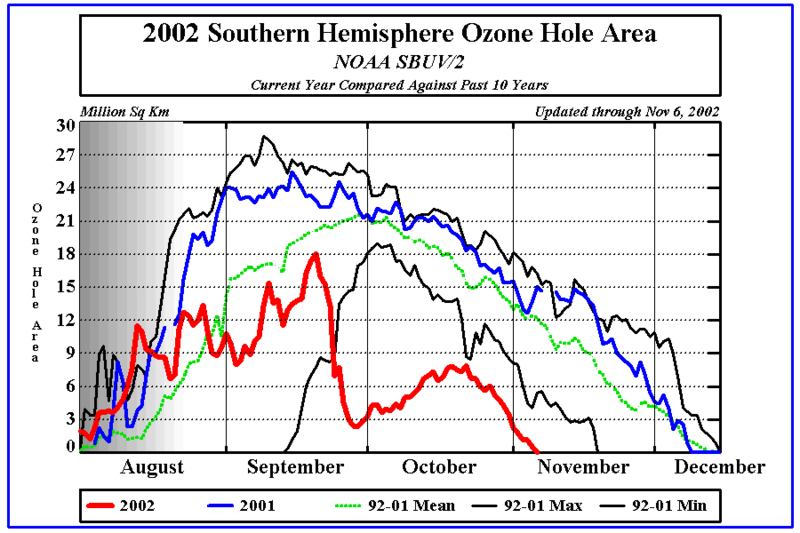 By November, the polar vortex begins to weaken and ozone rich air begins to mix with the air in the "ozone hole" region. 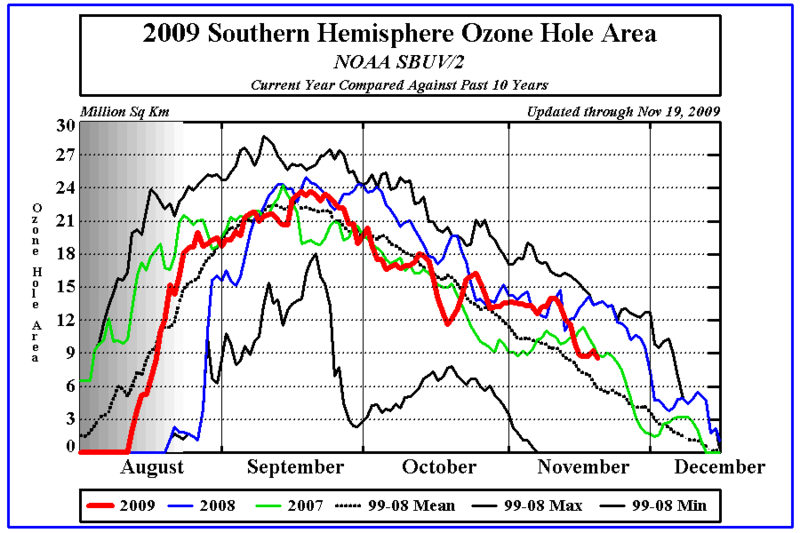 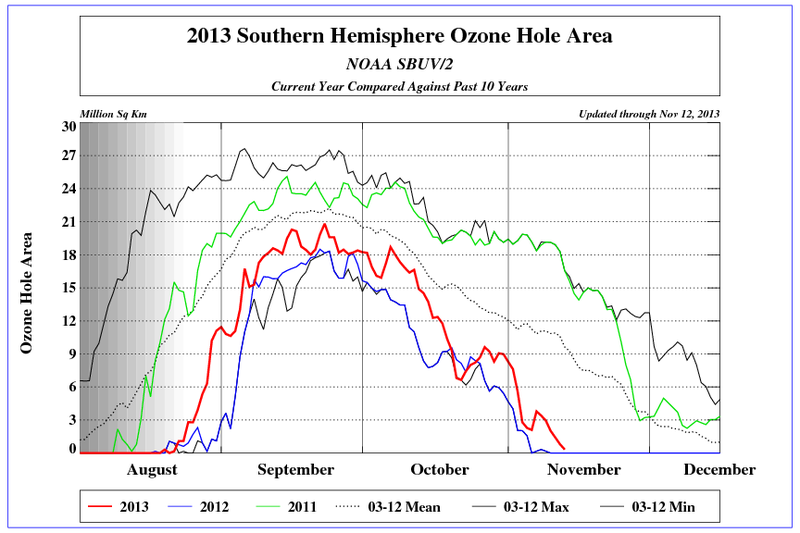 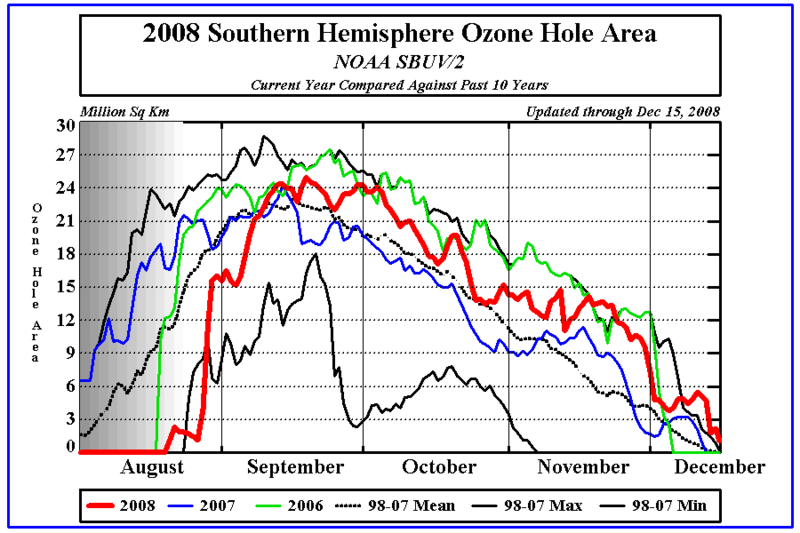 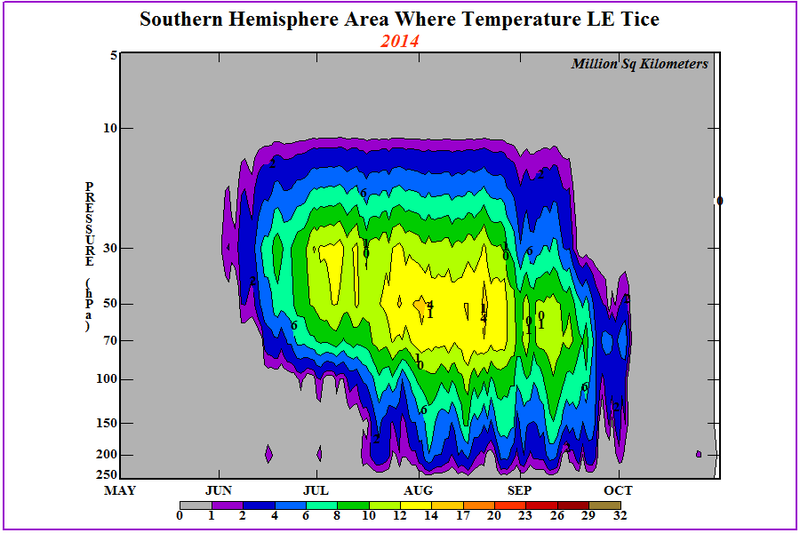 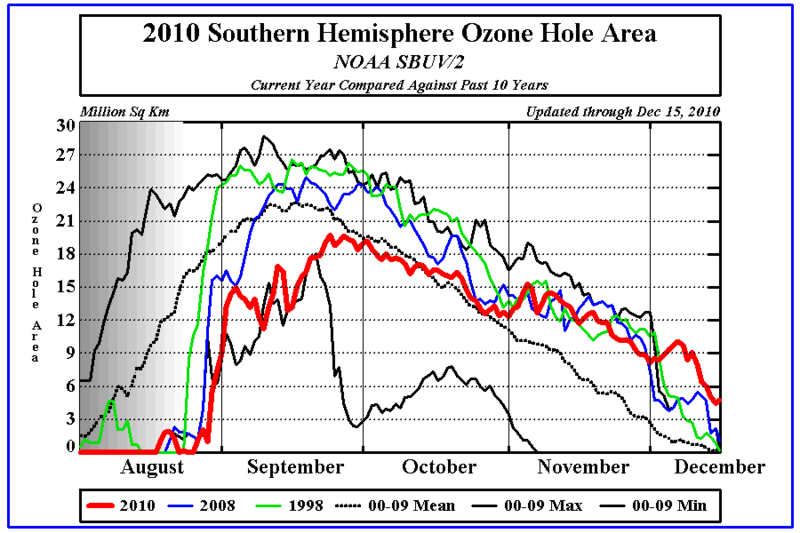 The "ozone hole" is usually gone by late November/early December. The OMPS instruments can not make observations in the polar night region because they relies upon bascscattered sun light. The blank area centered over the pole represents the latitudes in which no observations can be made. 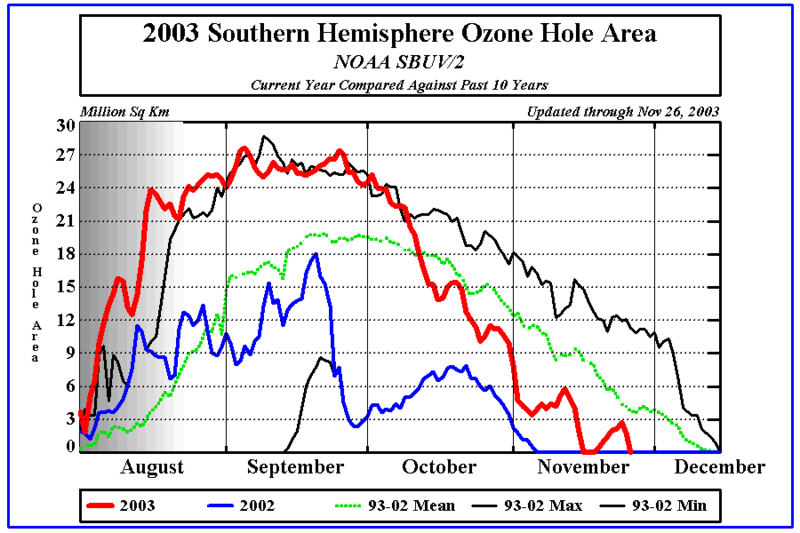 Influenced by depleted ozone within the Ozone Hole, surface UV-B radiation amounts can reach levels found only in the tropics. 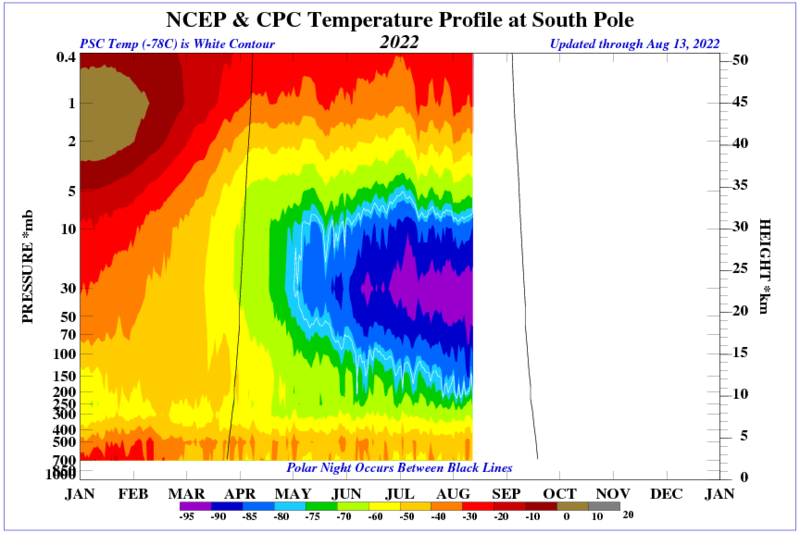 This map shows the estimated daily dosage of erythemally weighted UV radiation. This estimate is based upon the first 24 1-hour NOAA/EPA UV Index forecasts. 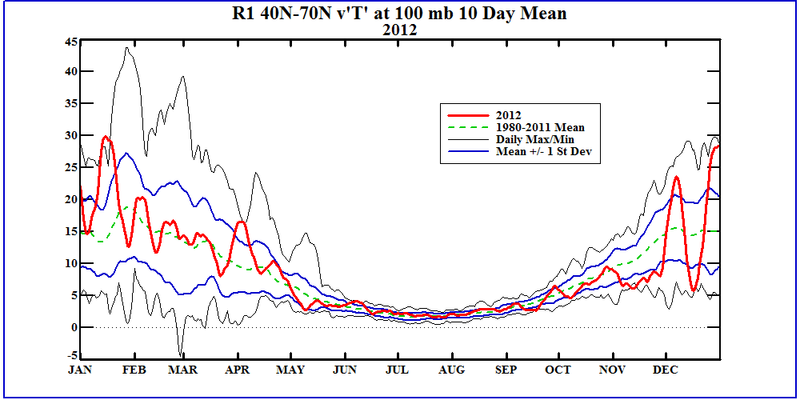 The UV Index forecast values are assumed constant over the hour of each of the 24 1-hour forecasts. 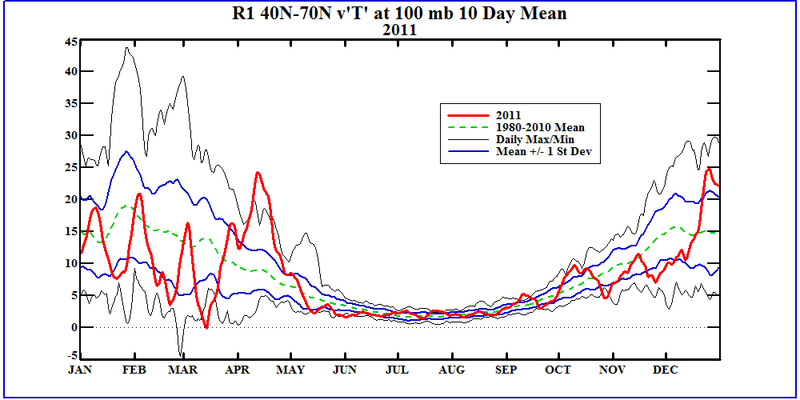 The daily dosage is then the sum of all 24 1-hour forecasts. The UV Index forecast is quite accurate for the first 24 hours. 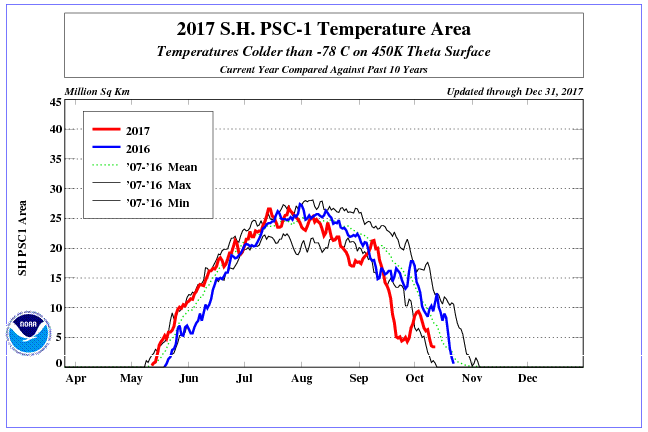 The UV Index forecast takes under consideration the total column ozone amount, the sun-earth orientation, the surface elevation, the enhancement effects of snow and ice, aerosol scattering (using a seasonal global climatology), and cloud UV transmission. 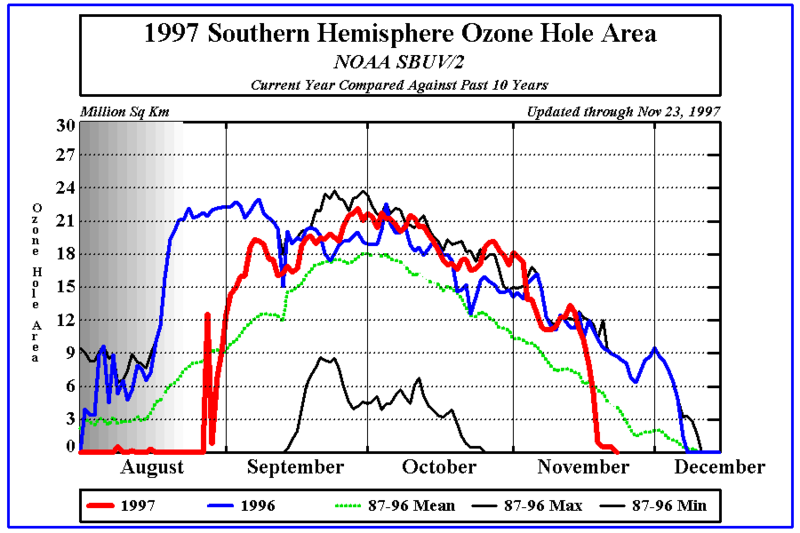 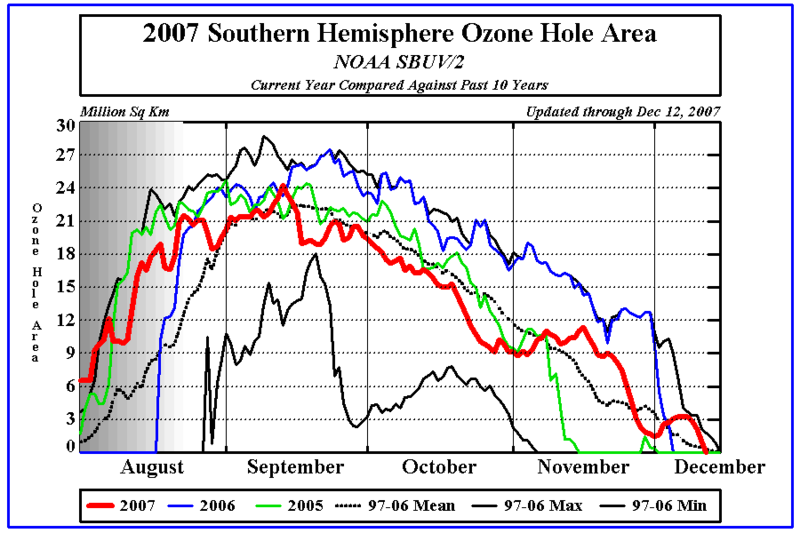 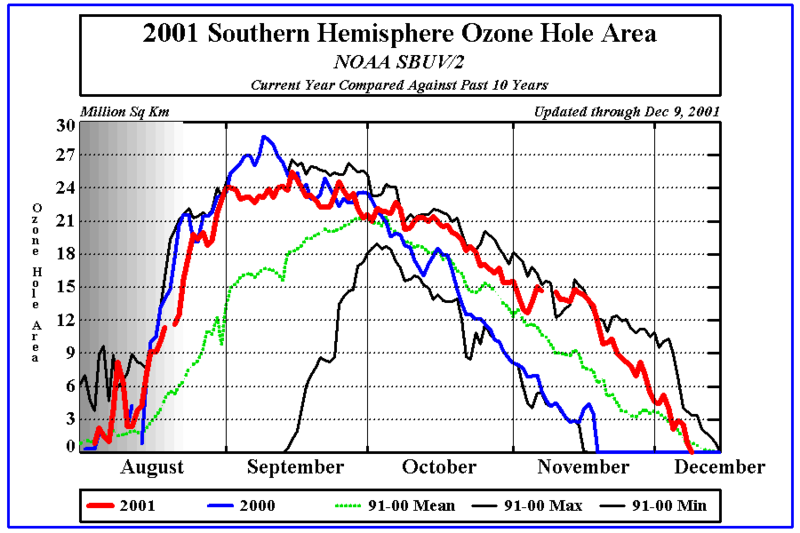 This figure shows the vertical profile of ozone over the South Pole when the "ozone hole" becomes well established. 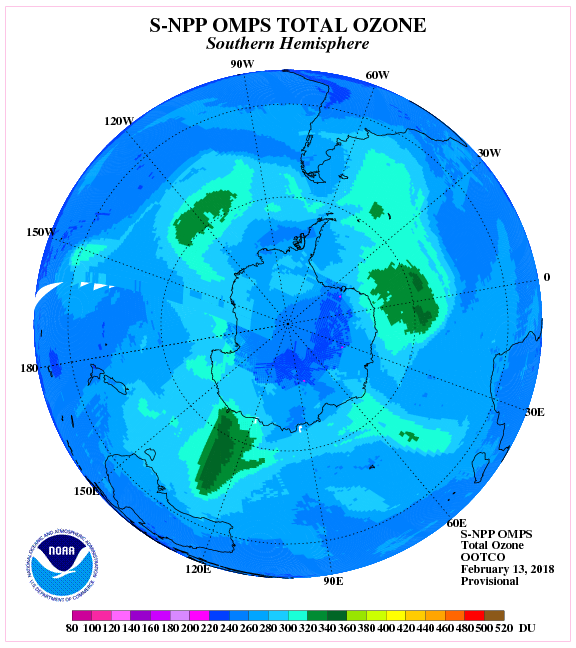 Nearly complete ozone depletion occurs between 13 km and 23 km, where extremely low temperatures support the heterogeneous photo-chemical destruction of ozone. 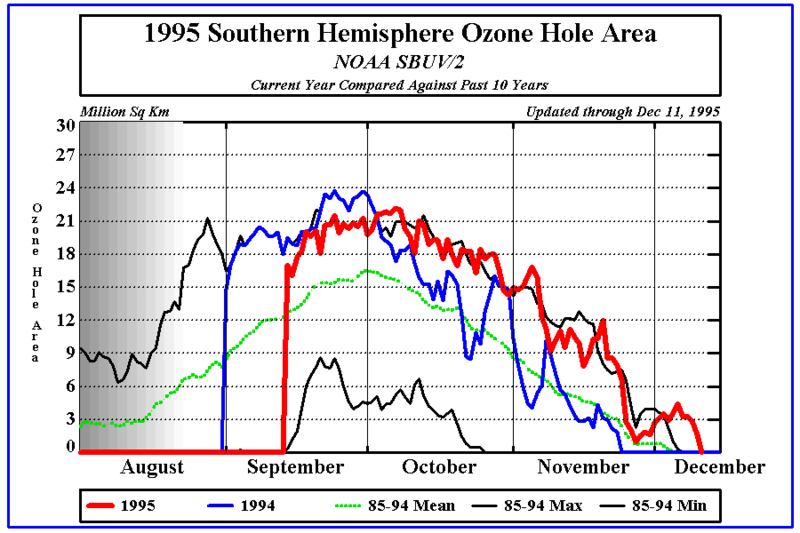 But, above and below these heights the air temperature is not low enough for this type of ozone destruction, and ozone amounts remain virtually unchanged. The most recent ozone soundings from the South Pole are available from NOAA's Earth System Research Laboratory - Global Monitoring Division - South Pole Ozone Hole Monitoring. Time series of the size of the S.H. 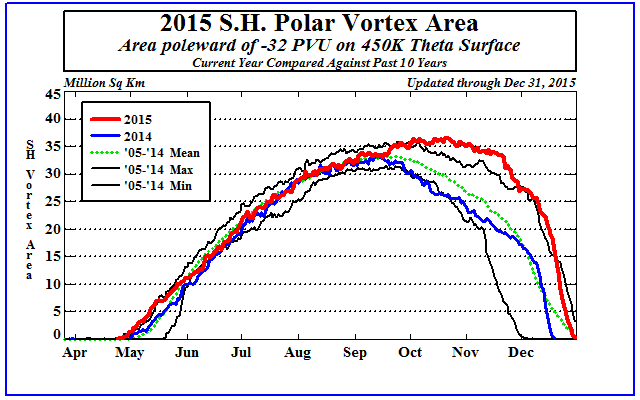 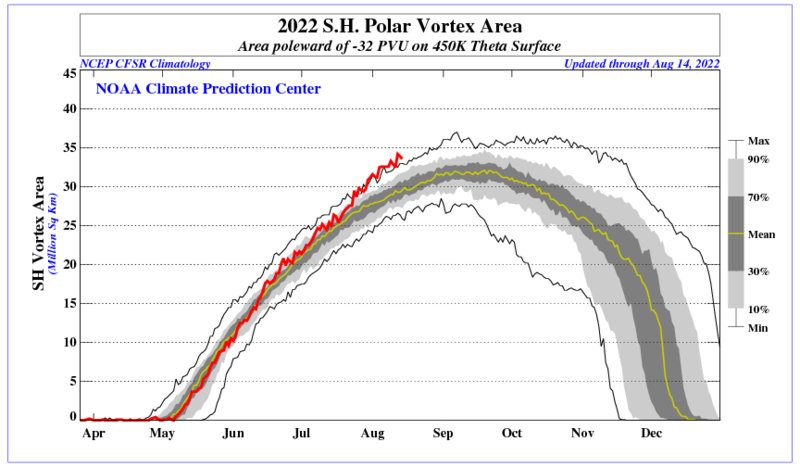 polar vortex at 450K. Air parcels move on isentropic surfaces (surfaces of equal potential temperature) rather than pressure surfaces. The 450 K surface in the south polar area lies between the 70 mb and 50 mb pressure surfaces. 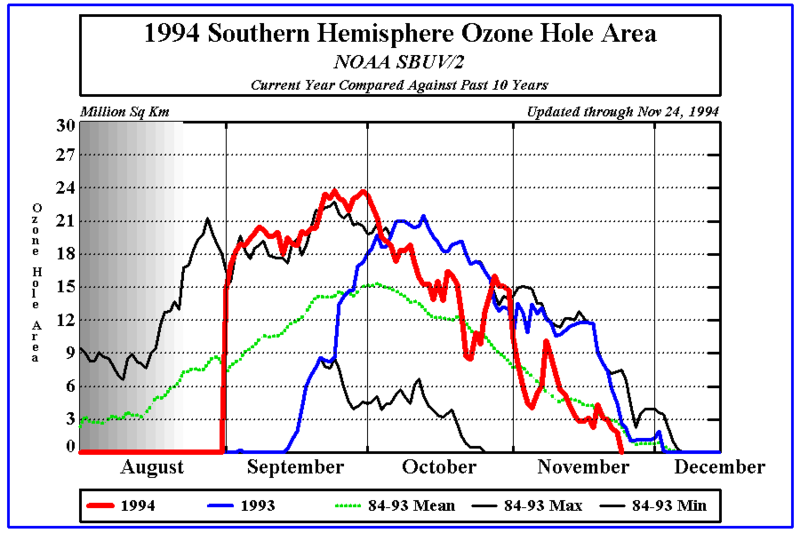 This is near the altitude where ozone is in greatest abundance in the vertical profile. This figure shows the size of the polar vortex with respect to previous years. 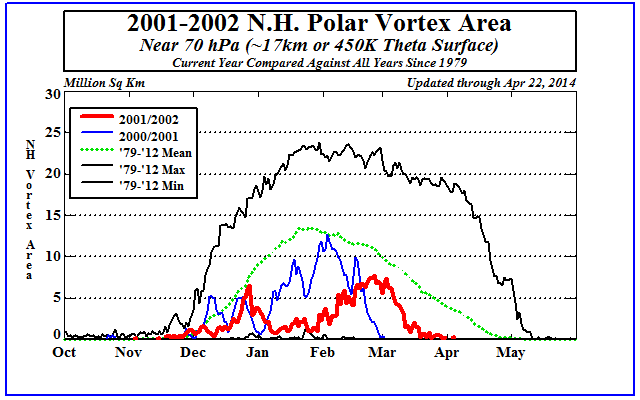 The polar vortex defines the area in which cold polar air is trapped by the very strong winds of the Polar Night Jet. 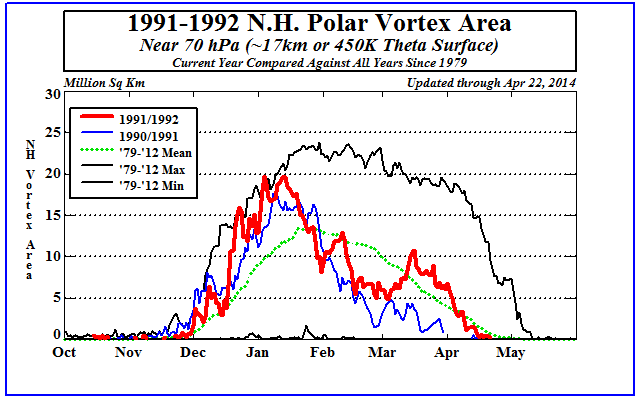 During the winter/spring period, when the polar vortex is strongest, air outside of the vortex can not enter. 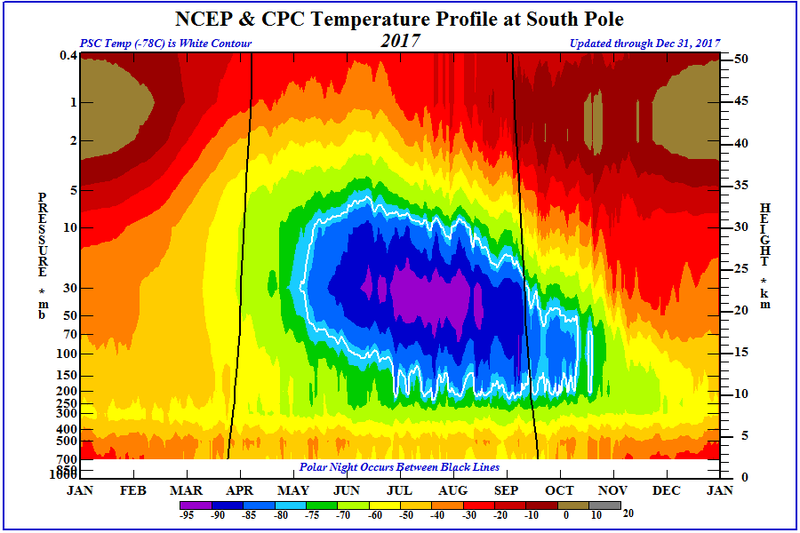 So, because the warm air from the mid latitudes can not mix with the cold polar air, the polar air continues to get colder due to radiative loss of heat. Also, when ozone in the vortex is depleted, it is not replenished with ozone rich air from outside the vortex. 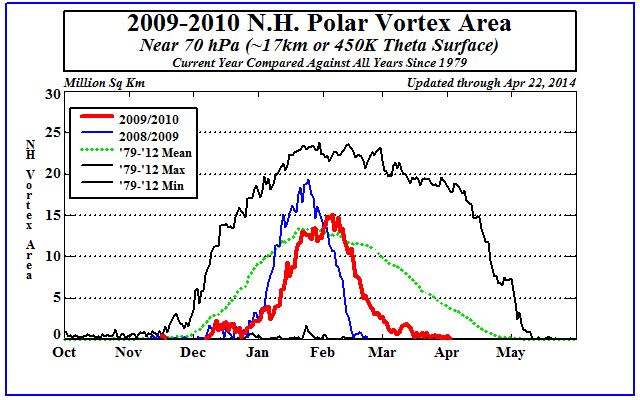 Not until mid to late Spring does the polar vortex weaken and eventually break down. 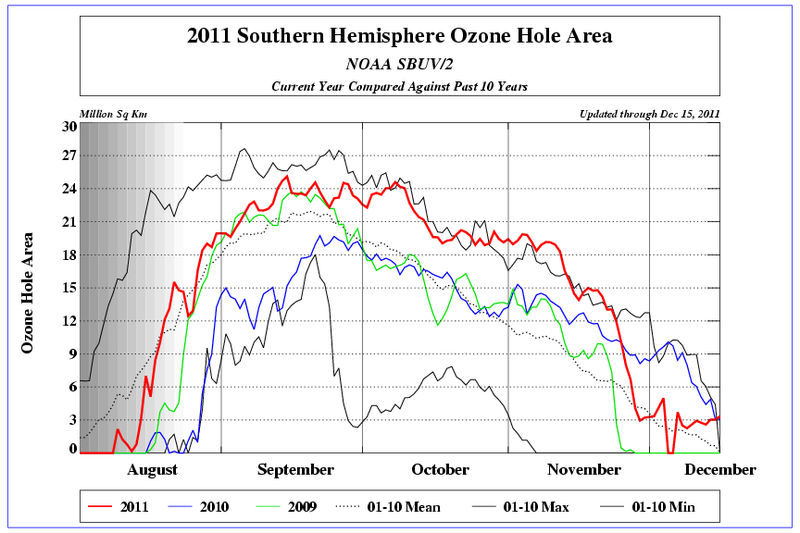 After this, thorough mixing occurs and ozone amounts are replenished. 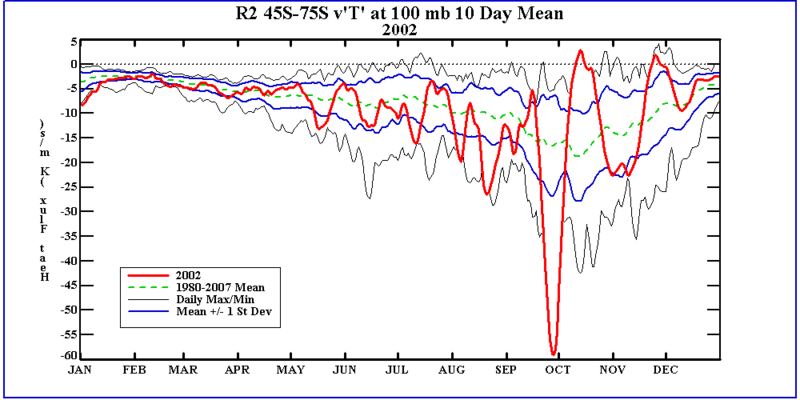 Time series of the size of the S.H. 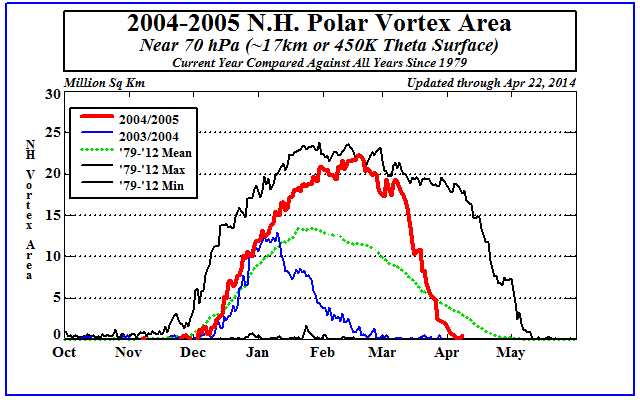 polar vortex at 550K. surfaces. The 550 K surface in the south polar area lies between the 50 mb and 30 mb pressure surfaces. 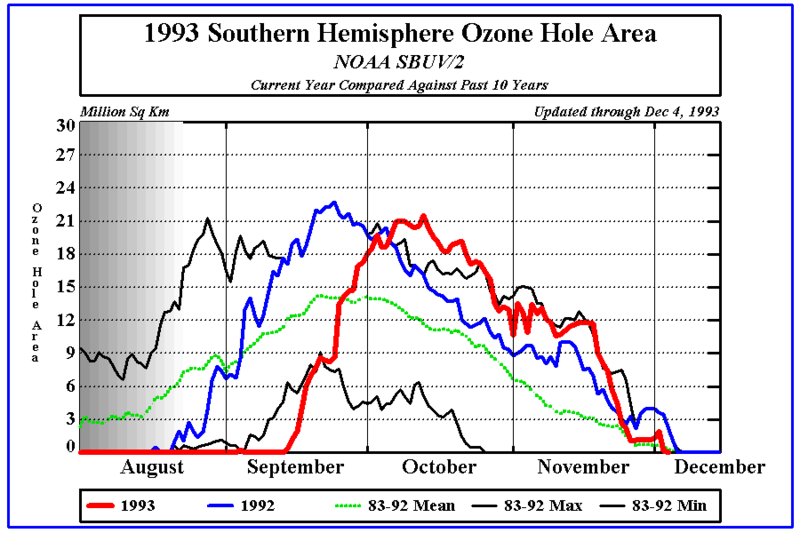 This is near or slightly above the altitude where ozone is in greatest abundance in the vertical profile. See the Vortex area at 450 K for more information. Time series of the size of the S.H. 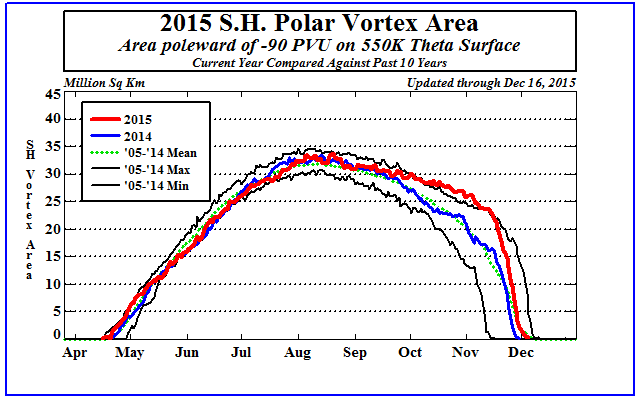 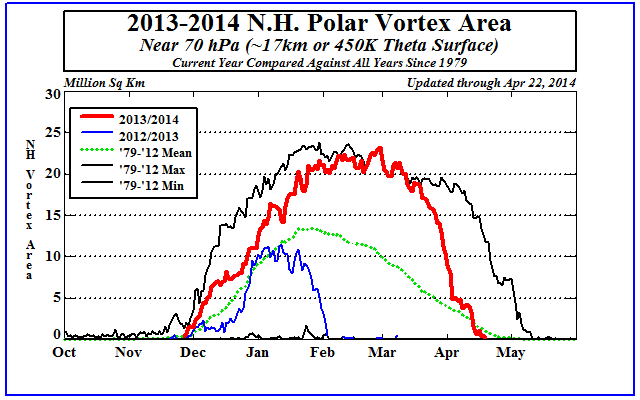 polar vortex at 650K. 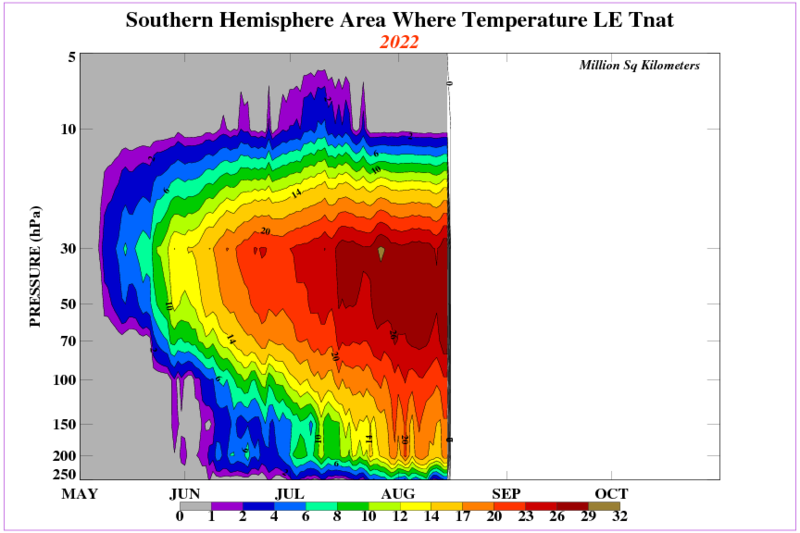 surfaces. 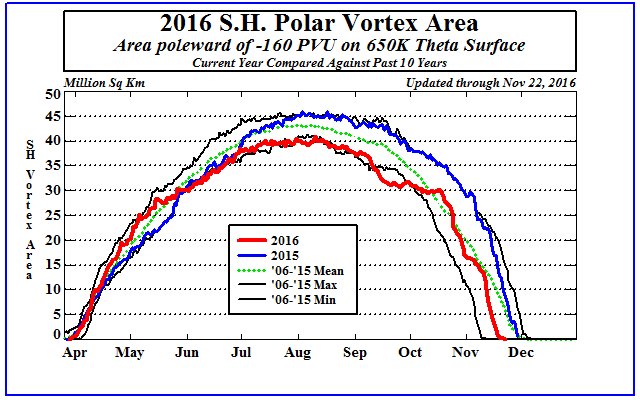 The 650 K surface in the south polar area lies between the 30 mb and 20 mb pressure surfaces. 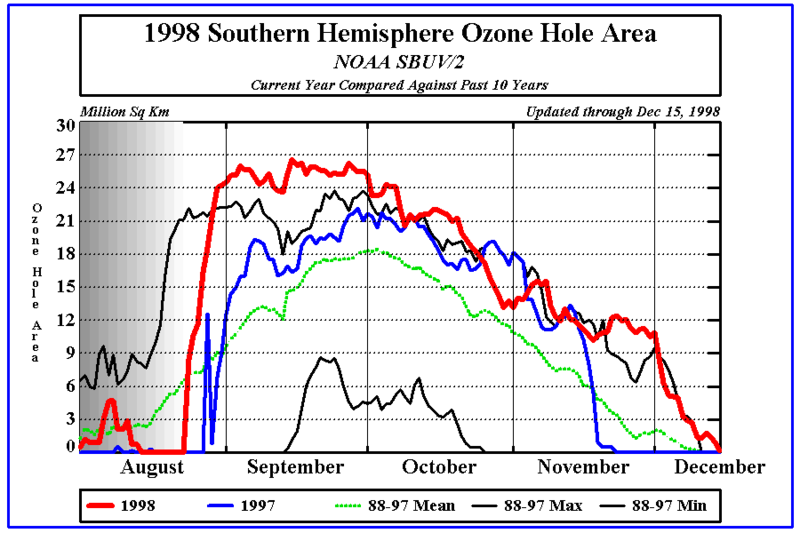 This is above the altitude where ozone is in greatest abundance in the vertical profile. 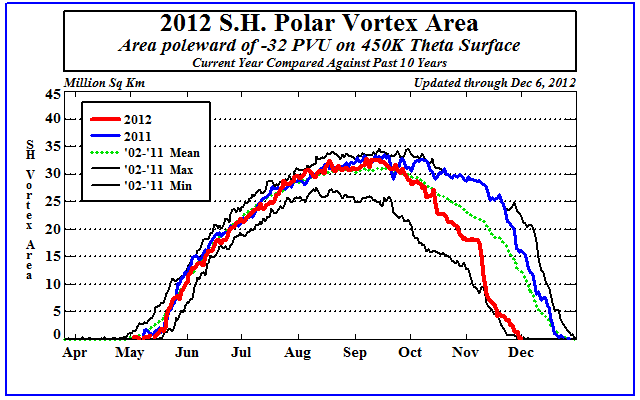 See the Vortex area at 450 K for more information. 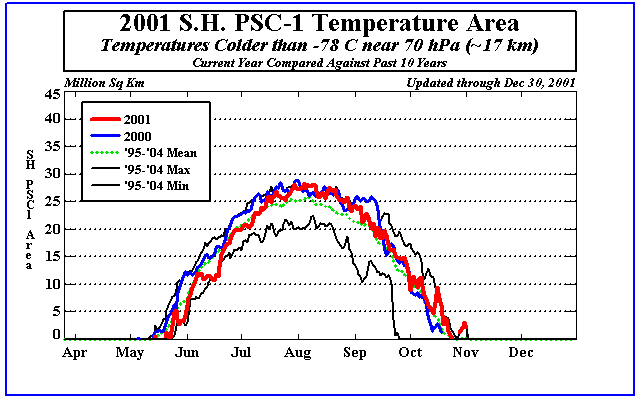 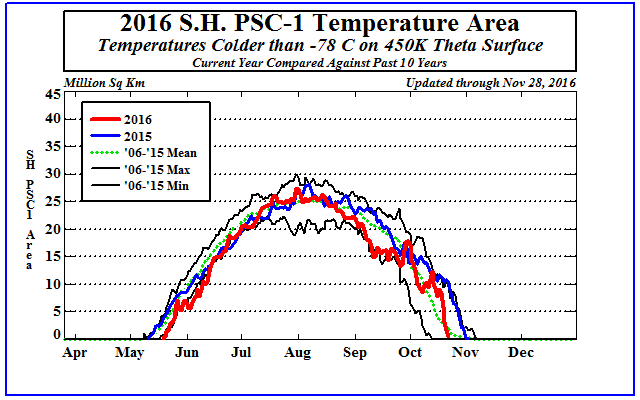 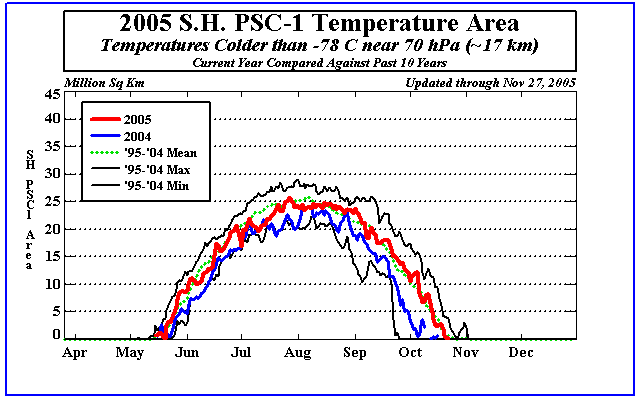 Time series of the size of the air colder than -78C (PSC-1) at 450K. 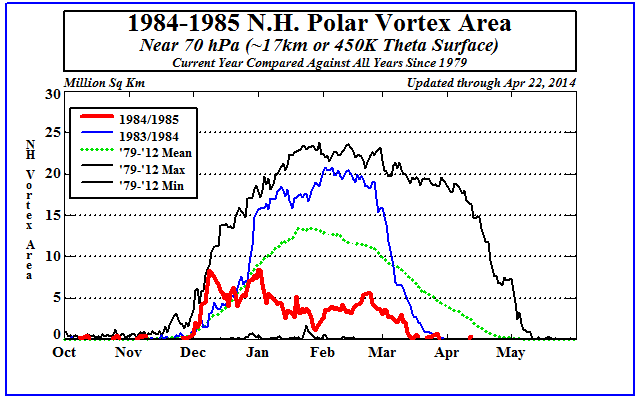 This figure shows the area within the polar vortex that has temperatures low enough to form Polar Stratospheric Clouds (PSCs). 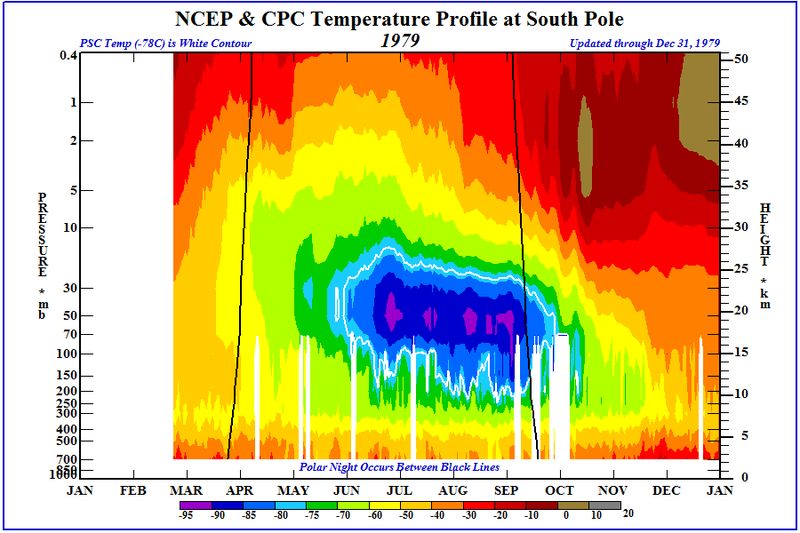 The ice crystals that make up these PSCs are where heterogeneous photo-chemical destruction of ozone take place. 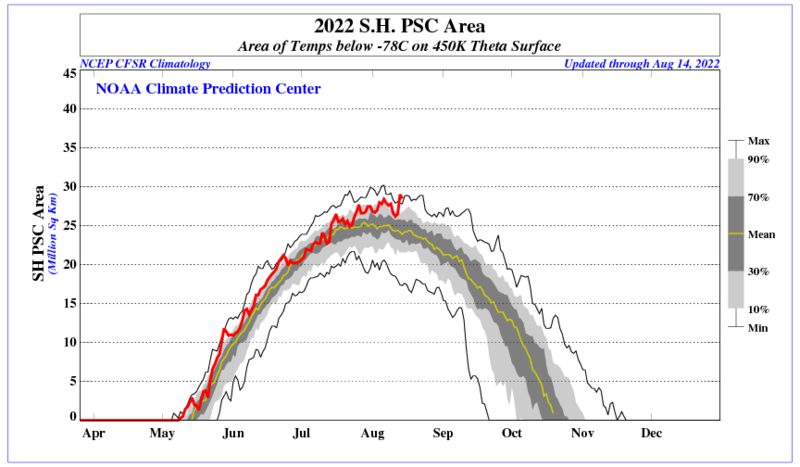 So as the area of low temperatures becomes larger, there is greater liklihood of PSCs forming. 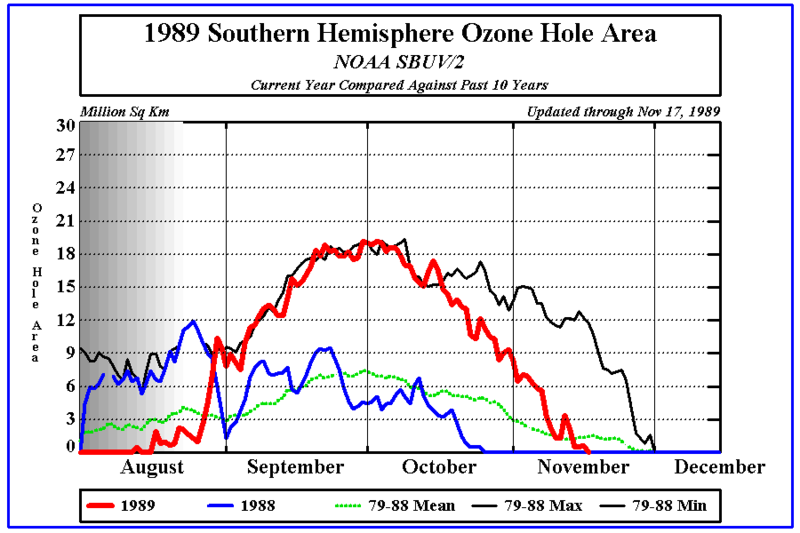 When this area becomes sunlit, enhanced ozone distruction takes place. 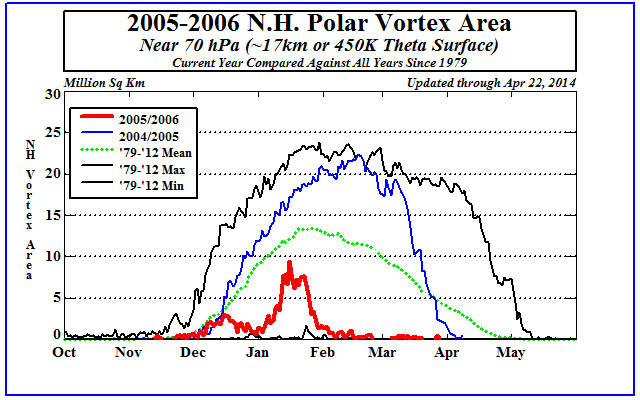 Time series of the size of the N.H. polar vortex at 450K. Air parcels move on isentropic surfaces (surfaces of equal potential temperature) rather than pressure surfaces. The 450 K surface in the north polar area lies between the 70 mb and 50 mb pressure surfaces. 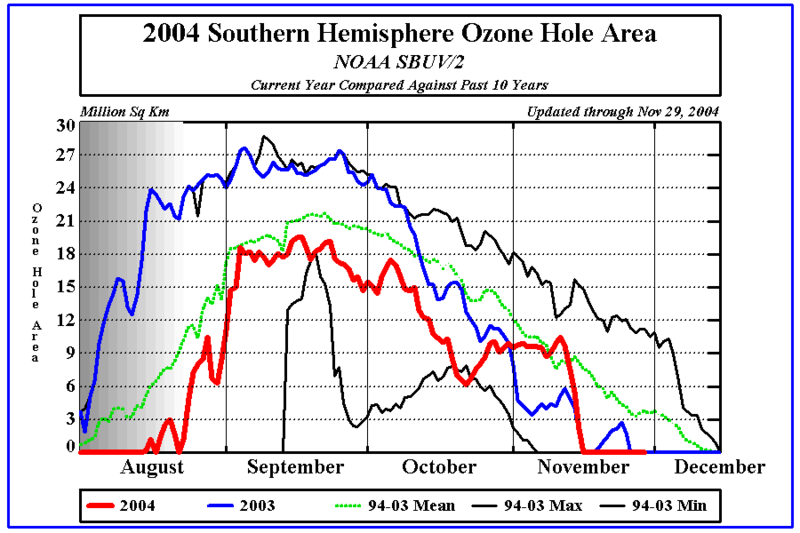 This is near the altitude where ozone is in greatest abundance in the vertical profile. 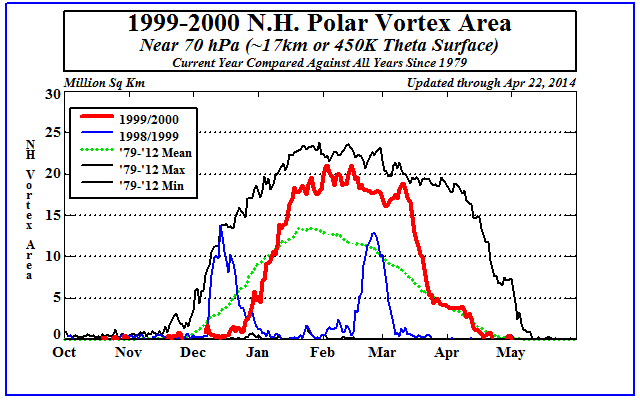 This figure shows the size of the polar vortex with respect to previous years. 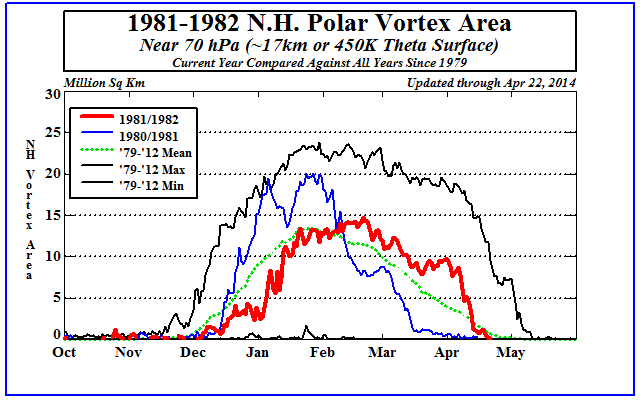 The polar vortex defines the area in which cold polar air is trapped by the very strong winds of the Polar Night Jet. During the winter/spring period, when the polar vortex is strongest, air outside of the vortex can not enter. 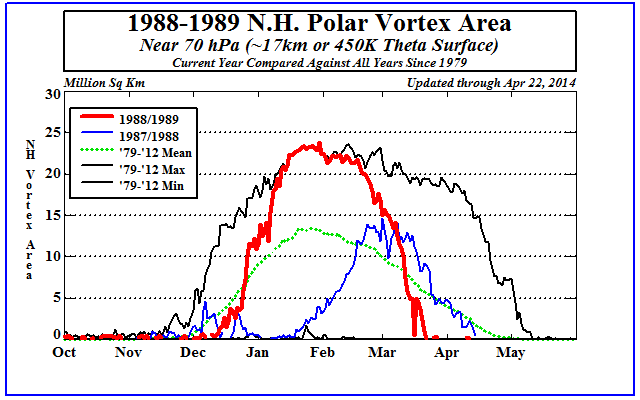 So, because the warm air from the mid latitudes can not mix with the cold polar air, the polar air continues to get colder due to radiative loss of heat. Also, when ozone in the vortex is depleted, it is not replenished with ozone rich air from outside the vortex. 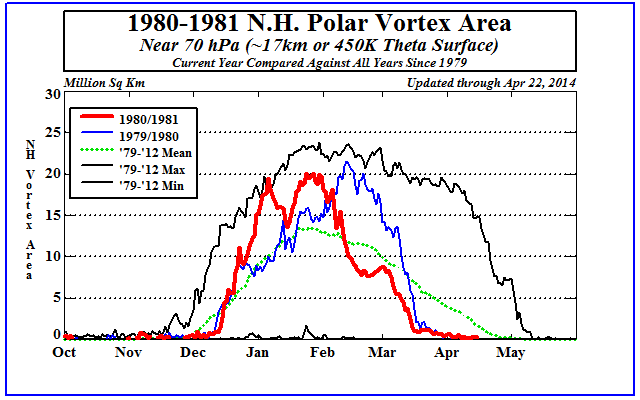 Not until mid to late spring does the polar vortex weaken and eventually break down. 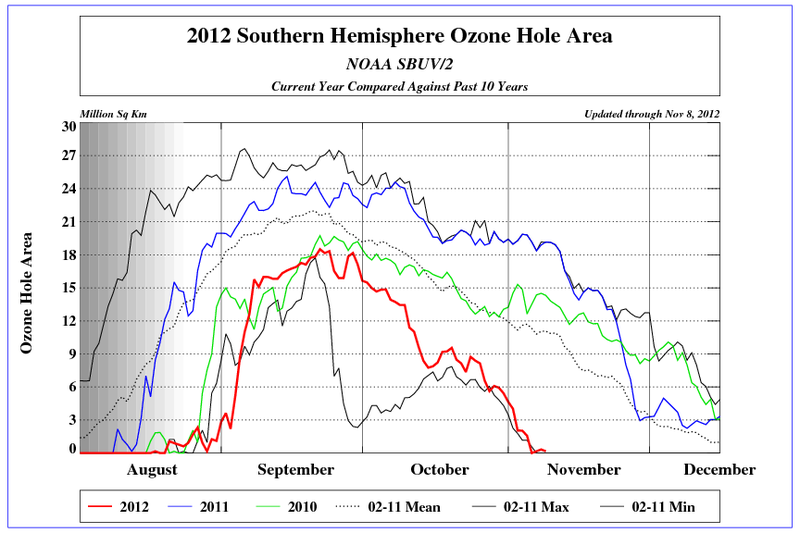 After this, thorough mixing occurs and ozone amounts are replenished. Time series of the size of the air colder than -78C (PSC-1) at 450K over the northern high latitudes. 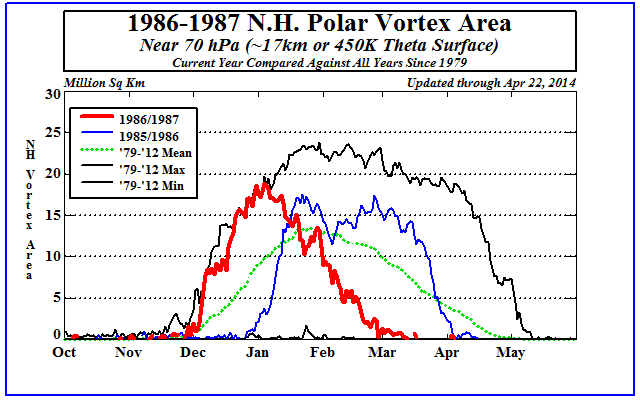 This figure shows the area within the polar vortex that has temperatures low enough to form Polar Stratospheric Clouds (PSCs). The ice crystals that make up these PSCs are where heterogeneous photo-chemical destruction of ozone take place. So as the area of low temperatures becomes larger, there is greater liklihood of PSCs forming. 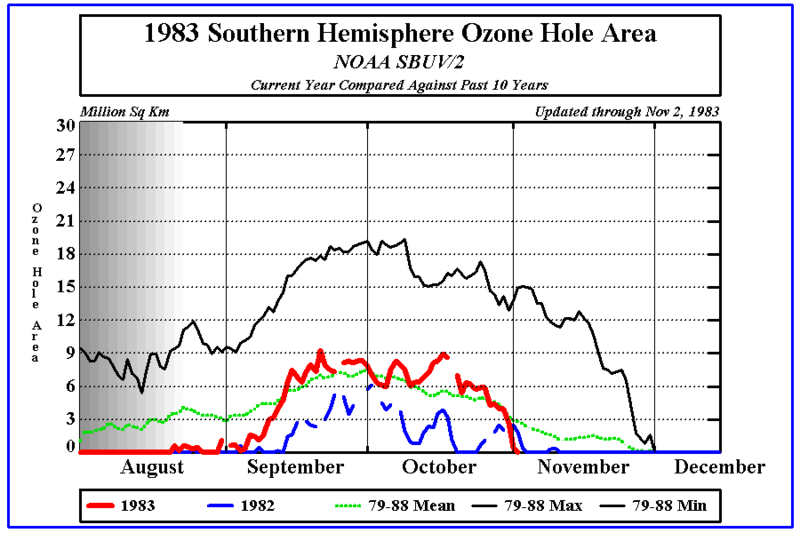 When this area becomes sunlit, enhanced ozone distruction takes place. 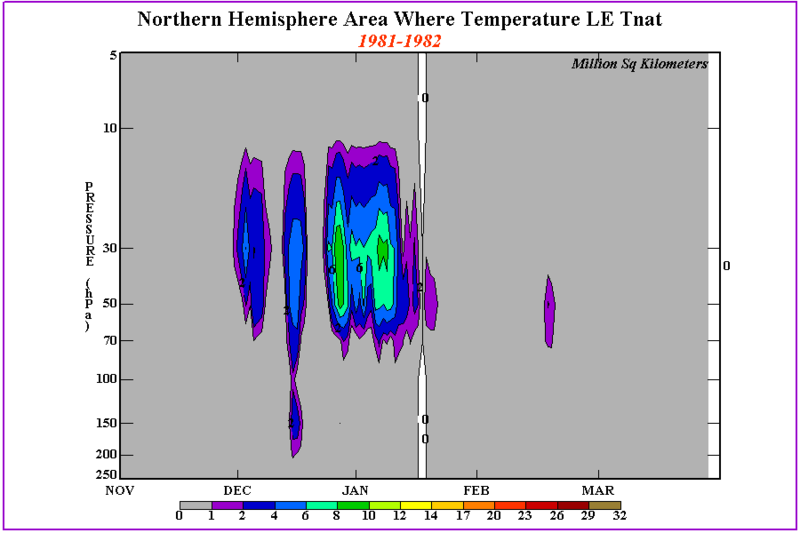 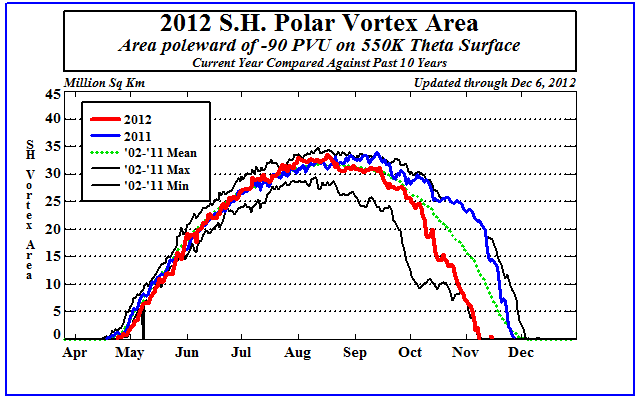 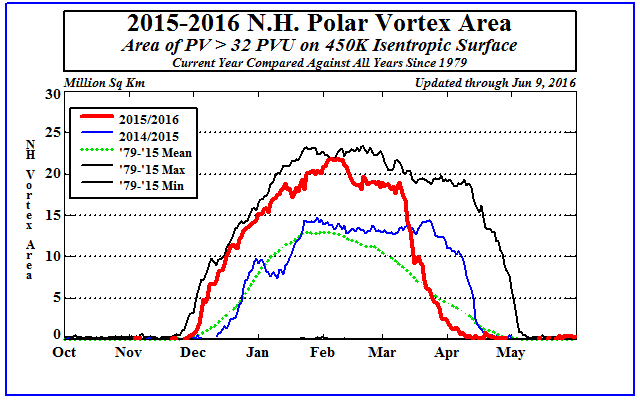 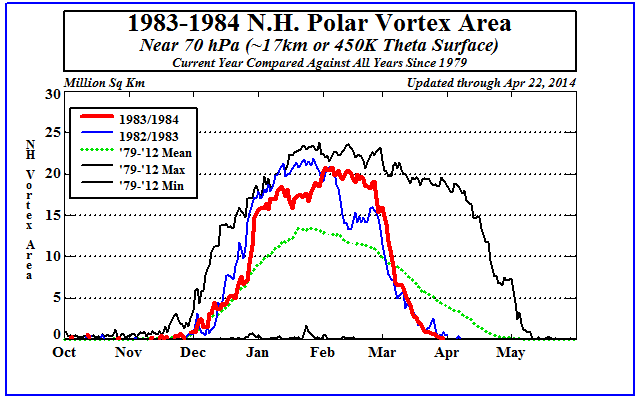 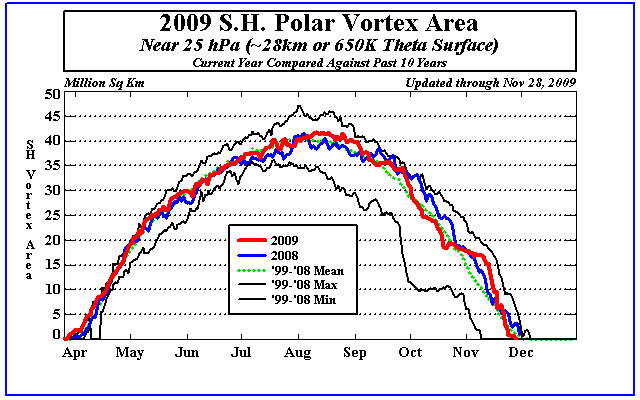 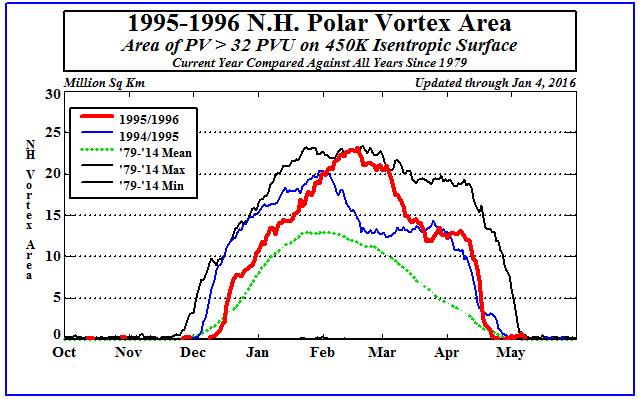 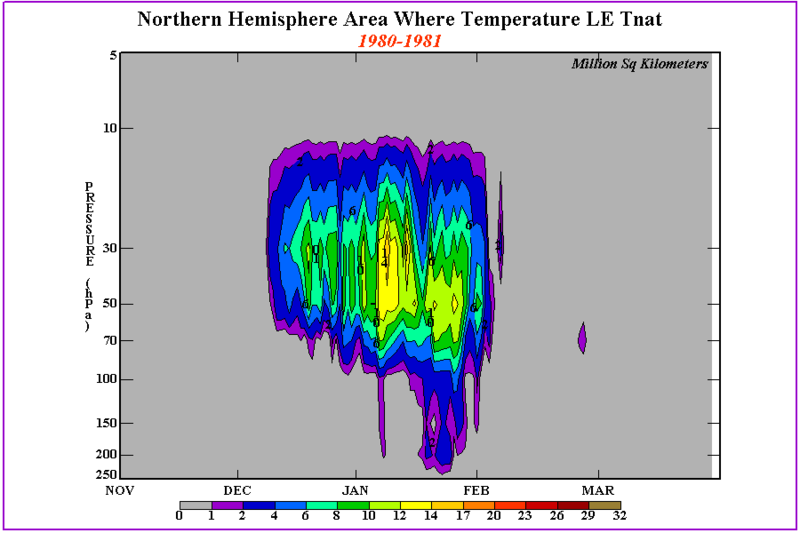 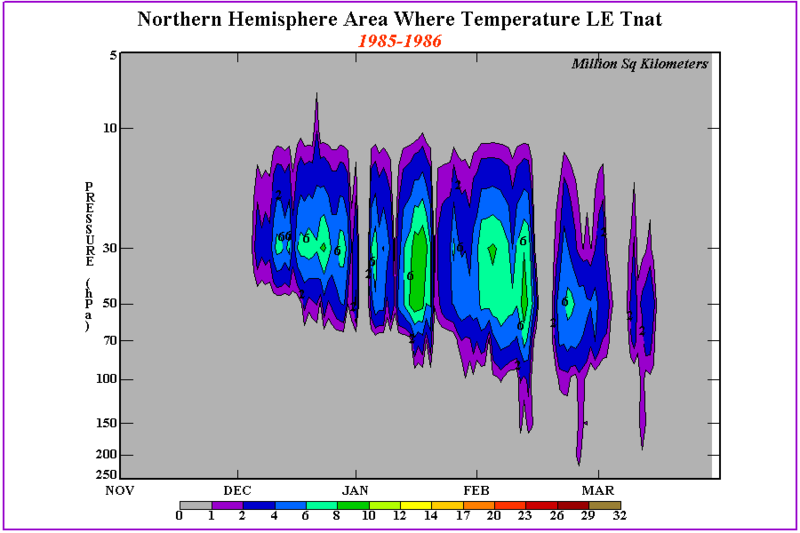 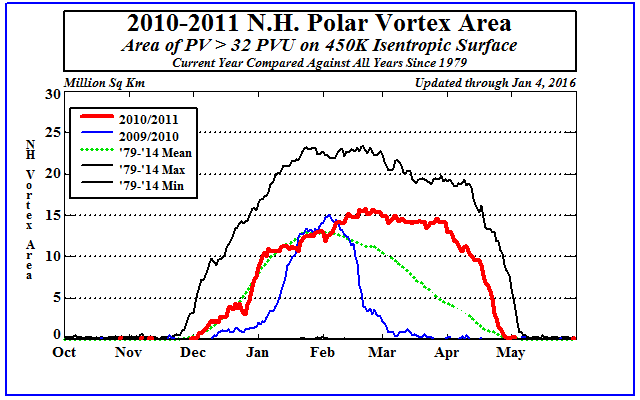 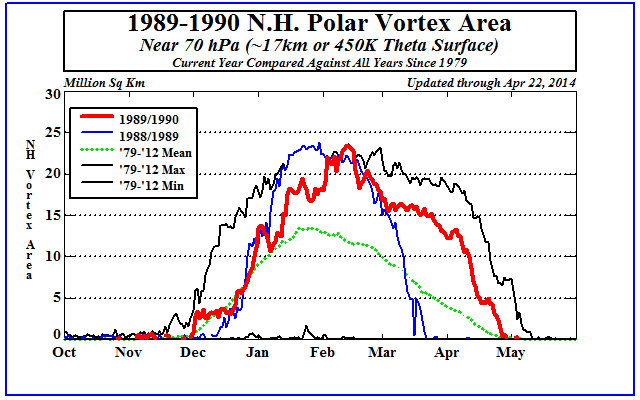 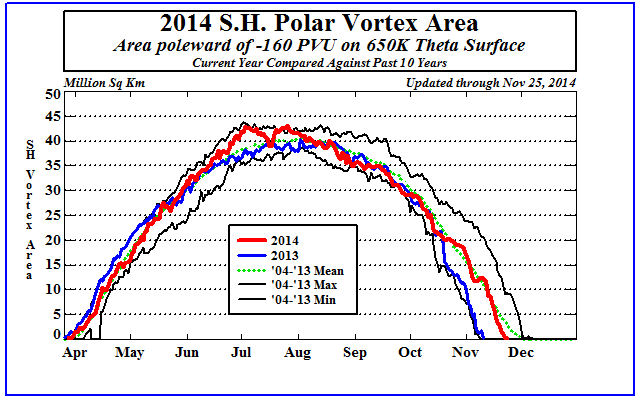 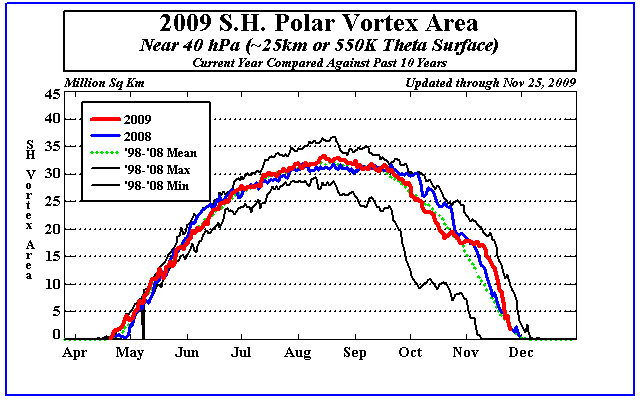 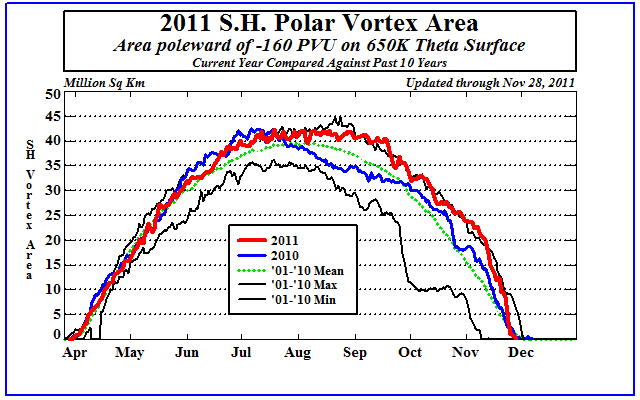 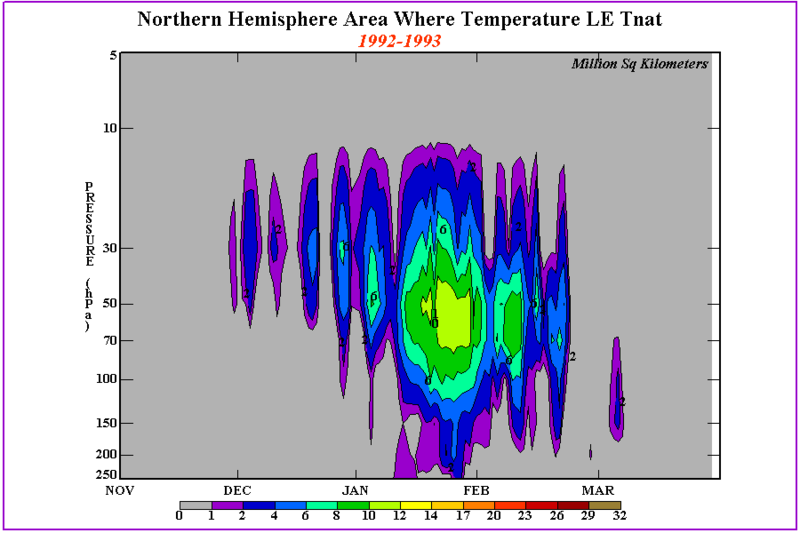 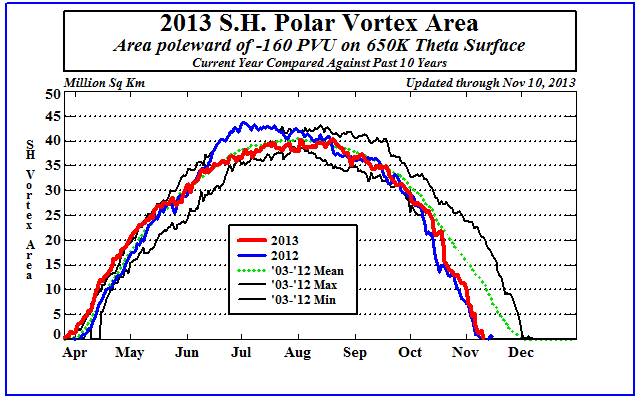 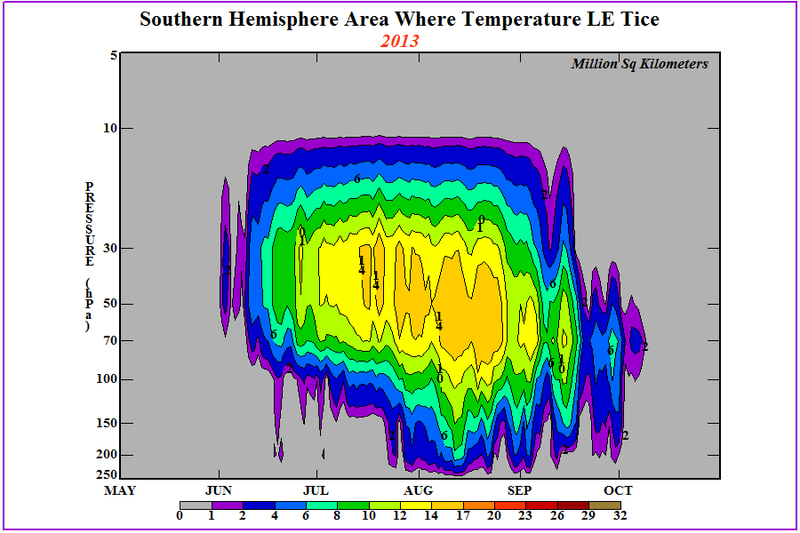 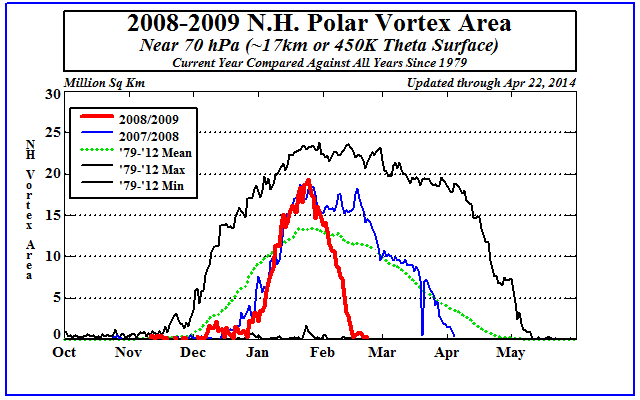 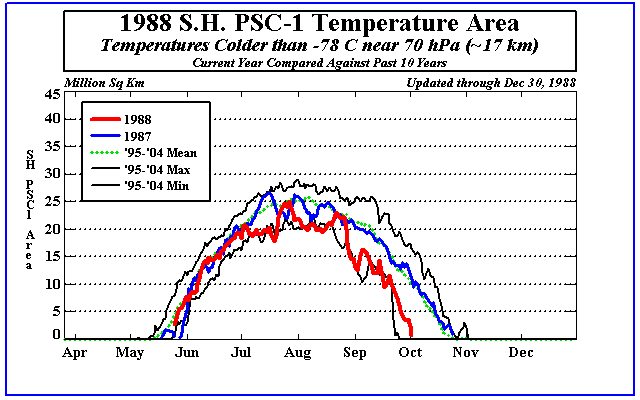 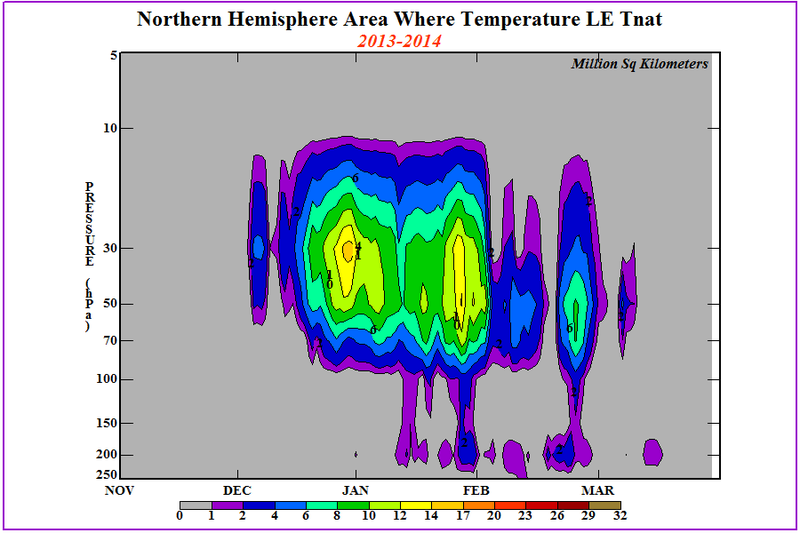 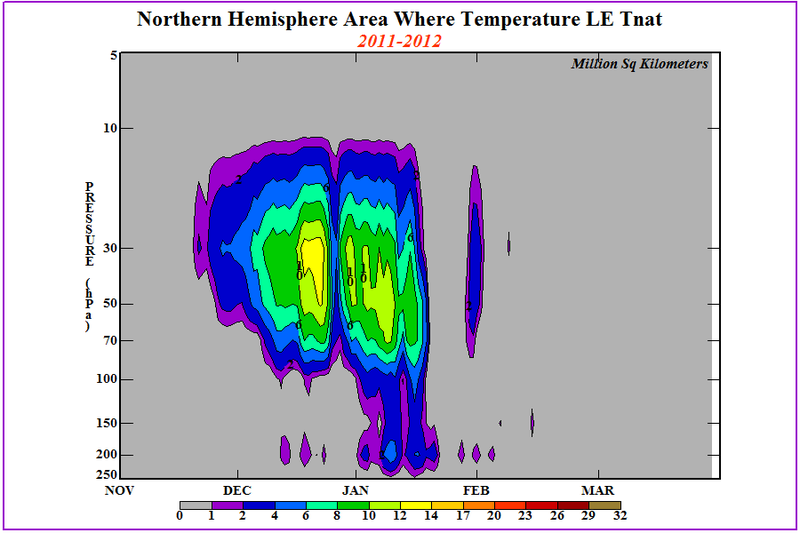 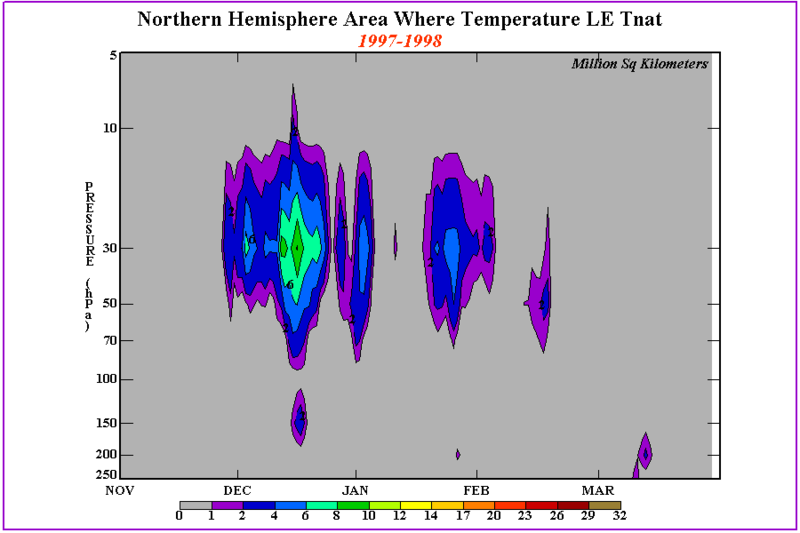 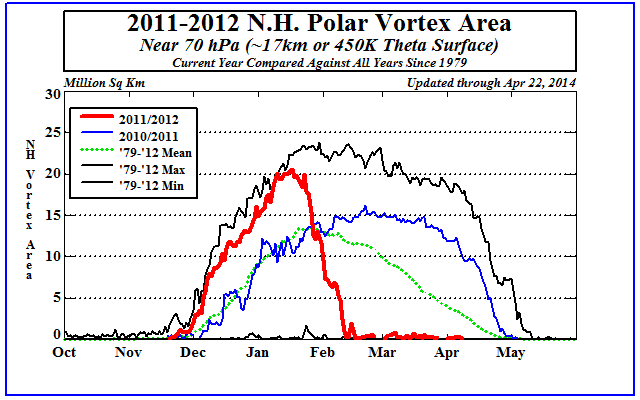 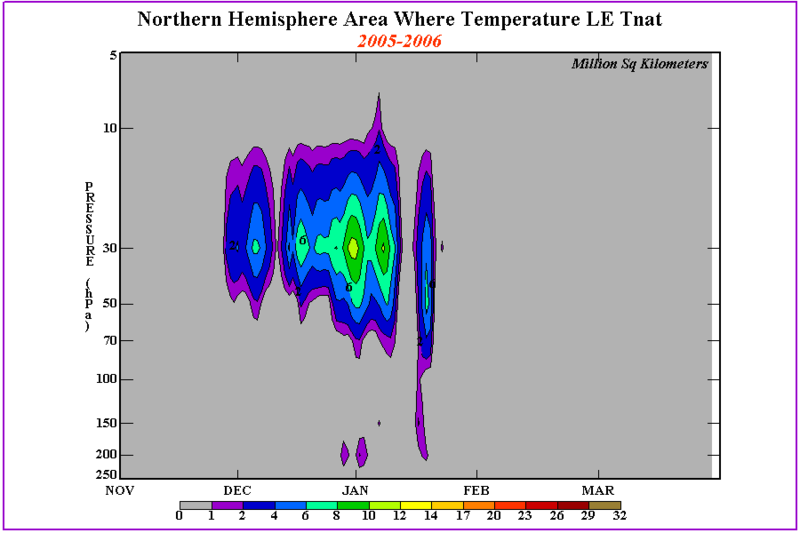 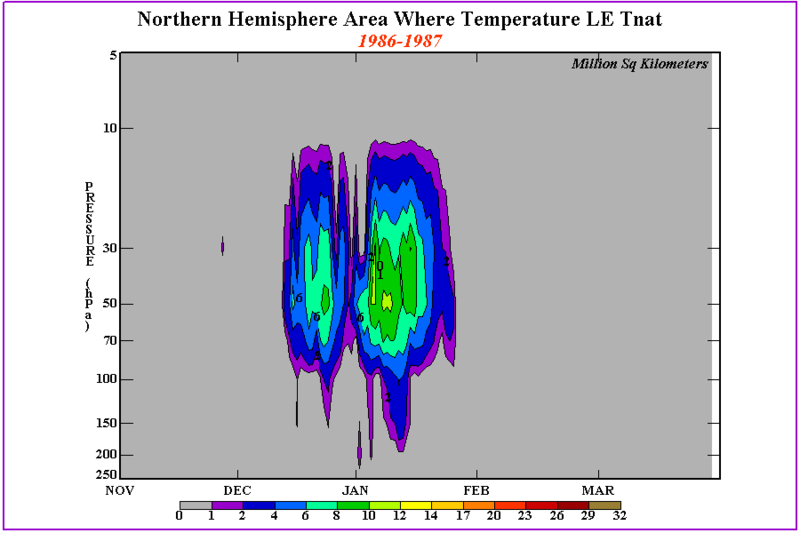 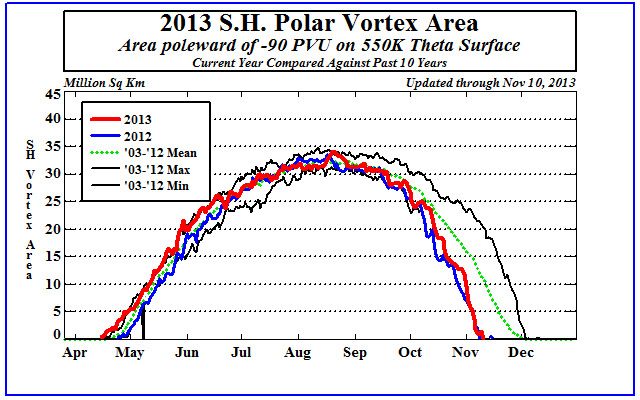 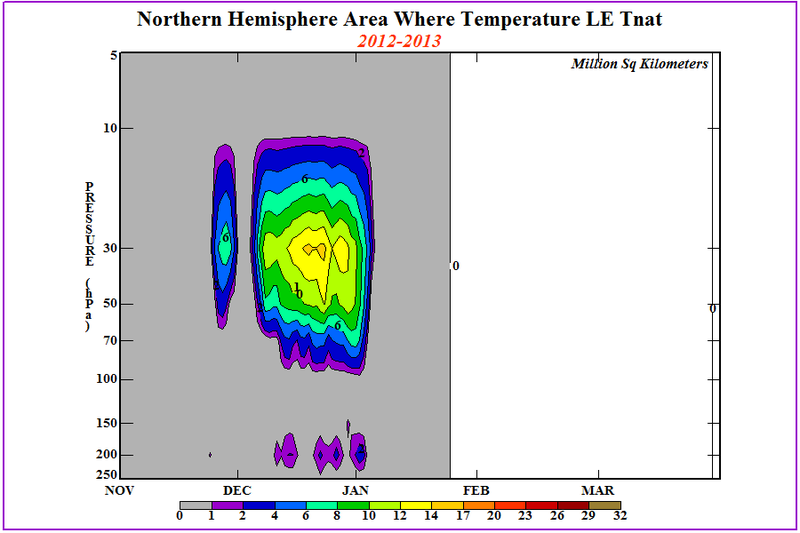 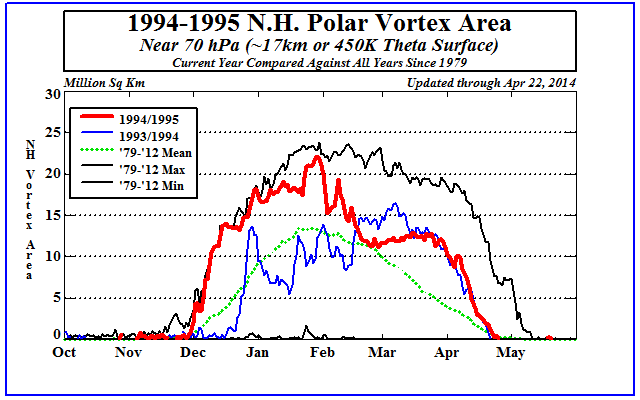 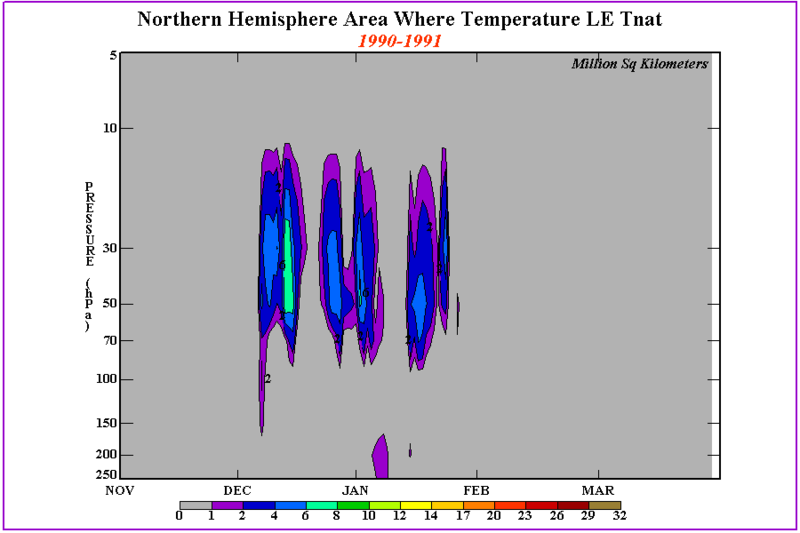 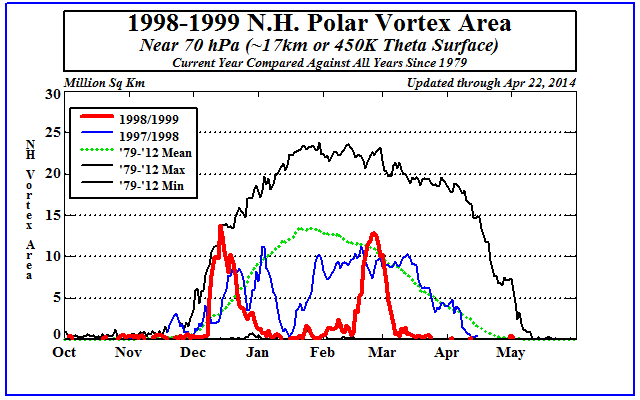 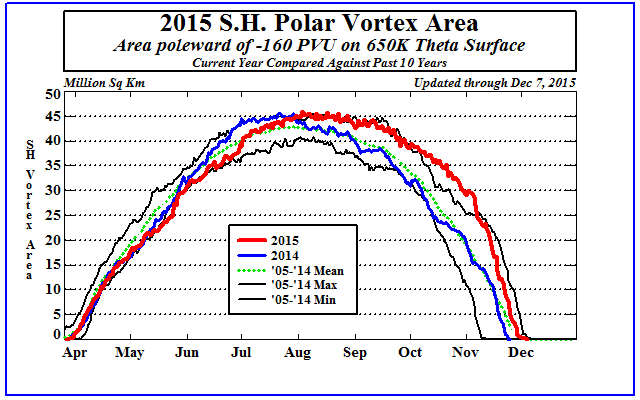 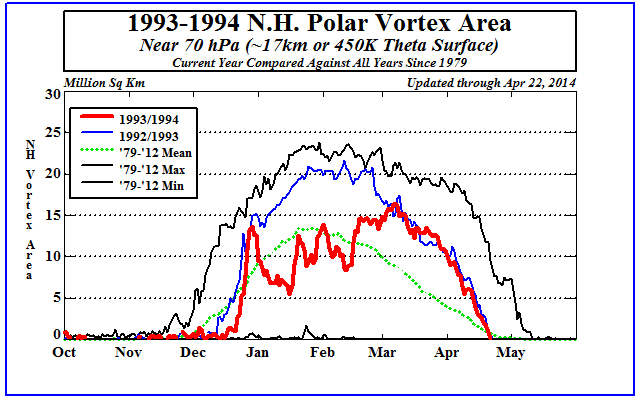 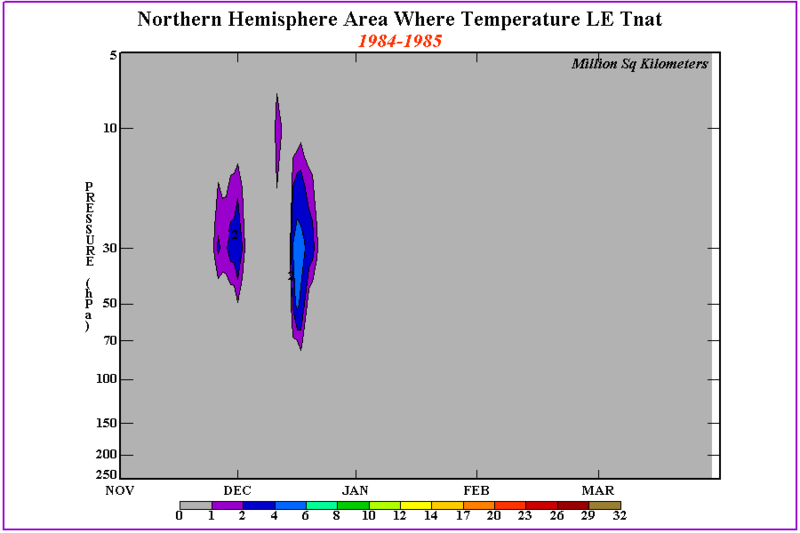 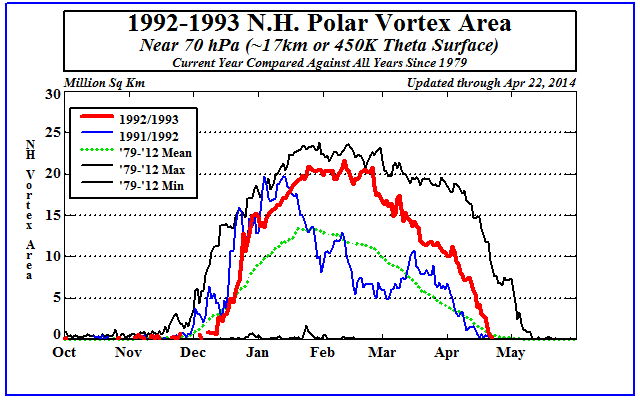 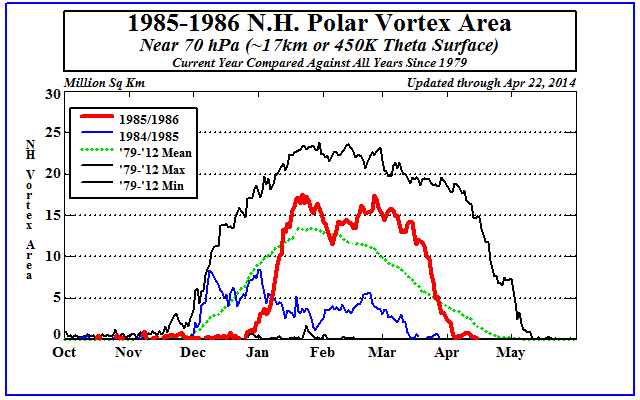 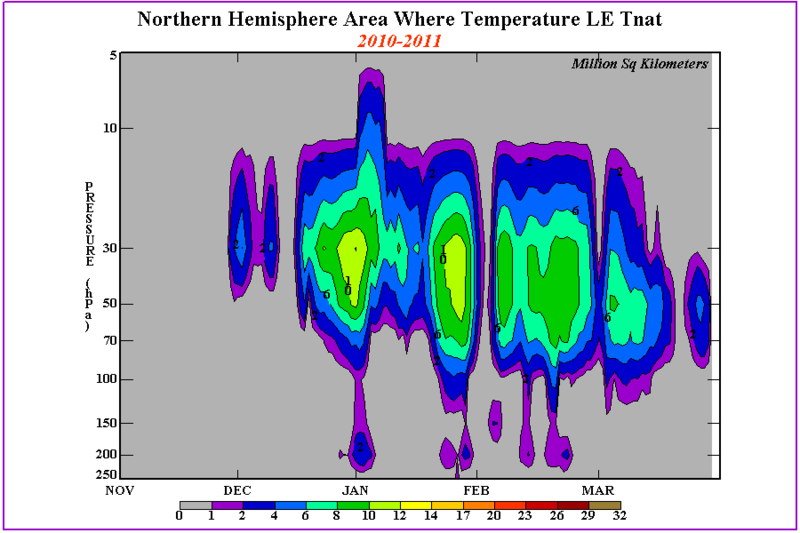 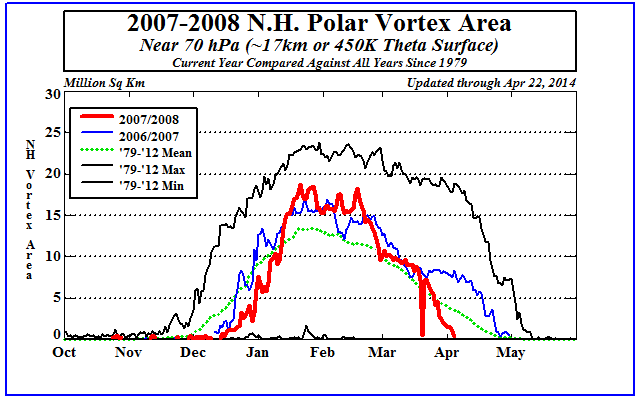 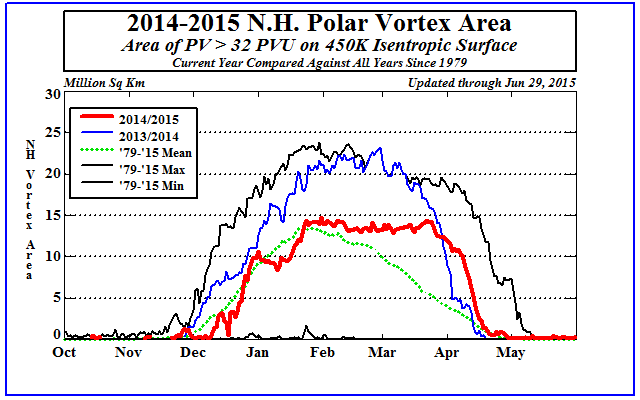 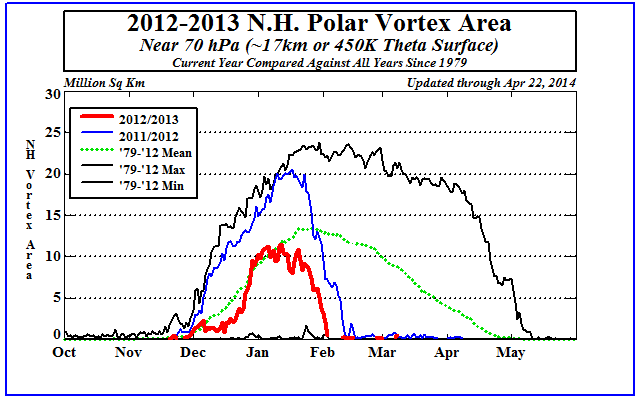 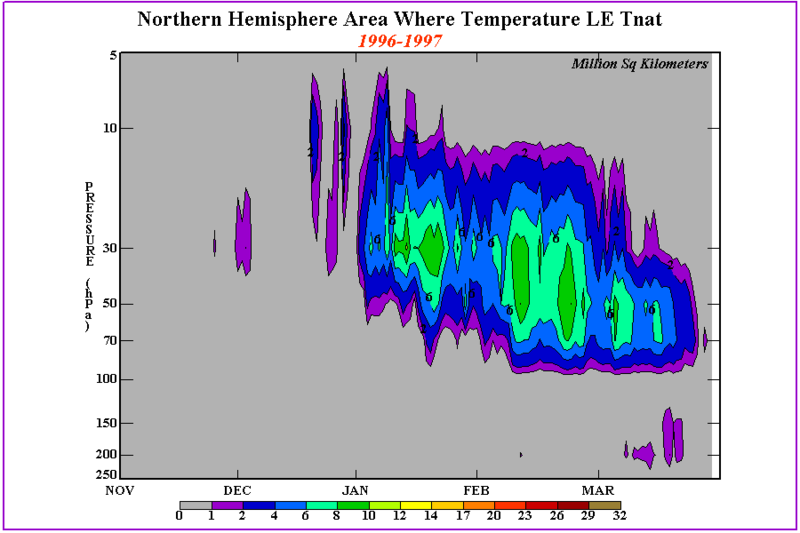 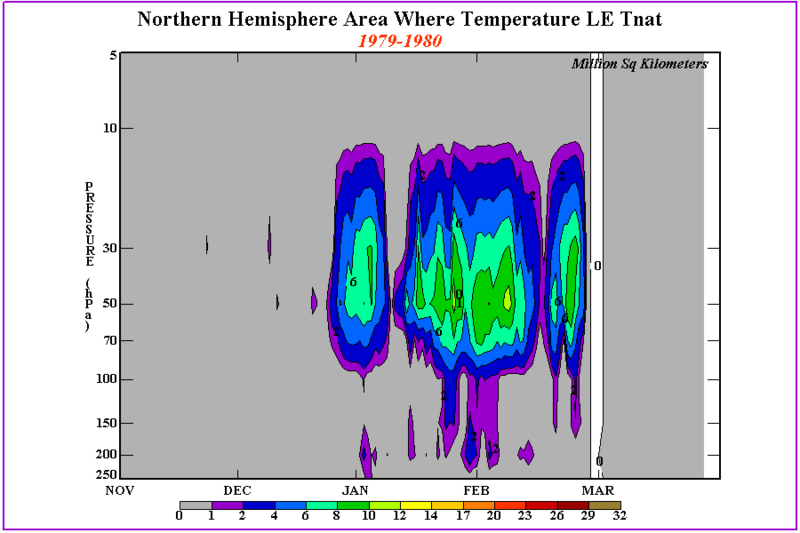 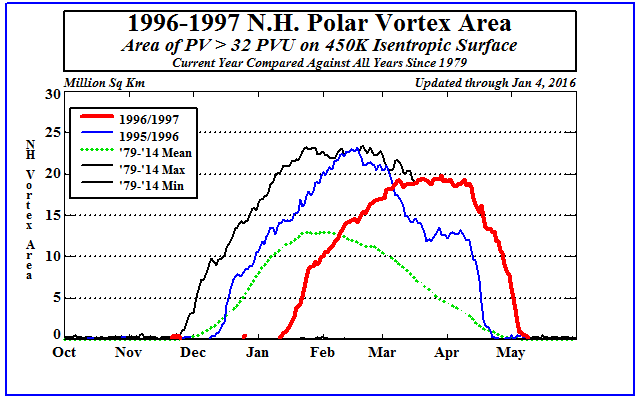 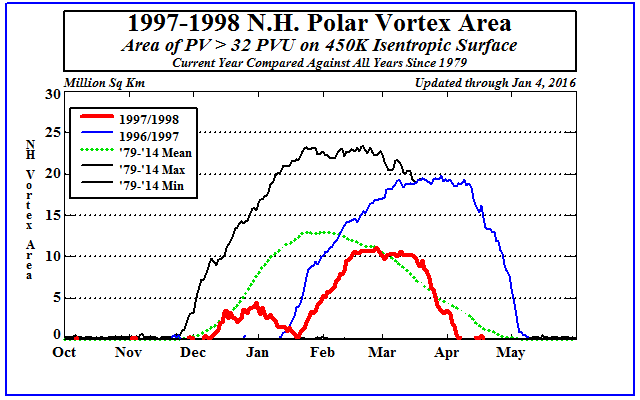 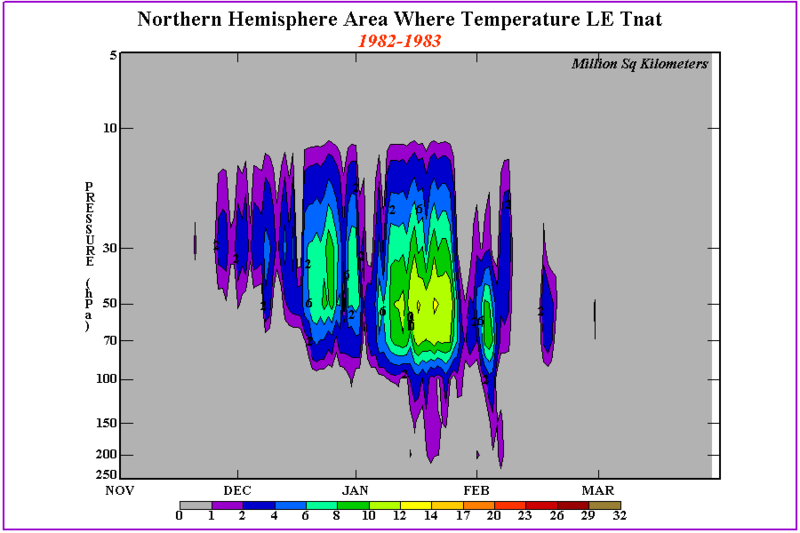 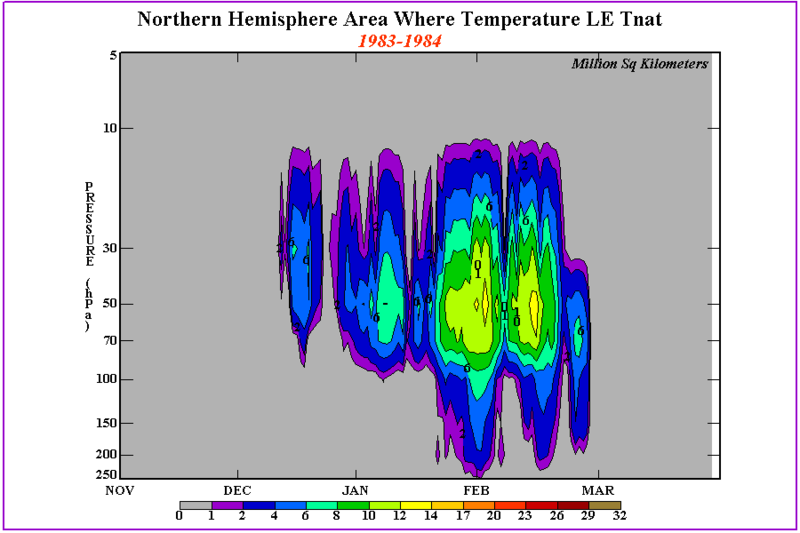 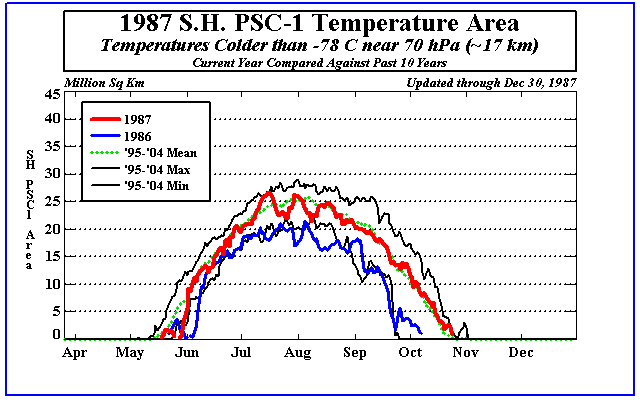 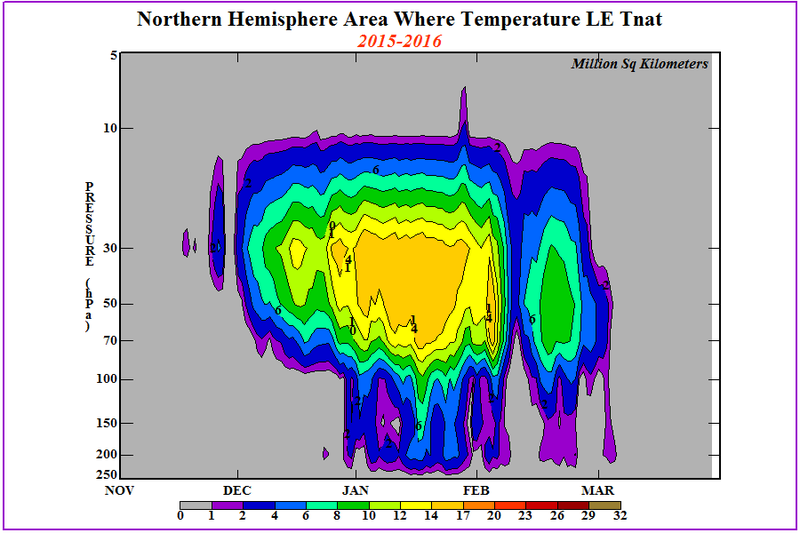 The variability of NH polar temperatures is much greater than over the SH polar region. Hence there is great year to year variability in PSC area. 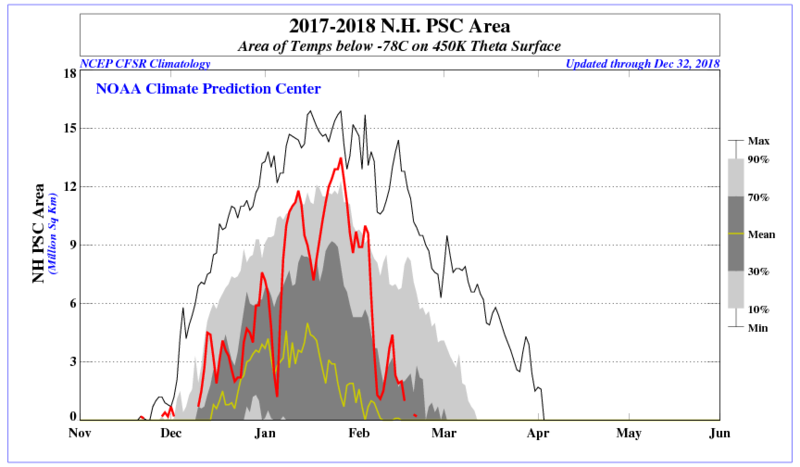 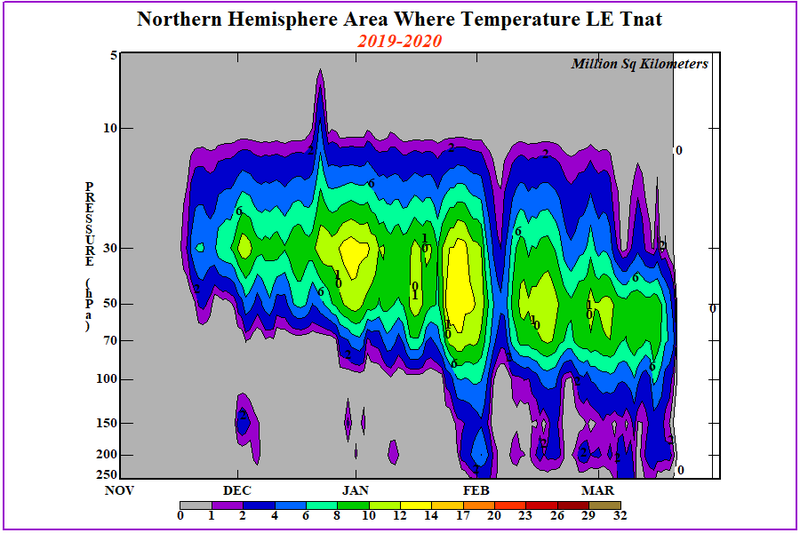 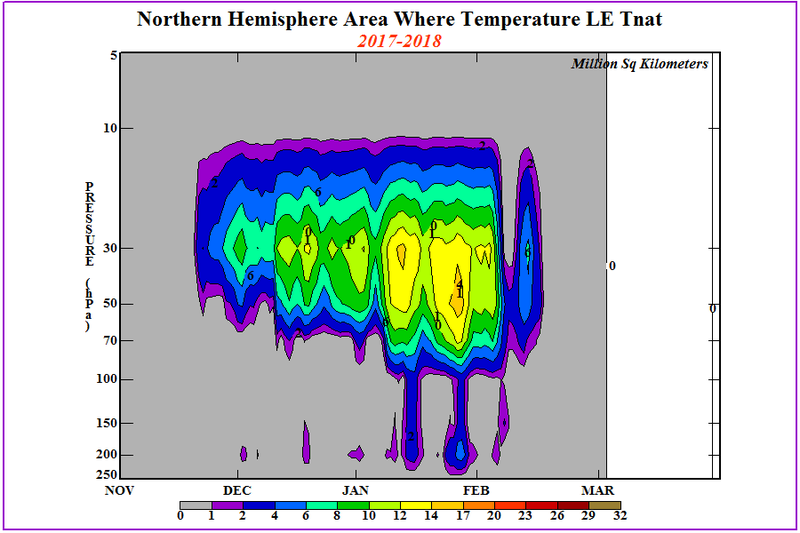 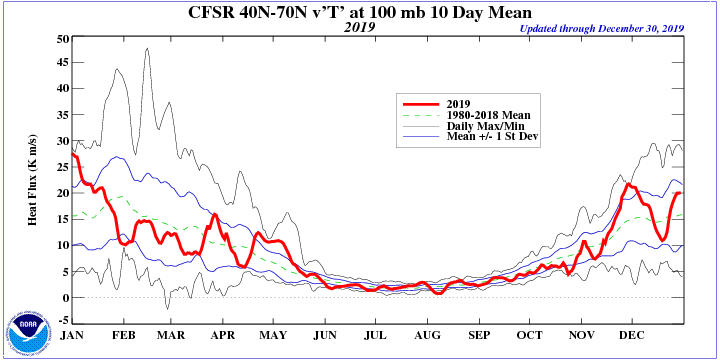 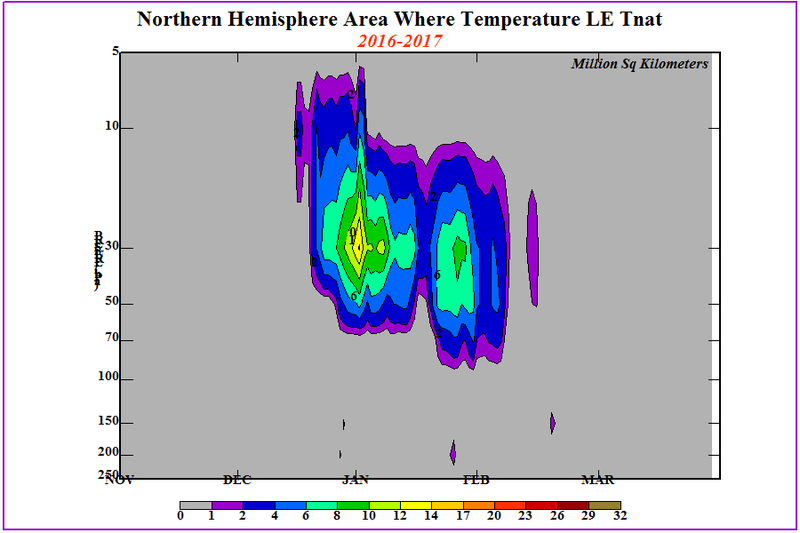 If a mid-winter stratospheric warming occurs, then the NH polar region warms and temperatures generally do not get below the -78C threshold the remainder of the winter. 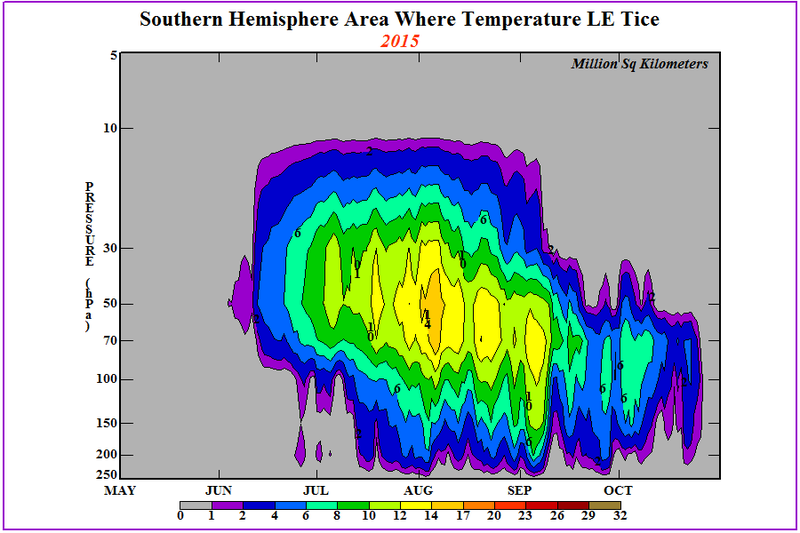 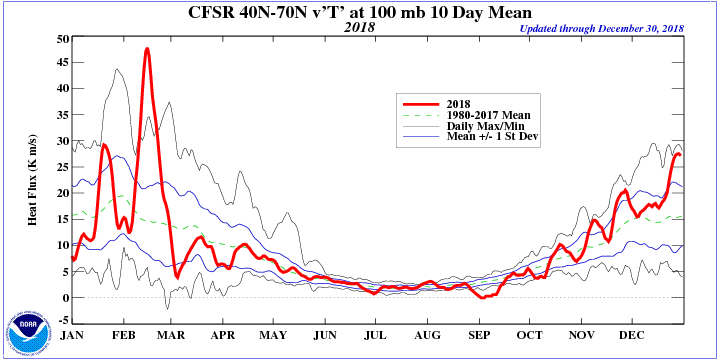 South Poleward eddy heat flux at 100mb. 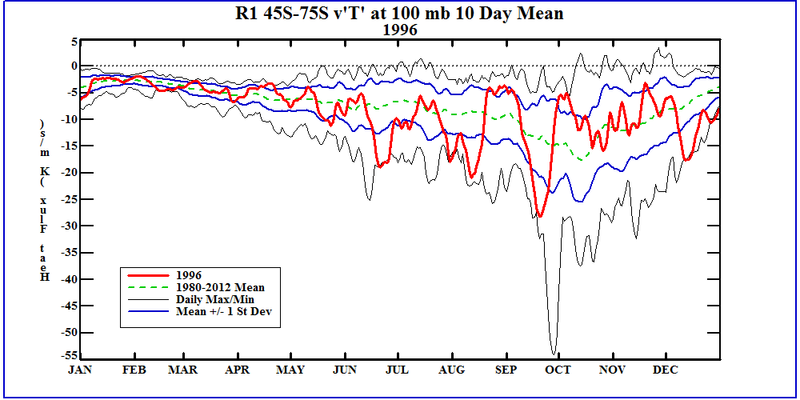 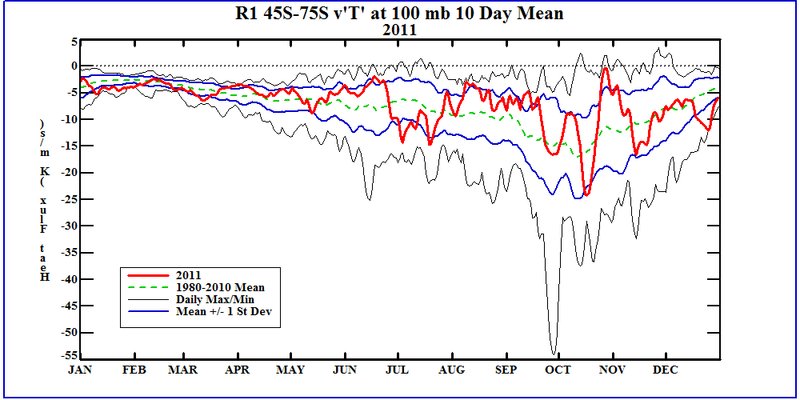 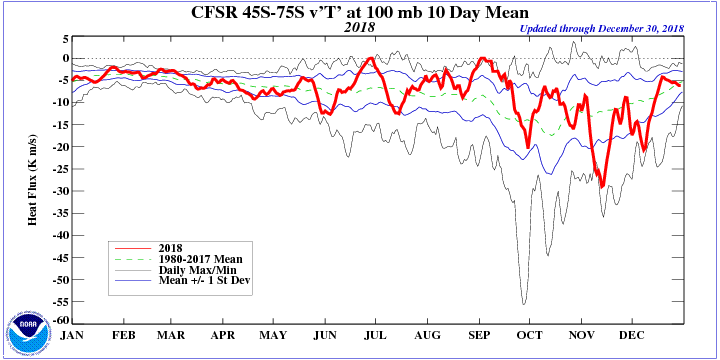 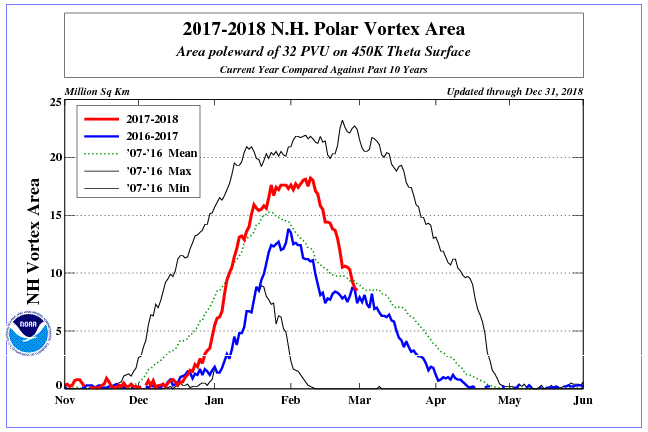 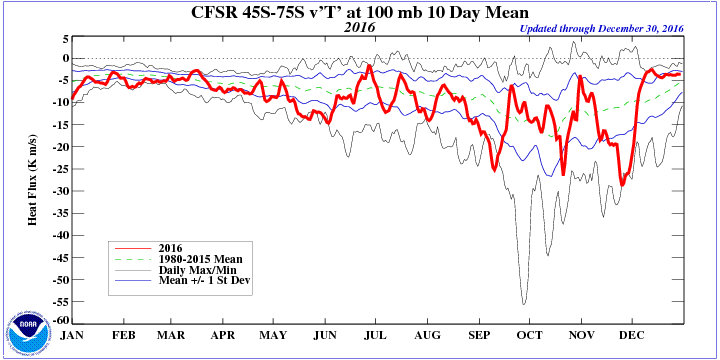 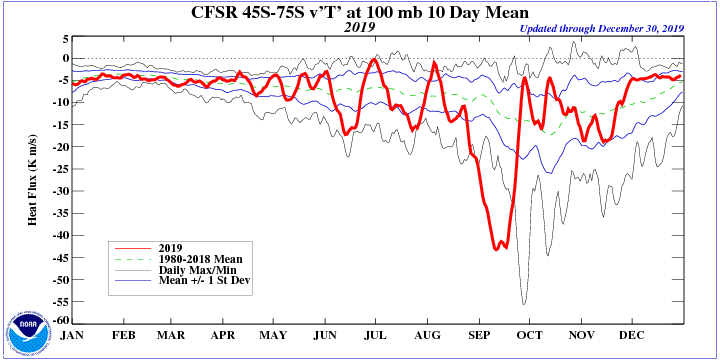 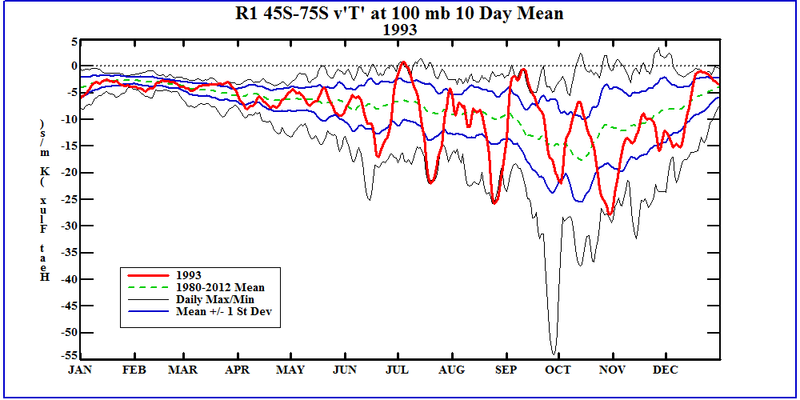 This time series shows the 10 day averaged eddy heat flux towards the South Pole at 100mb. 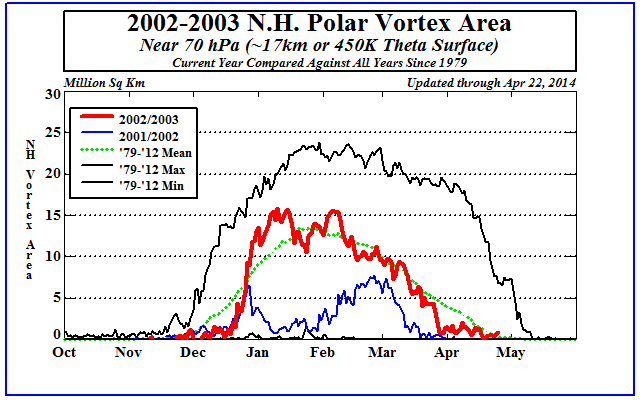 Strong negative fluxes indicate poleward flux of heat via eddies. 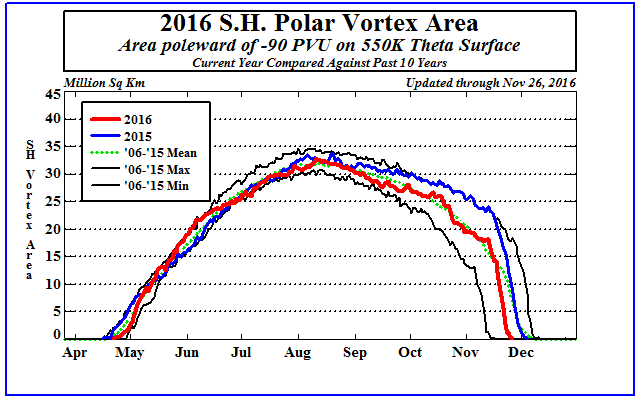 Multiple stong poleward episodes will result in a smaller polar vortex and an ealier transition from winter to summer circulations. 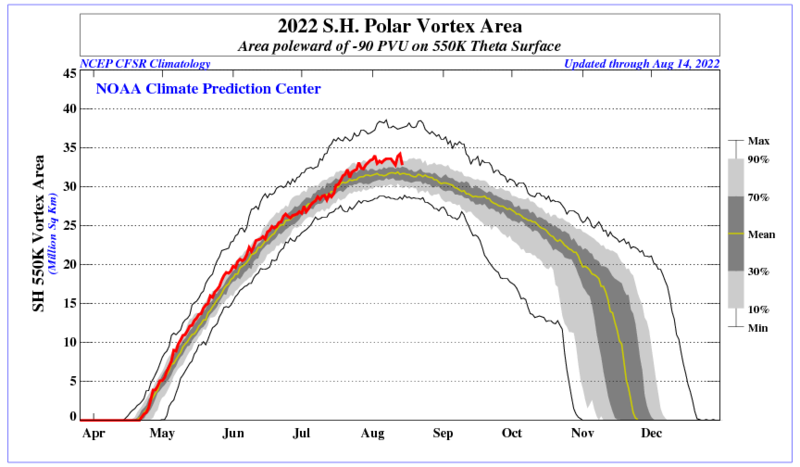 Relatively small flux amplitudes will result in a more stable polar vortex and will extend the winter circulation well into November and December. 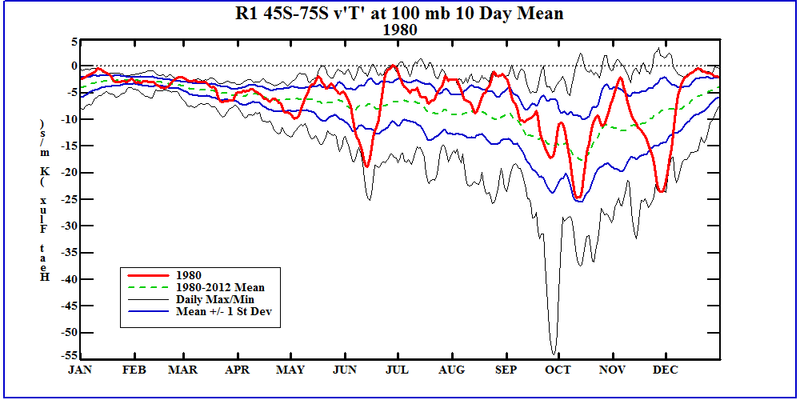 SH Polar Temperatures Relationship with Eddy Heat Flux. 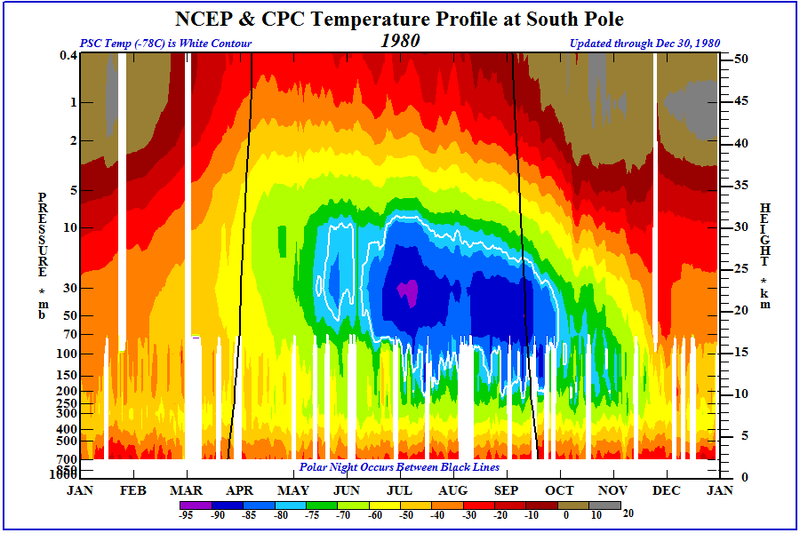 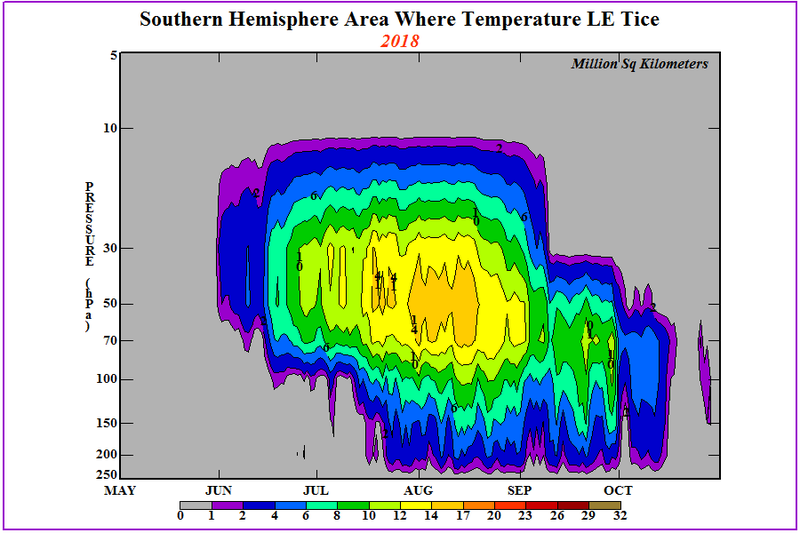 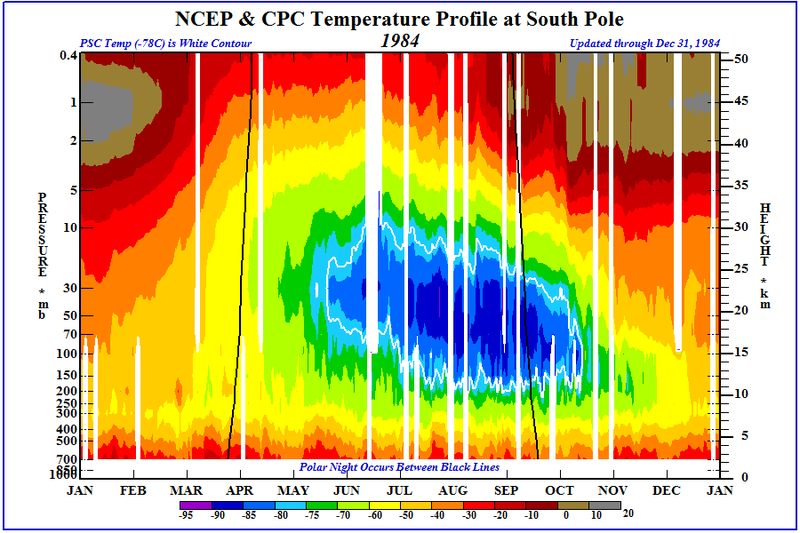 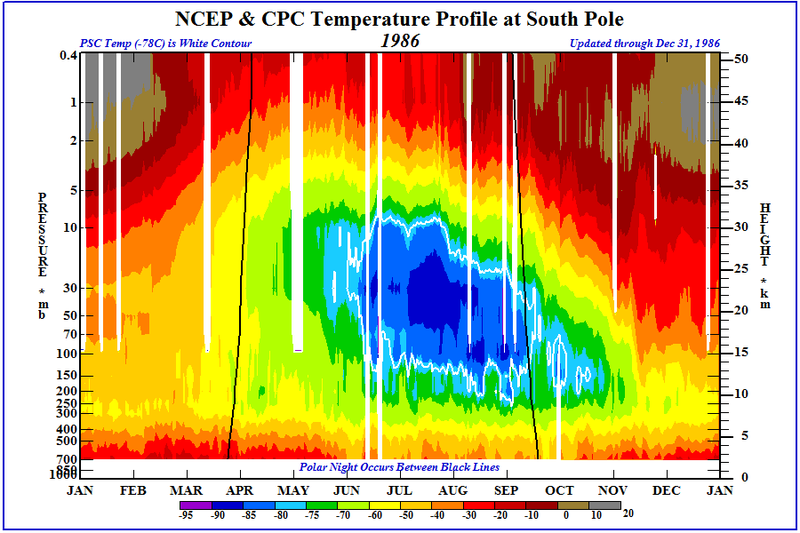 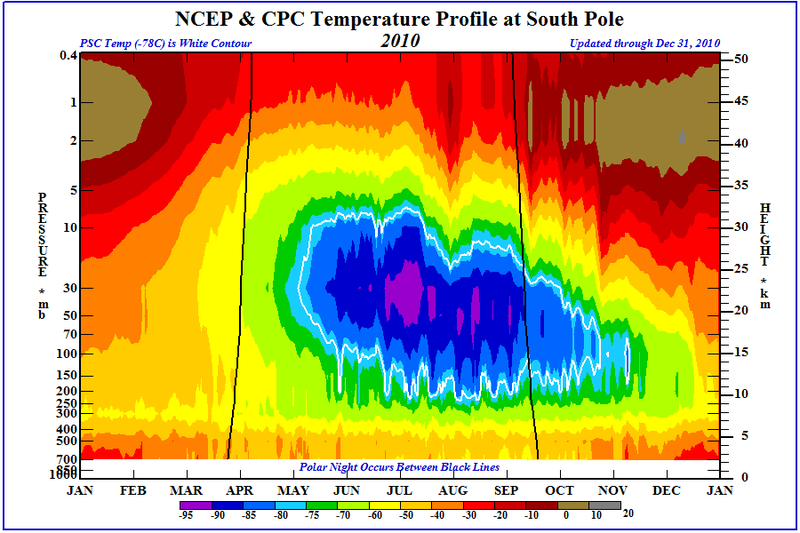 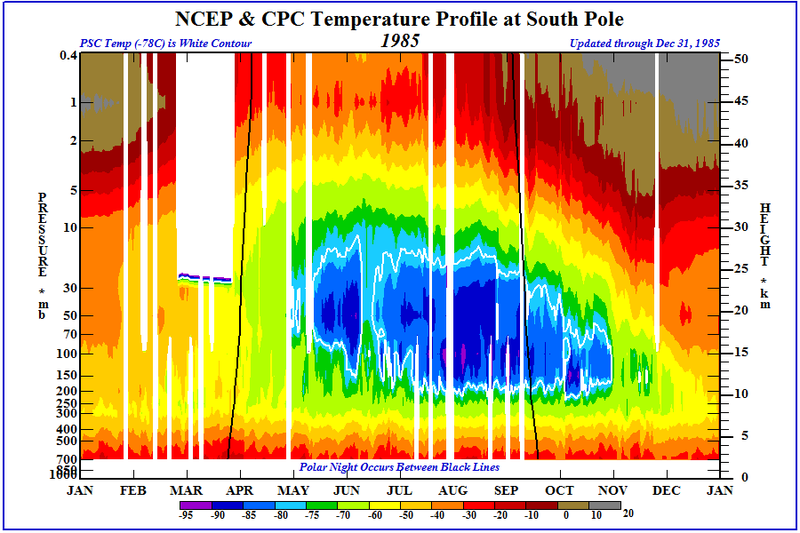 This plot shows the strong relationship between the July-August-September eddy heat flux towards the South Pole at 100hPa and the late September SH polar temperatures at 50hPa. 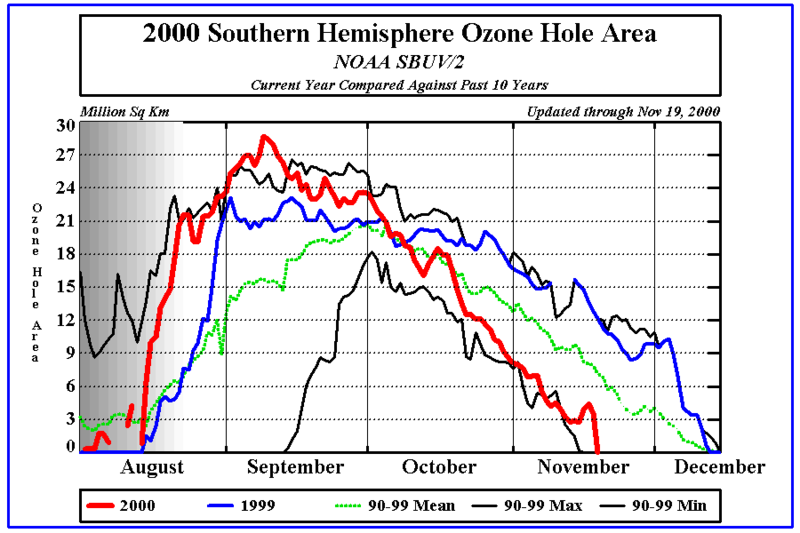 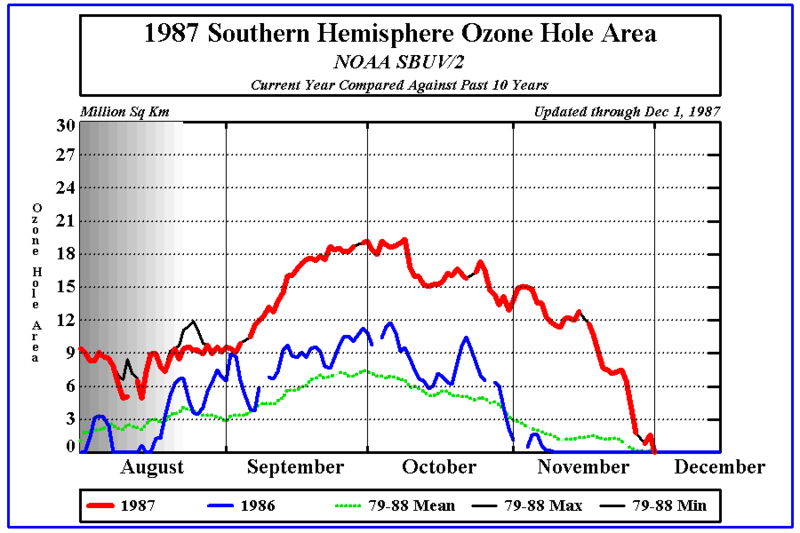 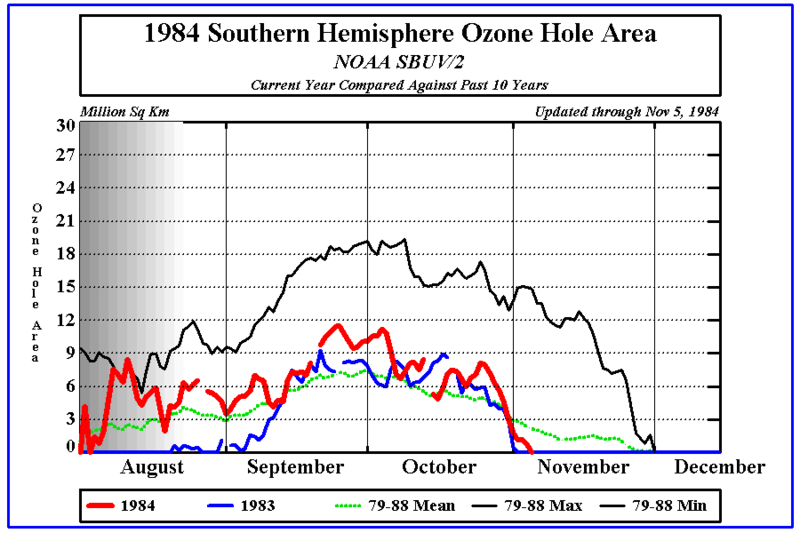 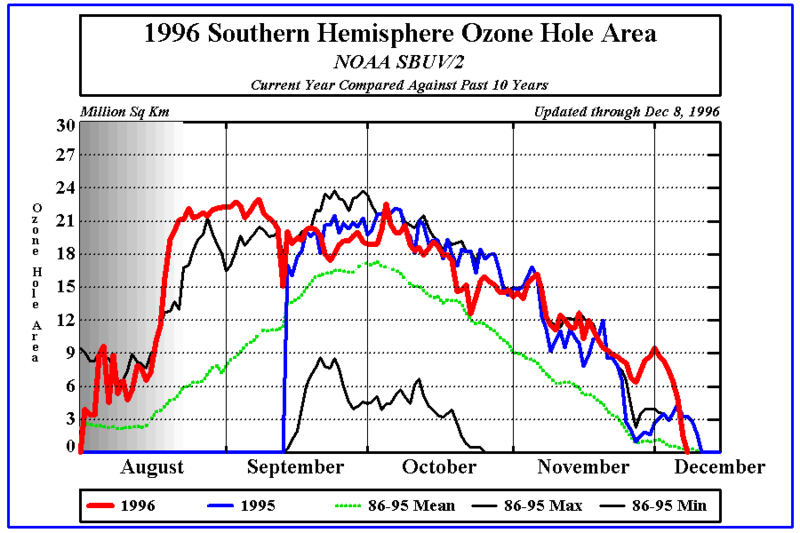 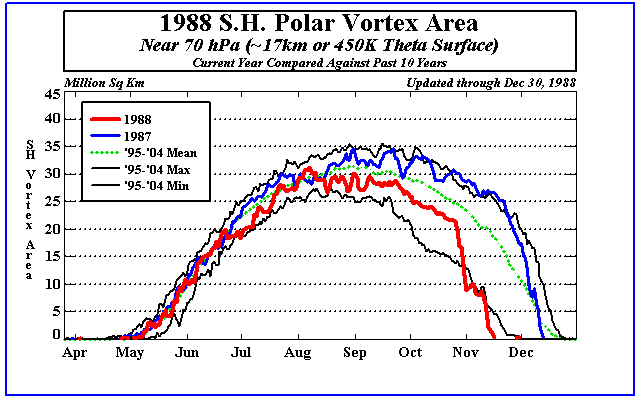 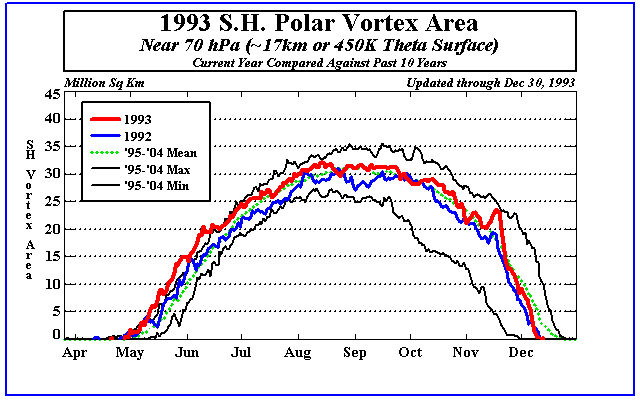 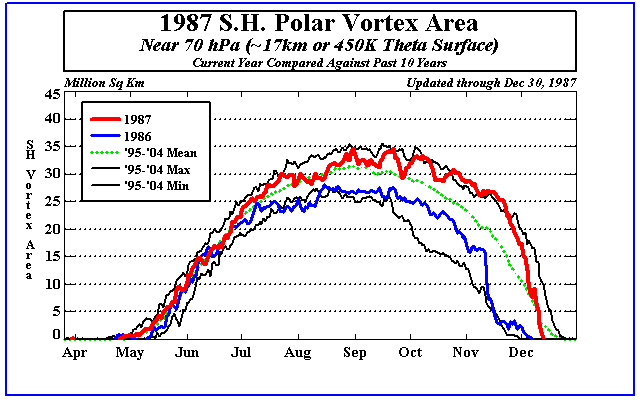 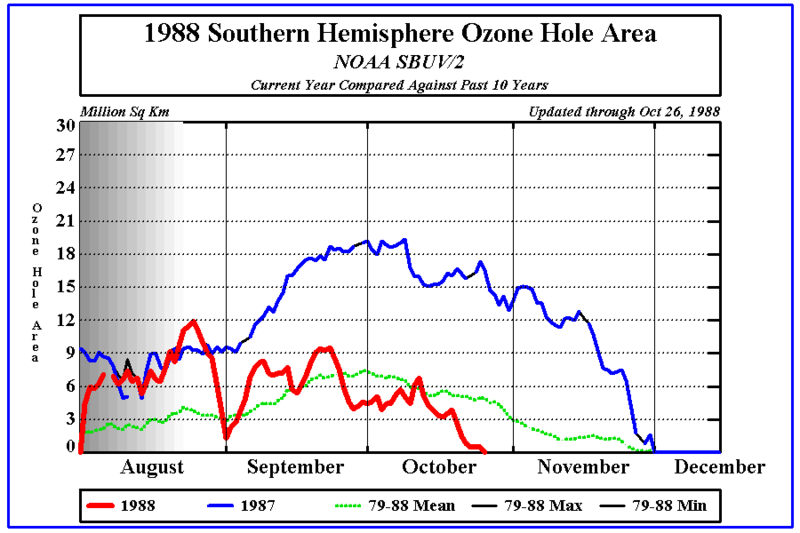 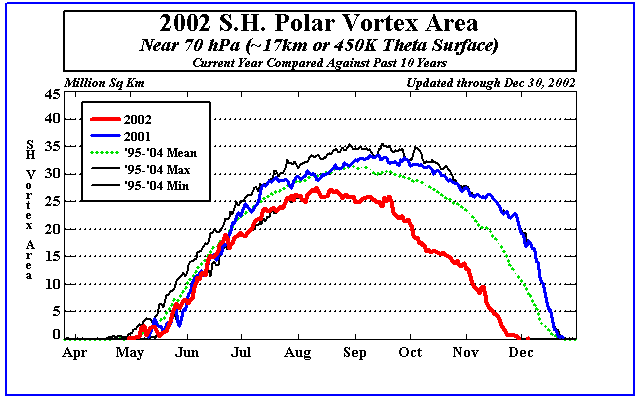 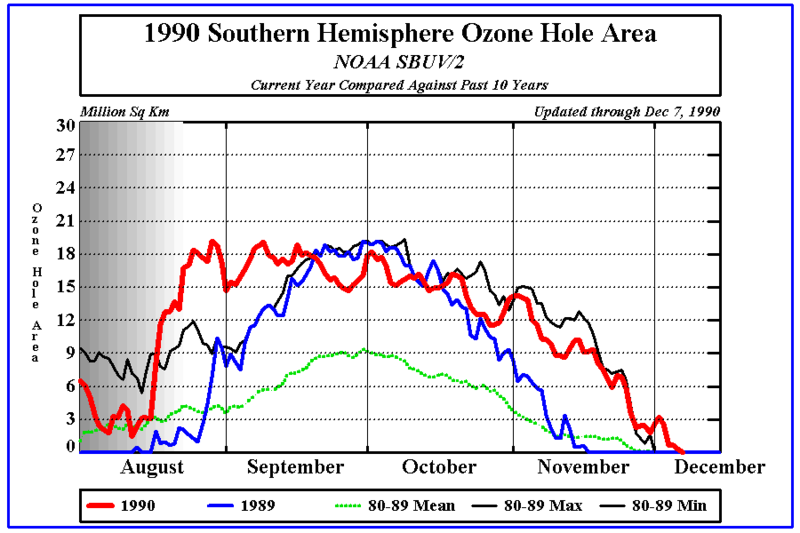 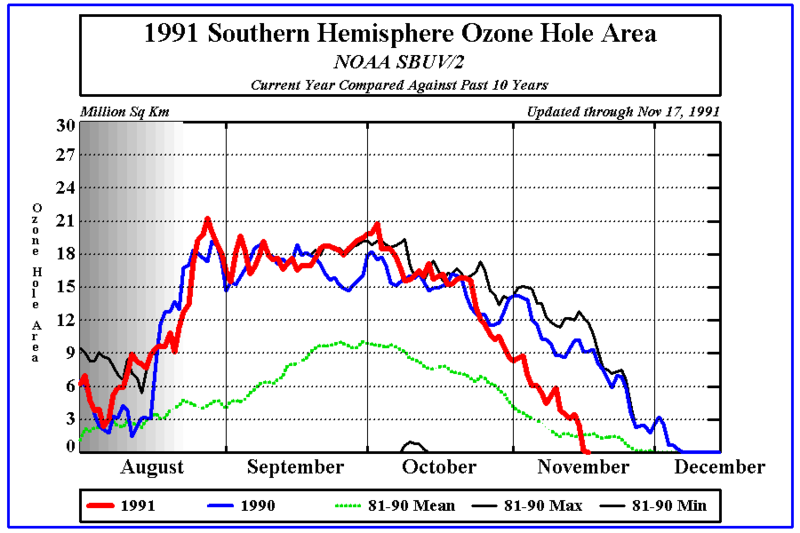 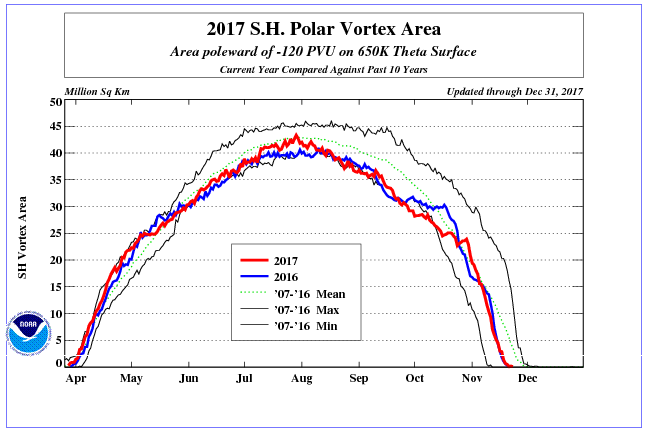 The late September SH polar temperatures control how much ozone is depleted and the ozone hole size and volume. 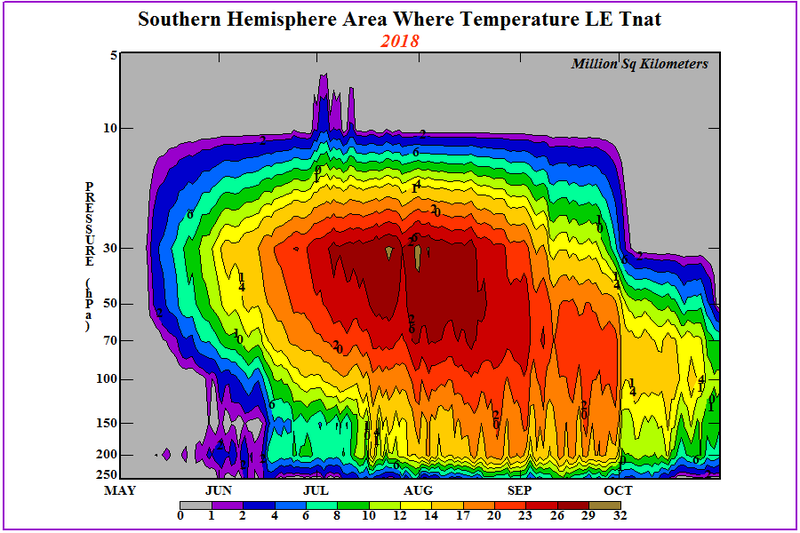 The colder the temperatures, the greater the likelyhood of Polar Stratospheric Clouds to form and the greater amount of photochemical distruction of ozone by activated chlorine molecules. 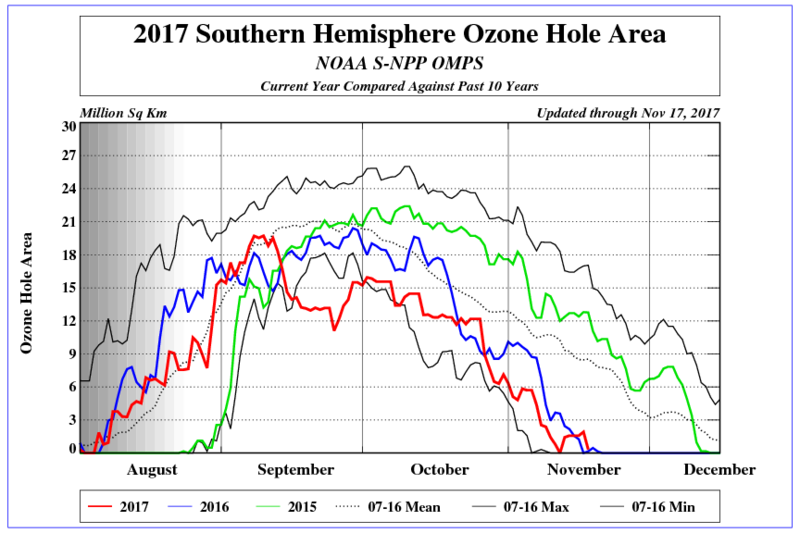 The 2016 relationship is shown as the blue diamond. 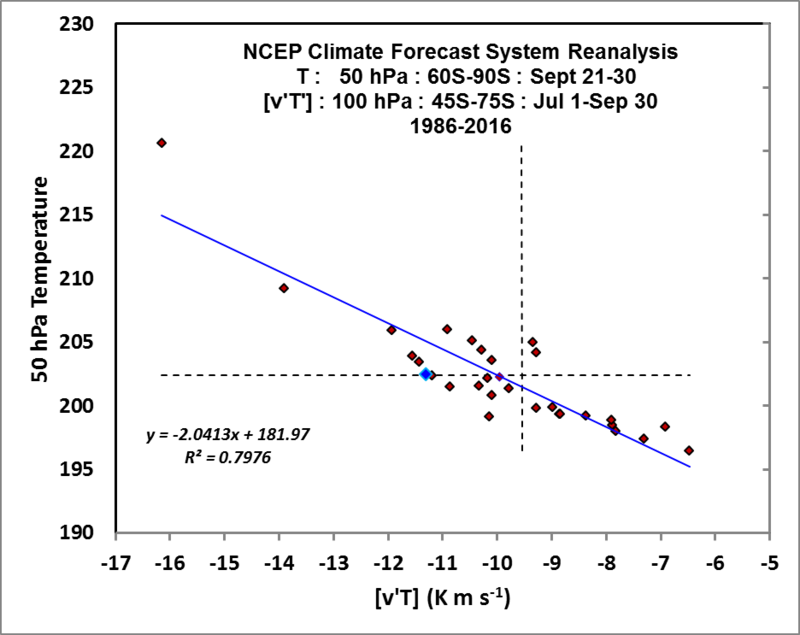 The 1986-2016 means of the 50hPa Temp and V'T' are shown as the horizontal and vertical lines, respectively. 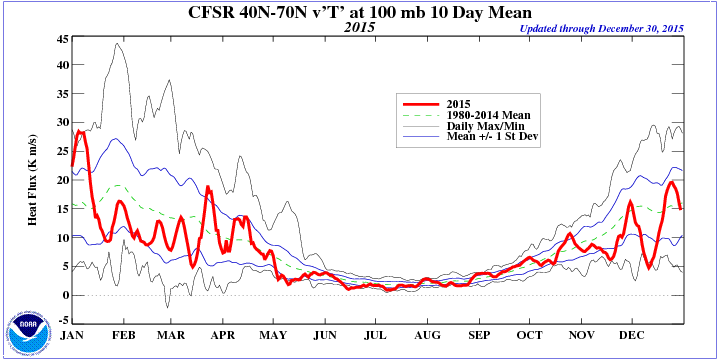 North Poleward eddy heat flux at 100mb. 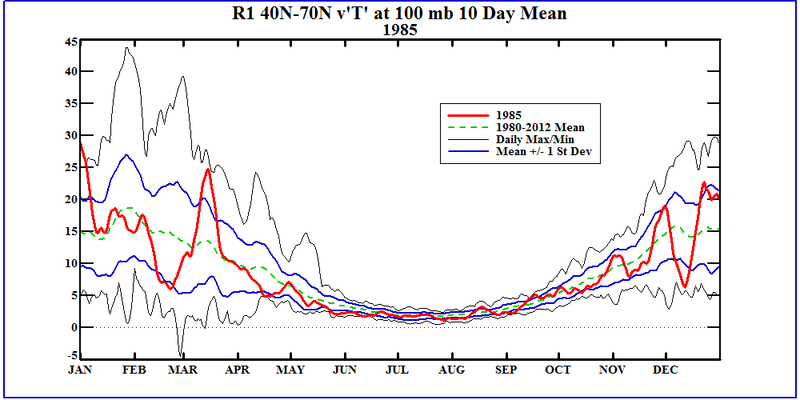 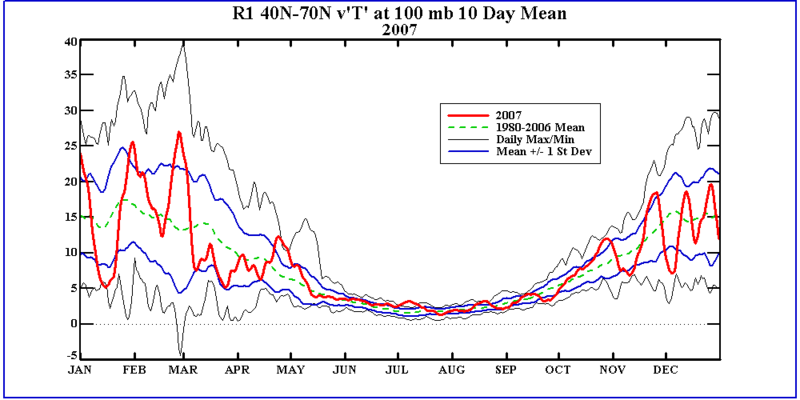 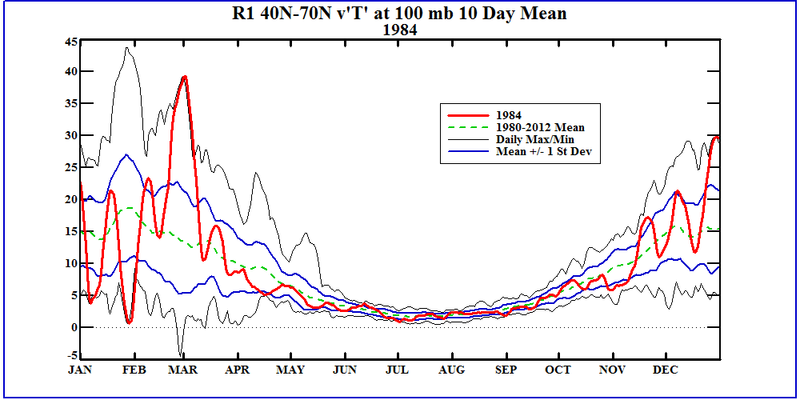 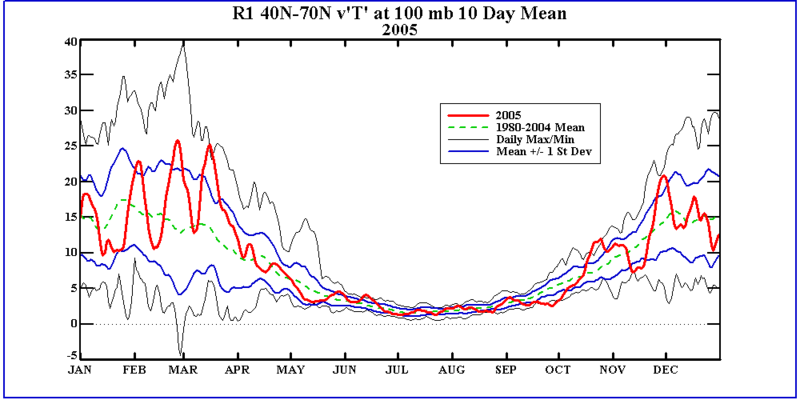 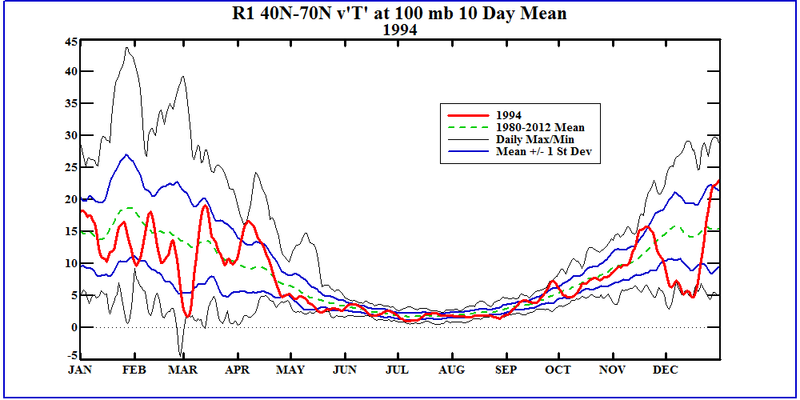 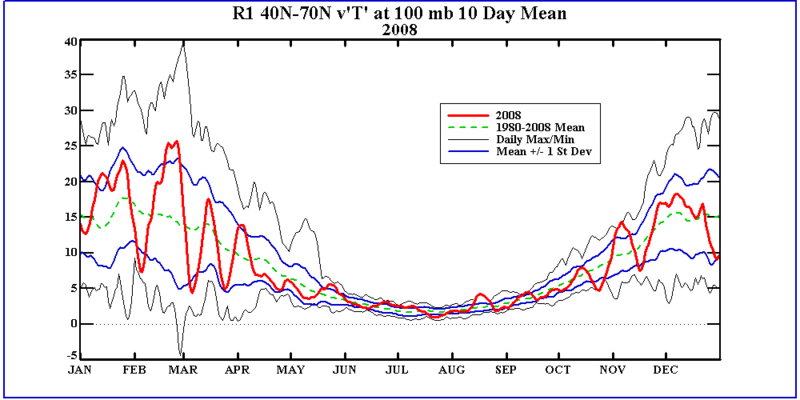 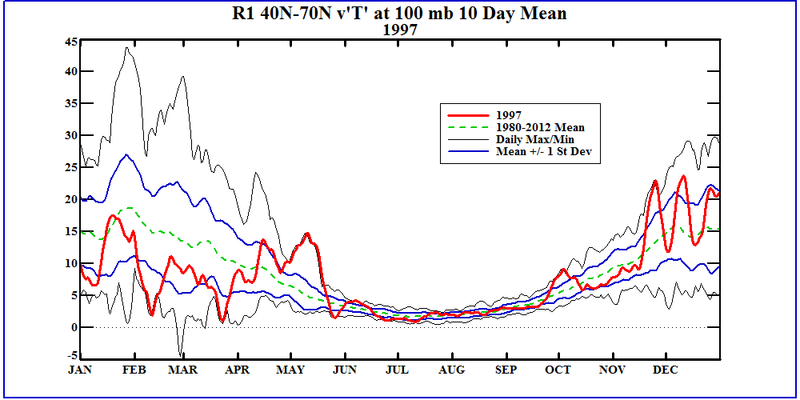 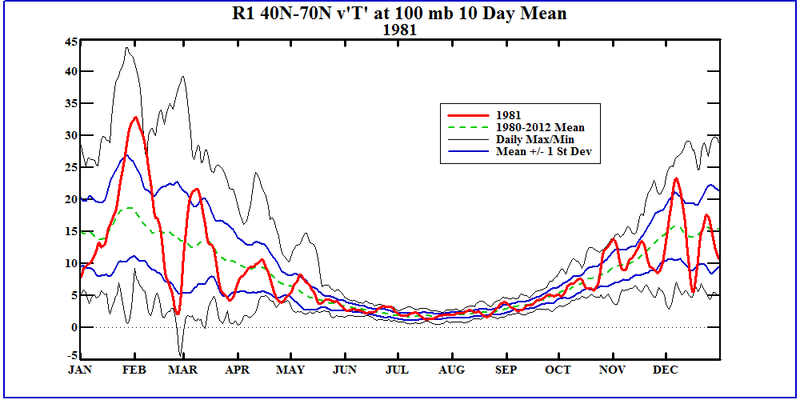 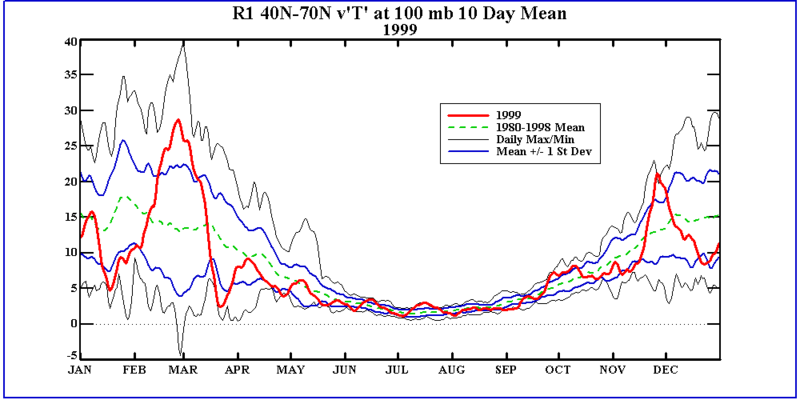 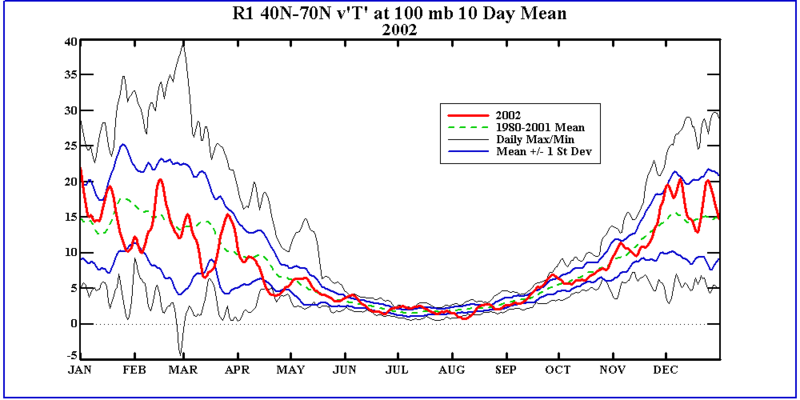 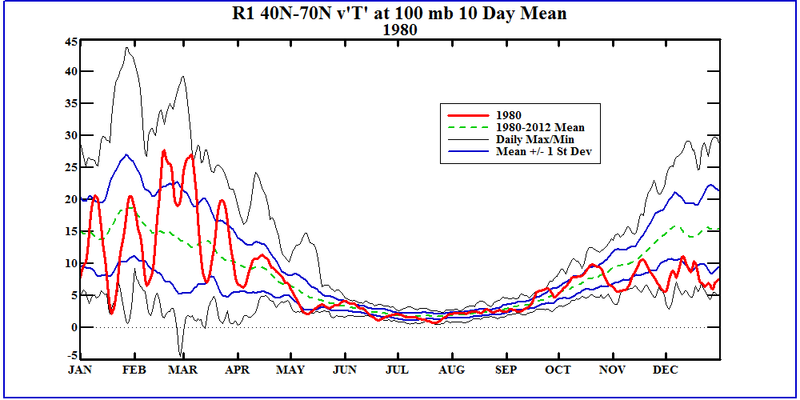 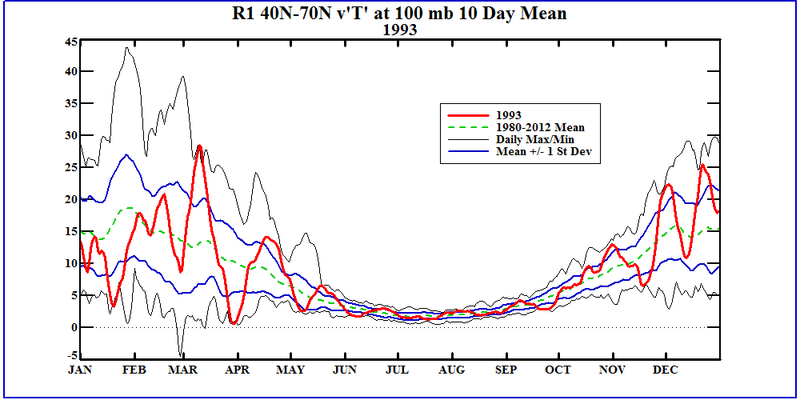 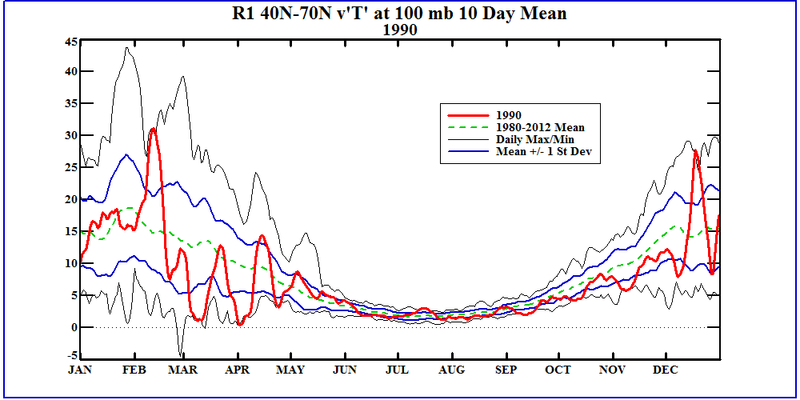 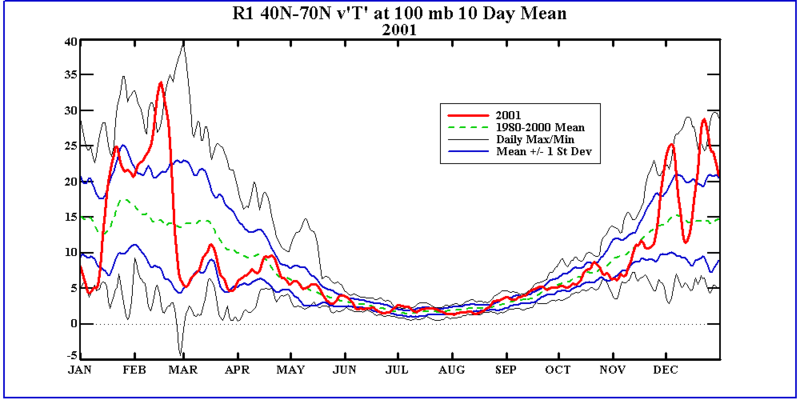 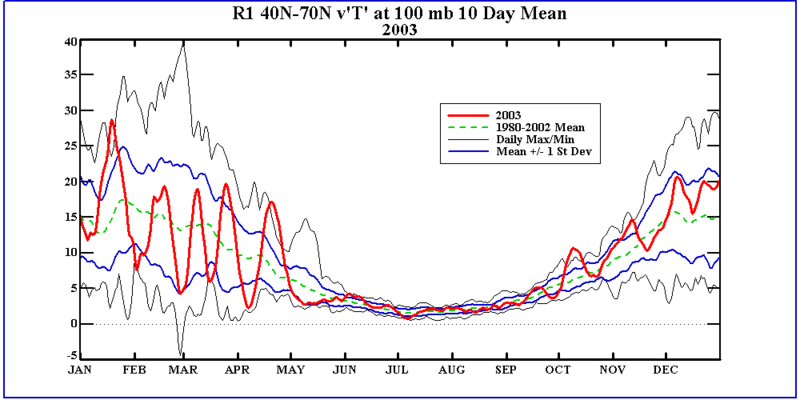 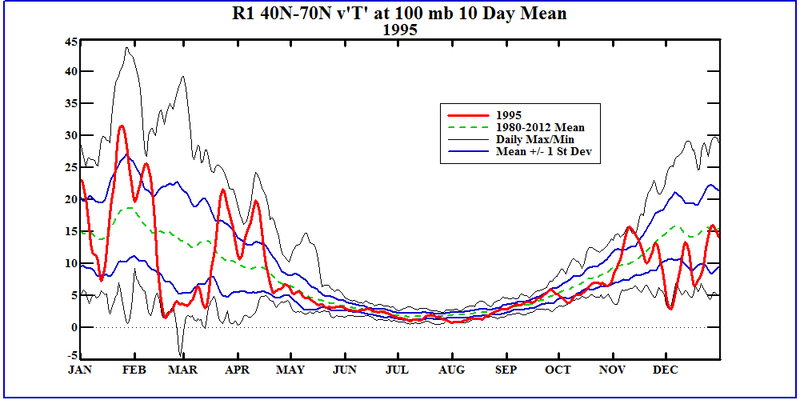 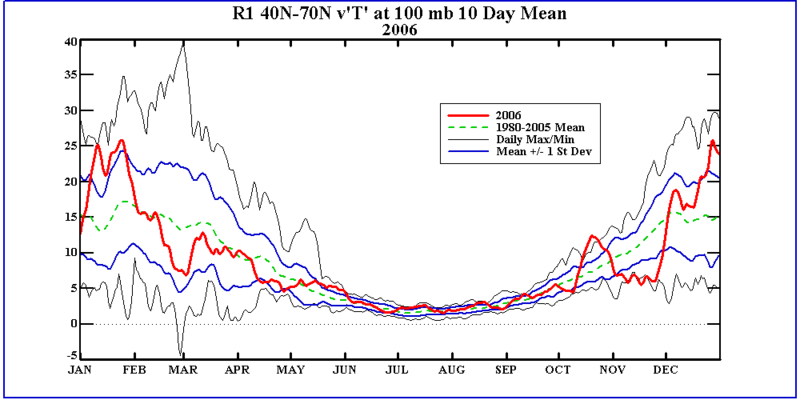 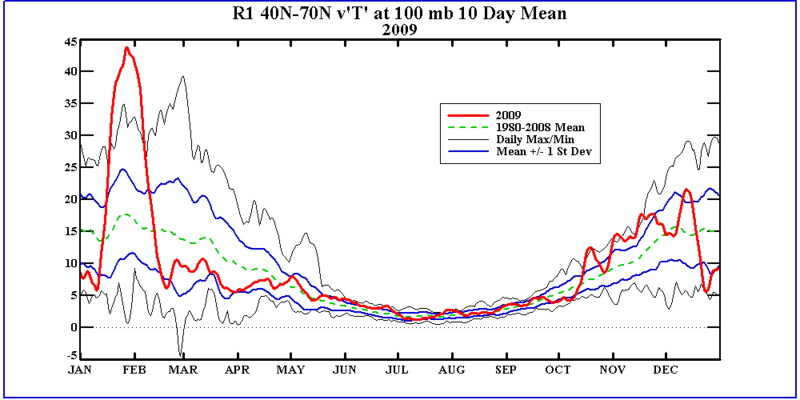 This time series shows the 10 day averaged eddy heat flux towards the North Pole at 100mb. 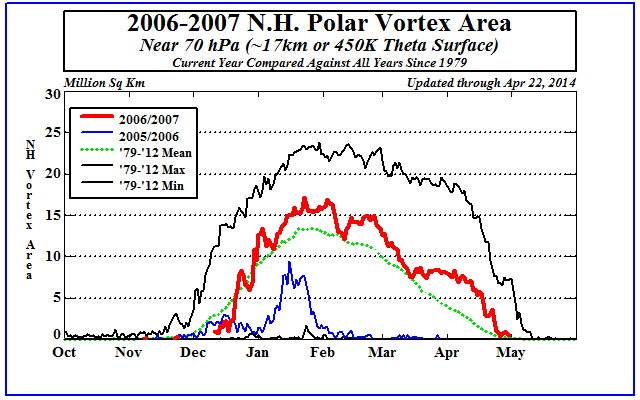 Strong positive fluxes indicate poleward flux of heat via eddies. Multiple stong poleward episodes may result in a Sudden Stratospheric Warming or a smaller/warmer polar vortex. 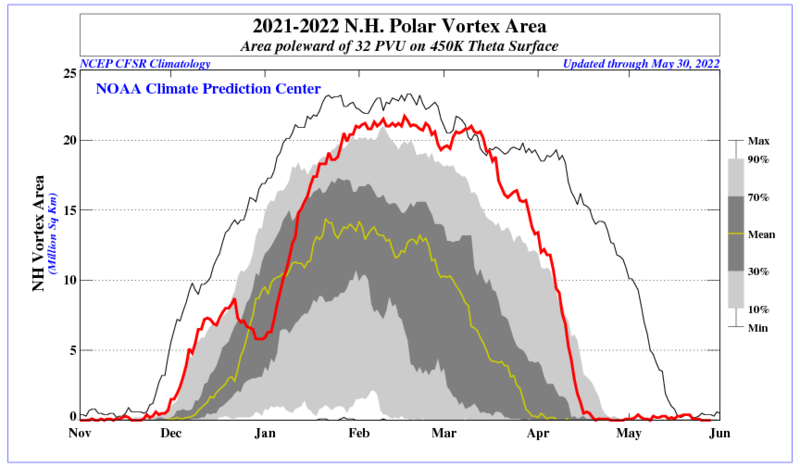 Relatively small flux amplitudes will result in a more stable/colder polar vortex and will extend the winter circulation further into the Spring. 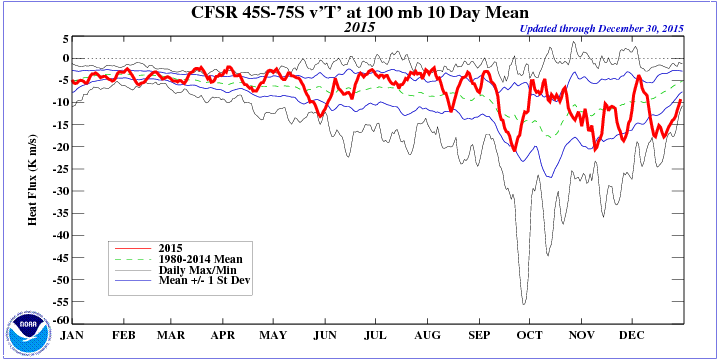 Time vs. 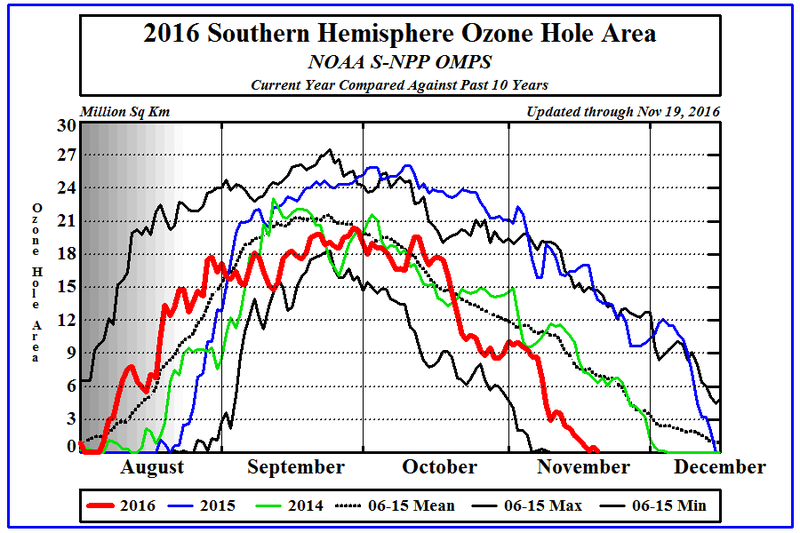 Latitude of zonal mean temperatures on the 50 mb pressure surface. 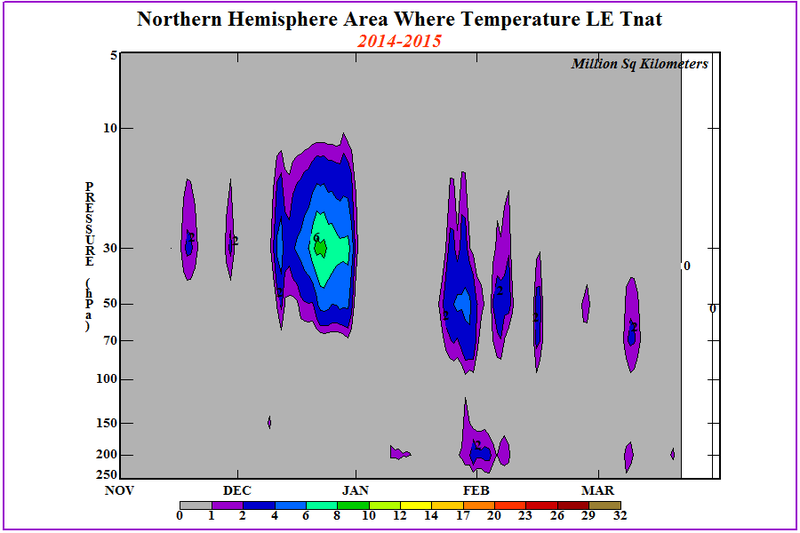 This figure shows the changes with time of temperatures at all latitudes for the current year. 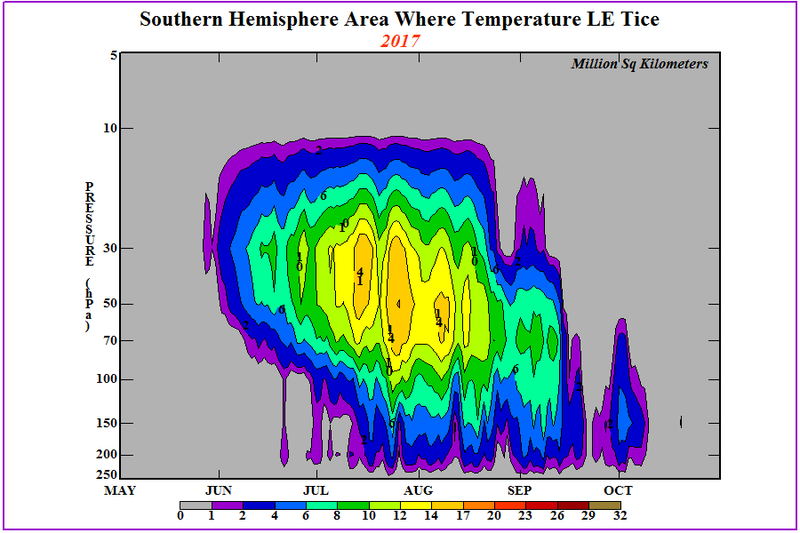 We especially direct your attention to the regions of cold air in the polar regions during the Northern and Southern winters. Also shown are curves delineating the latitudes that are not sunlit during winter. 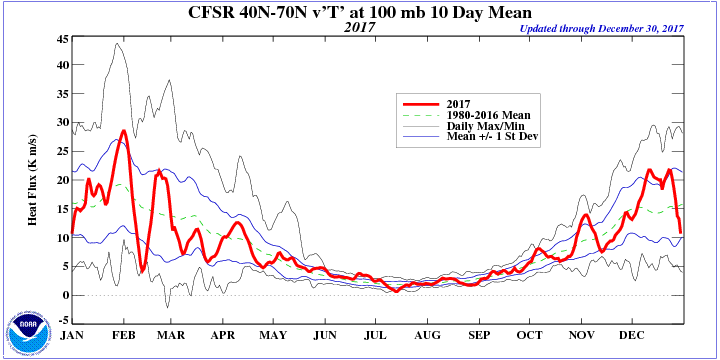 Latitudes poleward of this line are in complete darkness. 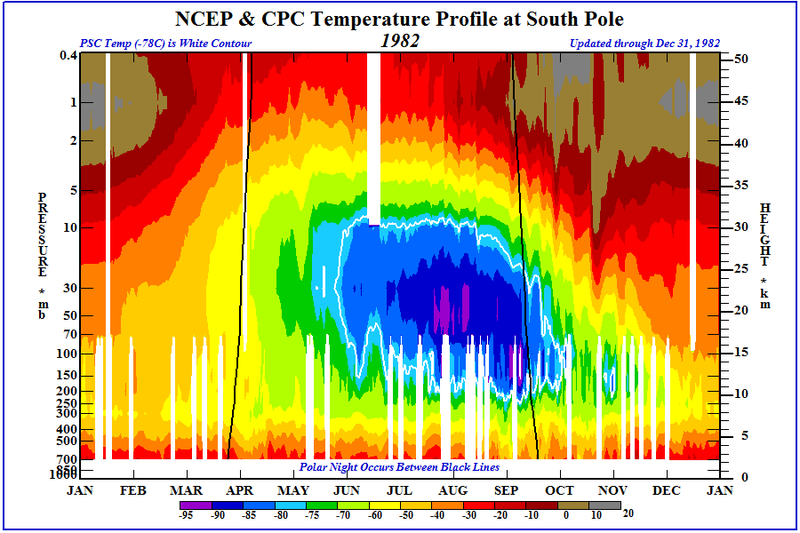 Only when and where the cold polar air is sunlit, can photo-chemical reactions depleting ozone take place, (in the presence of chlorine and other halons). Time vs. Pressure of Tnat in Southern Hemisphere. 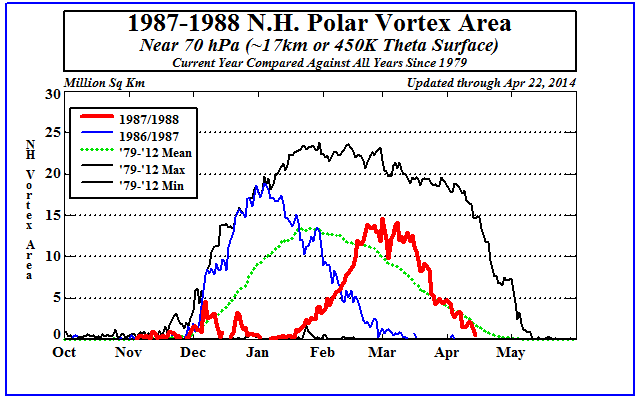 This figure shows the change with time of the area at various pressure levels at which the temperature is below that which forms Polar Stratospheric Clouds(PSC) Type I (nitric acid trihydrate - NAT) and II (ice). 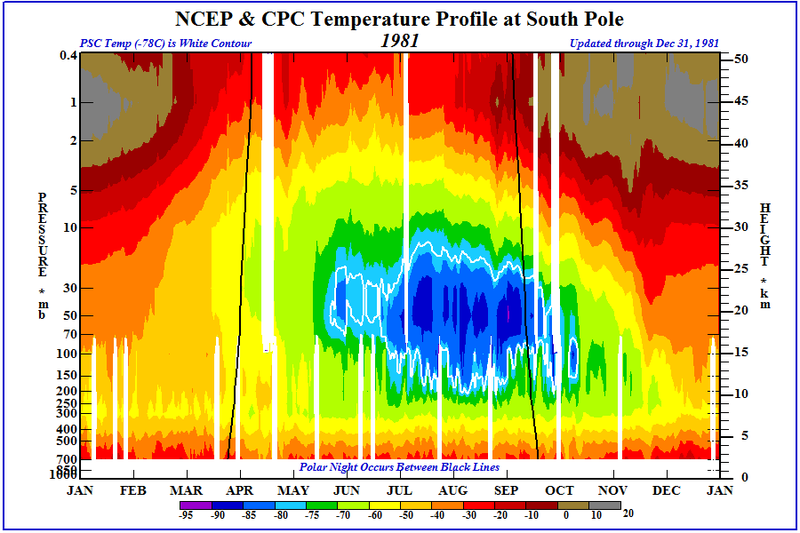 At low temperatures over the winter polar areas (195 K or -78 C), nitric acid (HNO3) and sulfur-containing gases condense with water vapor to form solid and liquid PSC particles. 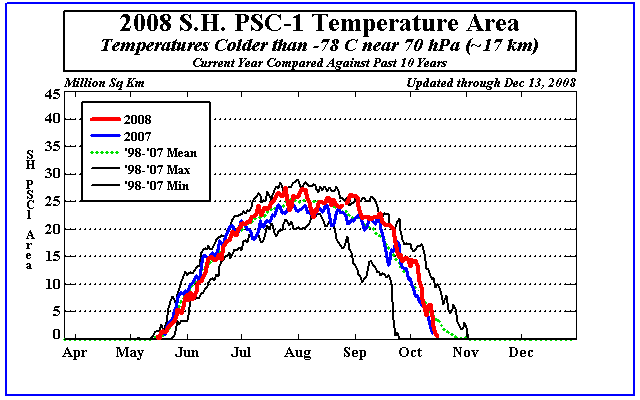 At even lower temperatures(188 K and -85 C), ice particles form. 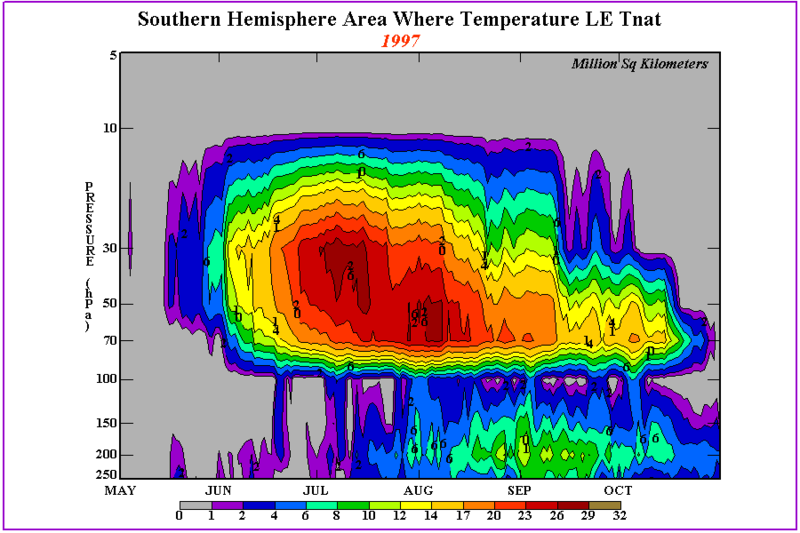 These particles grow in size and number to create cloud-like features. 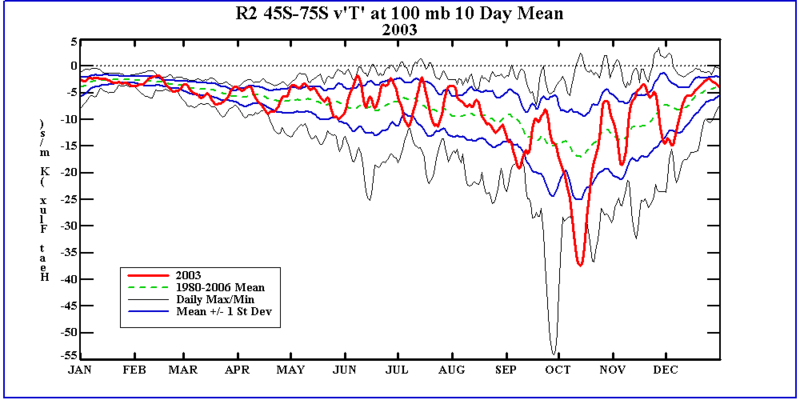 PSCs cause changes in the abundance of reactive chlorine gases. 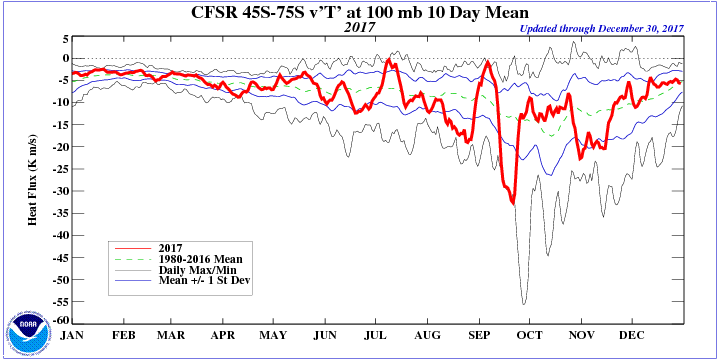 Reactions occur on the surfaces of PSCs that convert reservoir forms of reactive chlorine, ClONO2 and HCl, into the most reactive form ClO. 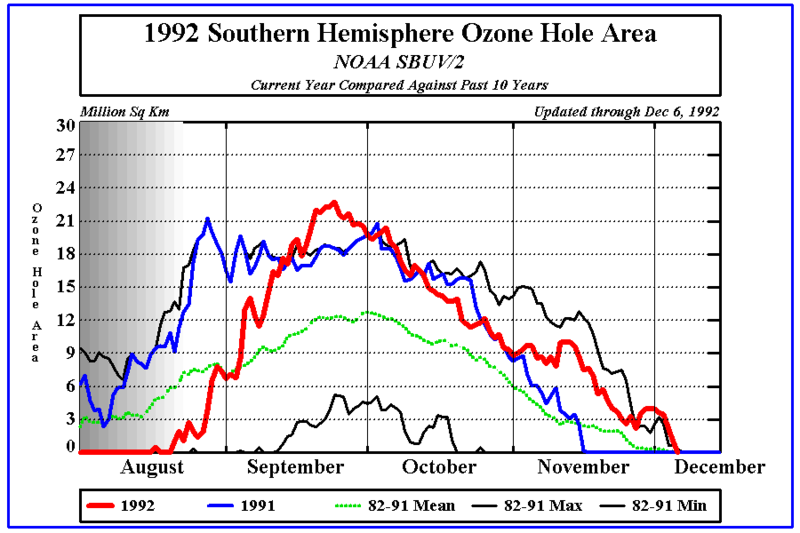 Reactive chlorine then destroys ozone once sunlight returns to the polar area. Time vs. Pressure of Tnat in Northern Hemisphere. 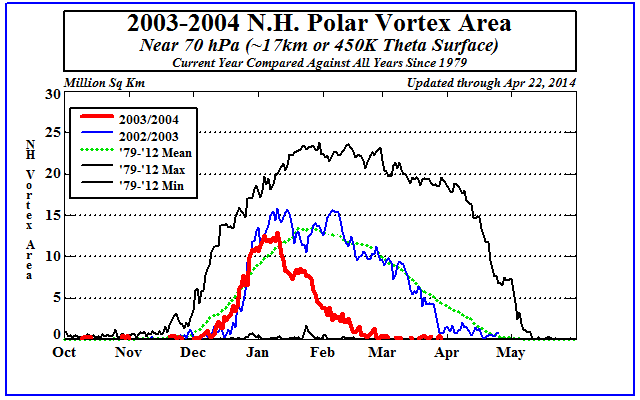 This figure shows the change with time of the area at various pressure levels at which the temperature is below that which forms Polar Stratospheric Clouds(PSC) Type I (nitric acid trihydrate - NAT). 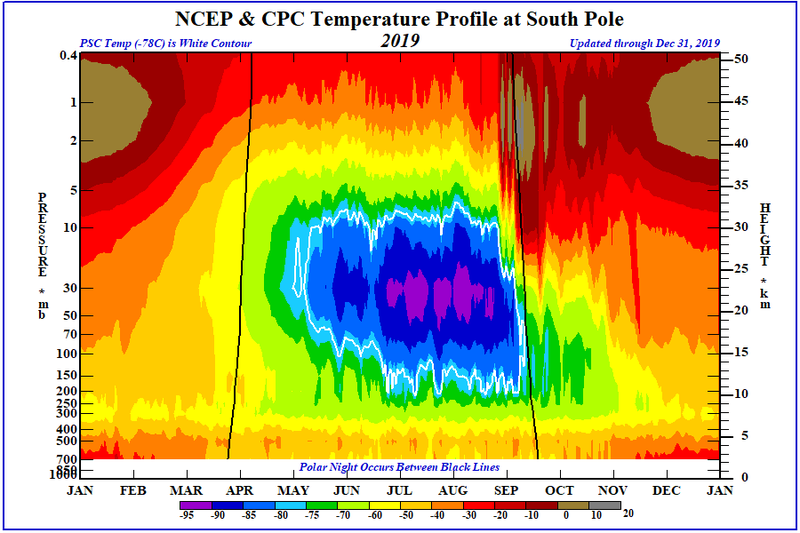 At low temperatures over the winter polar areas (195 K or -78 C), nitric acid (HNO3) and sulfur-containing gases condense with water vapor to form solid and liquid PSC particles. At even lower temperatures(188 K and -85 C), ice particles form. 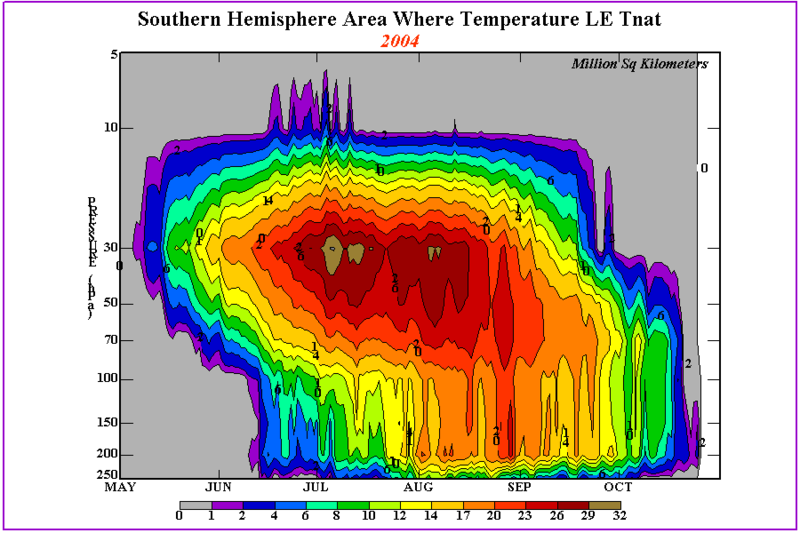 These particles grow in size and number to create cloud-like features. PSCs cause changes in the abundance of reactive chlorine gases. 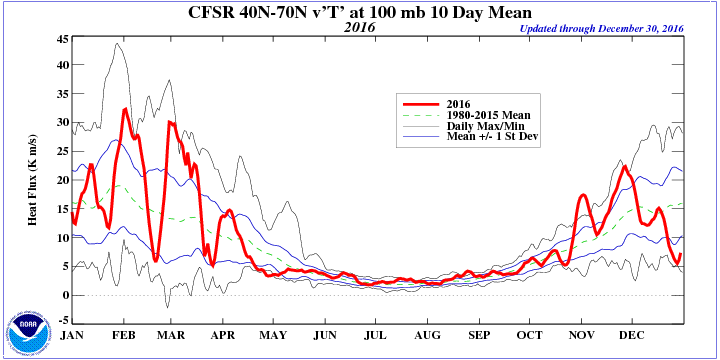 Reactions occur on the surfaces of PSCs that convert reservoir forms of reactive chlorine, ClONO2 and HCl, into the most reactive form ClO. 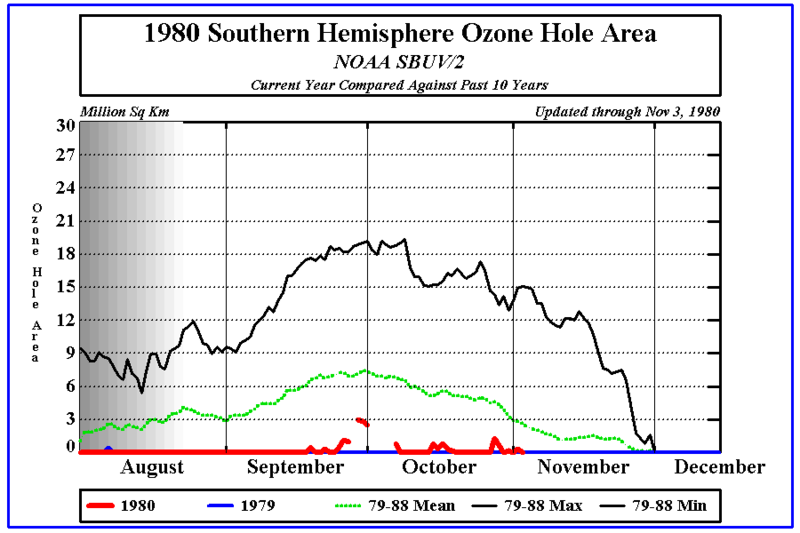 Reactive chlorine then destroys ozone once sunlight returns to the polar area. 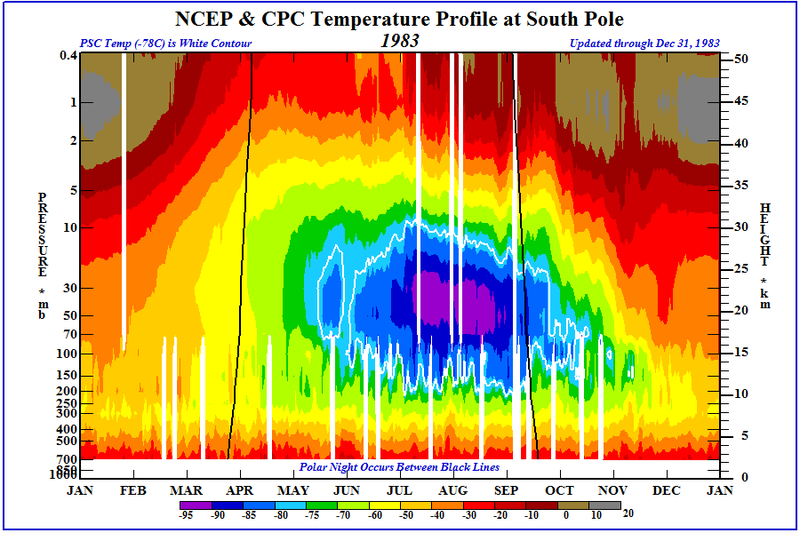 Time vs. Pressure of temperatures over the South Pole. 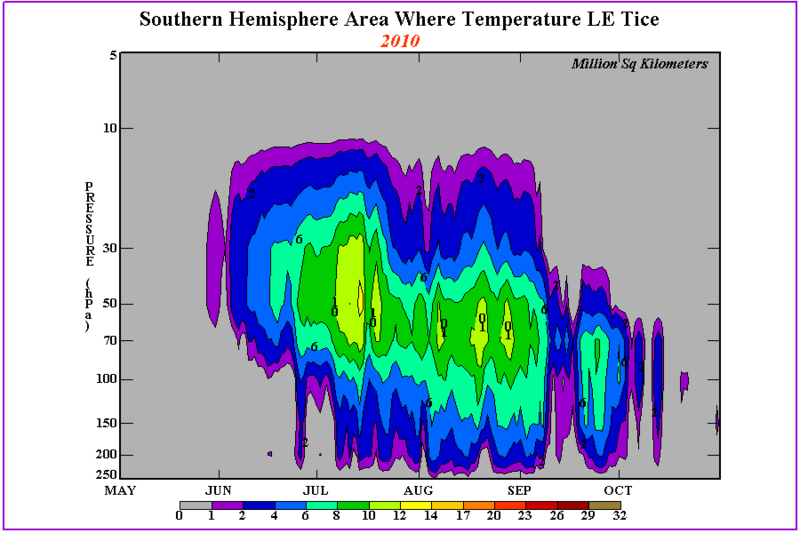 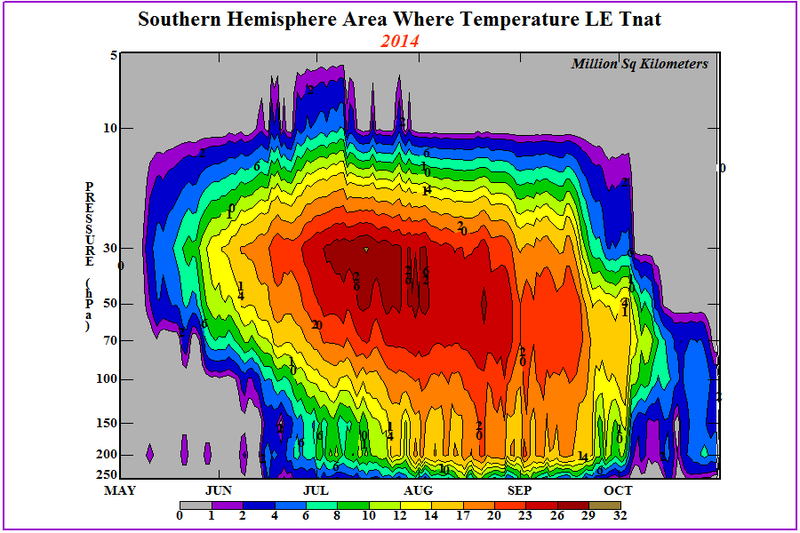 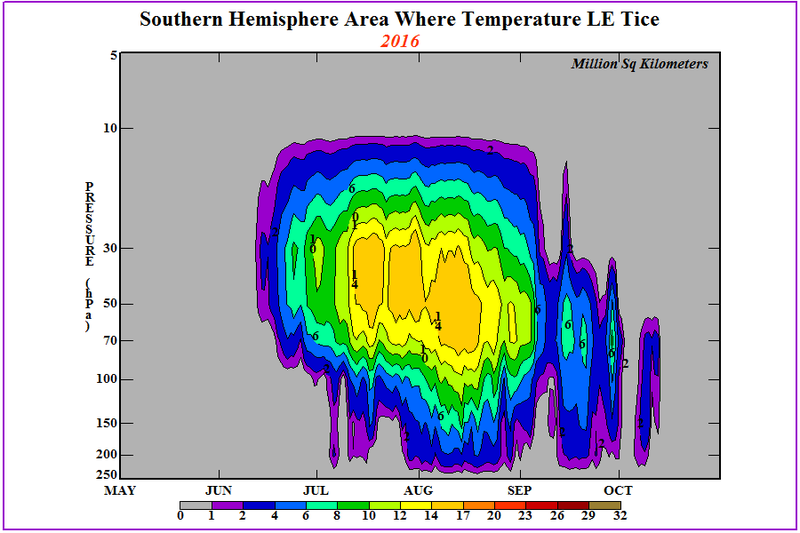 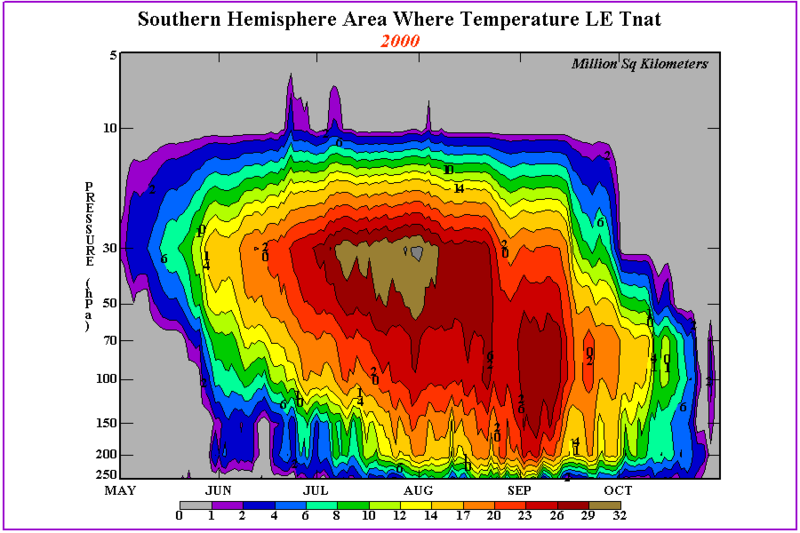 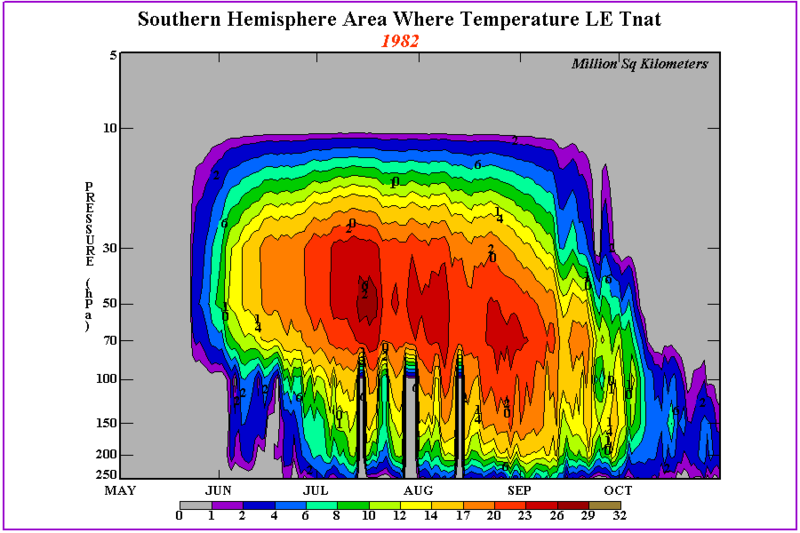 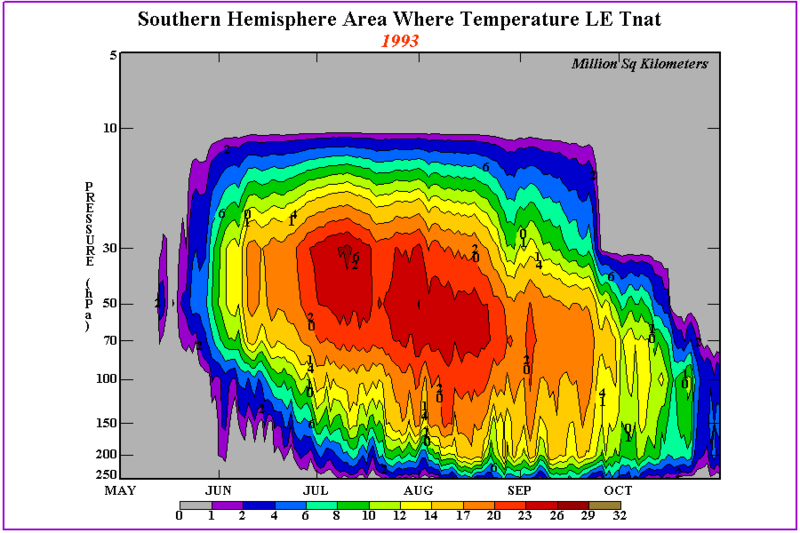 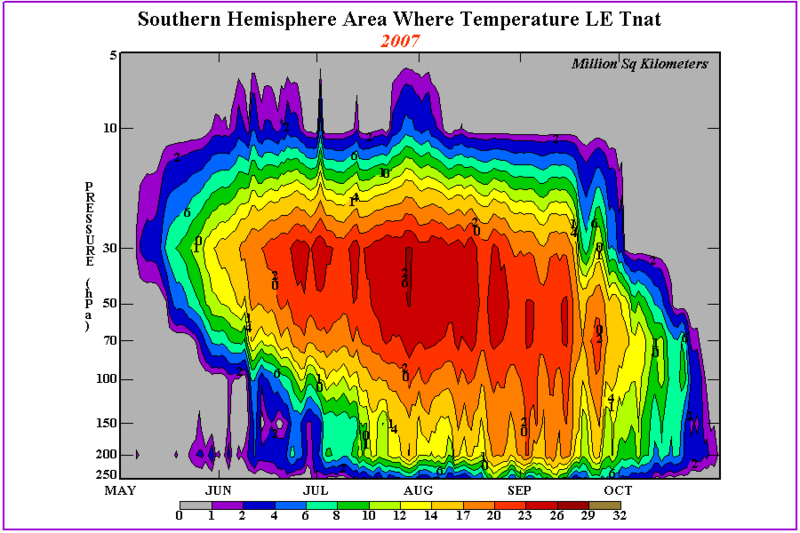 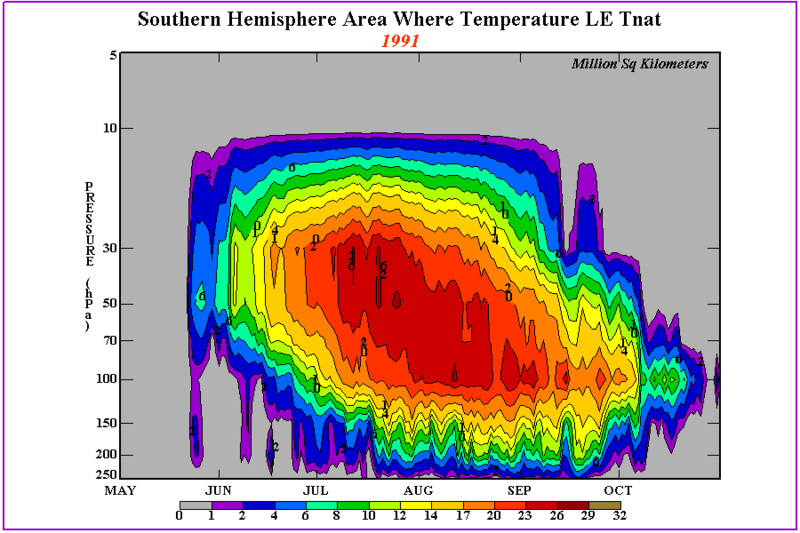 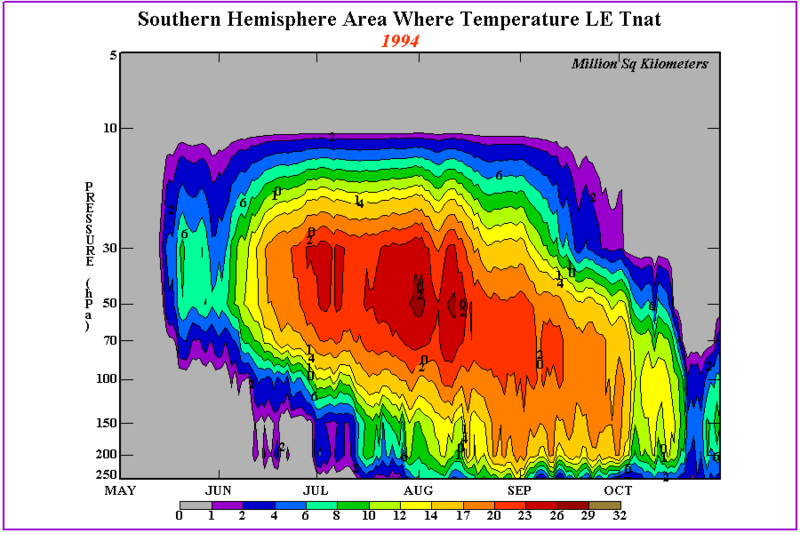 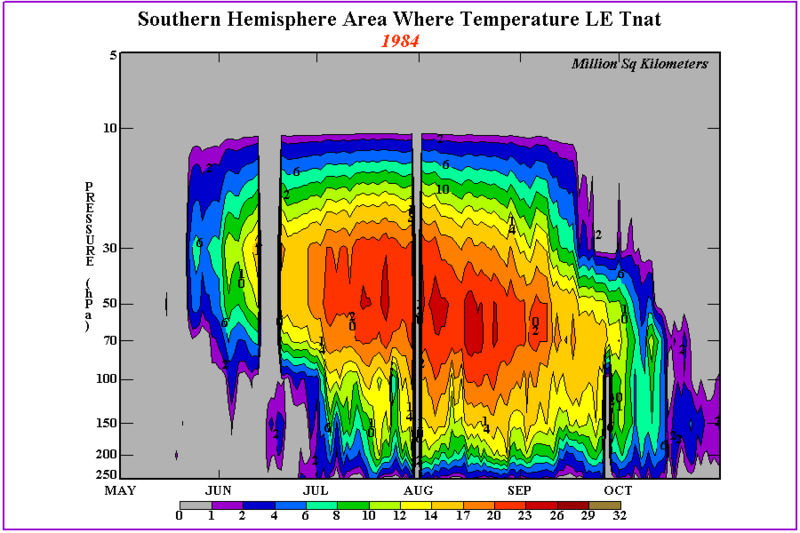 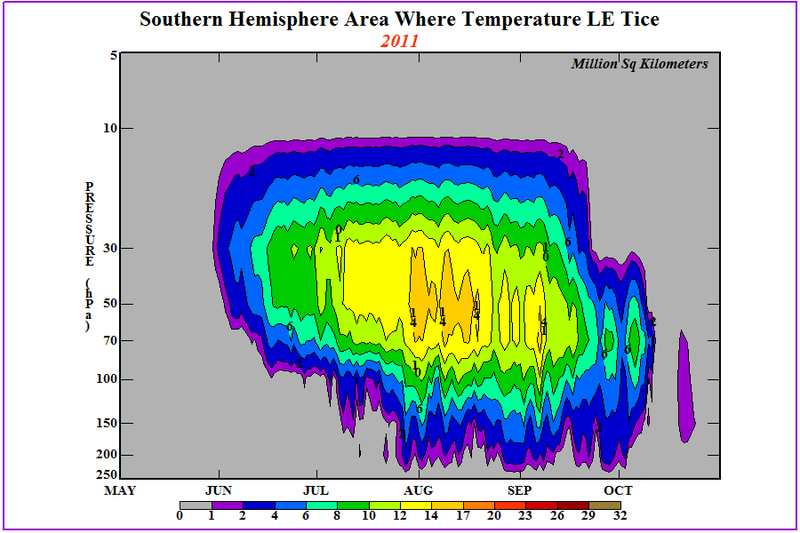 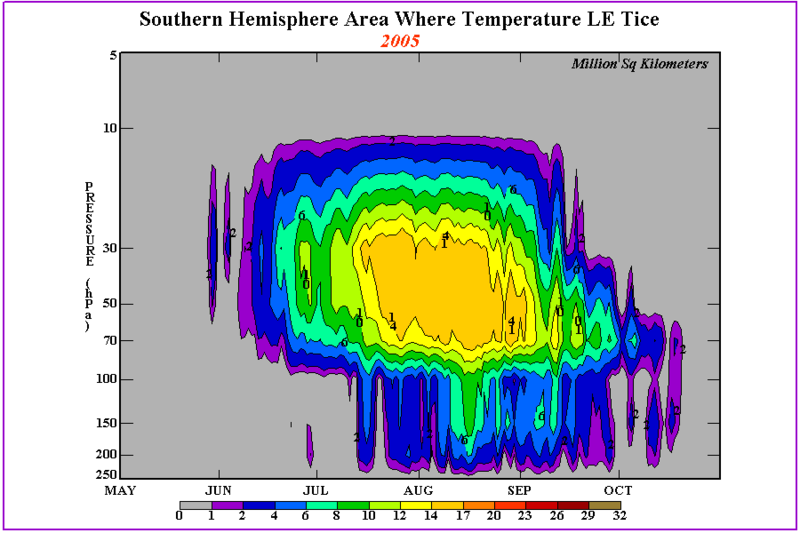 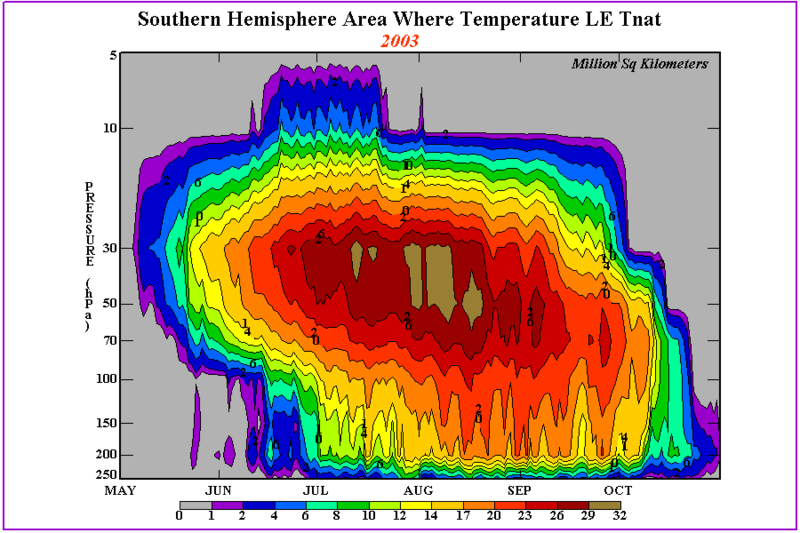 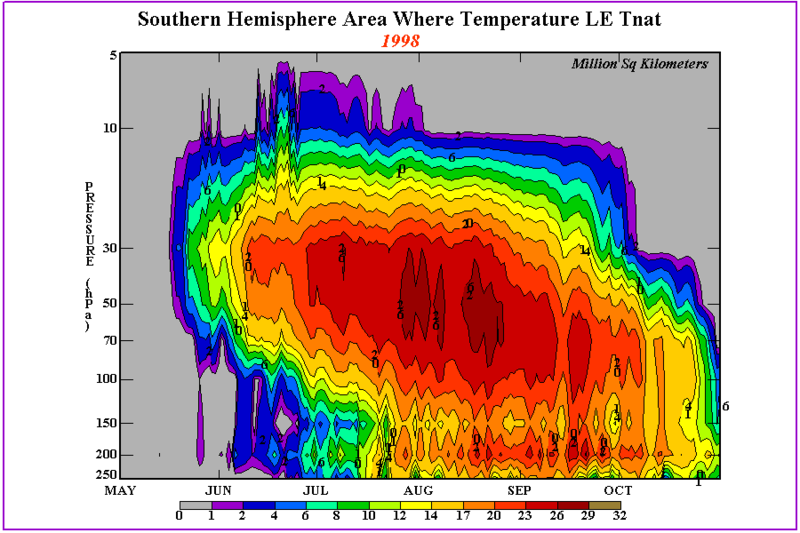 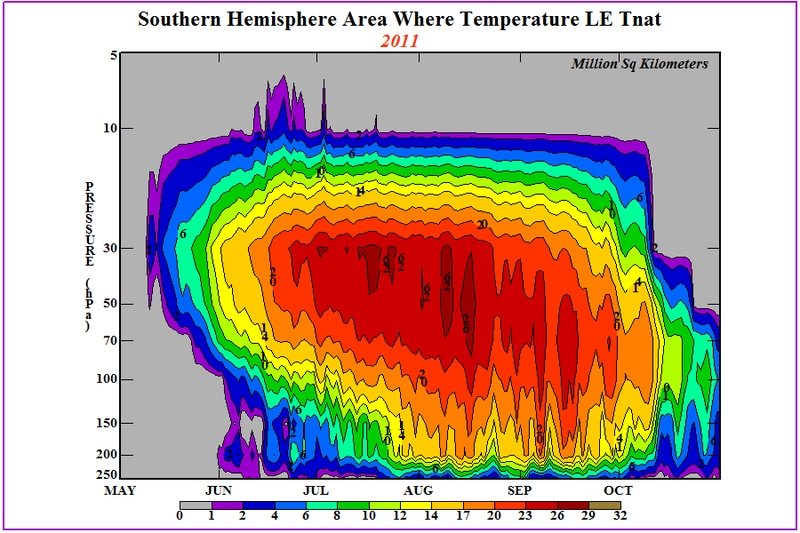 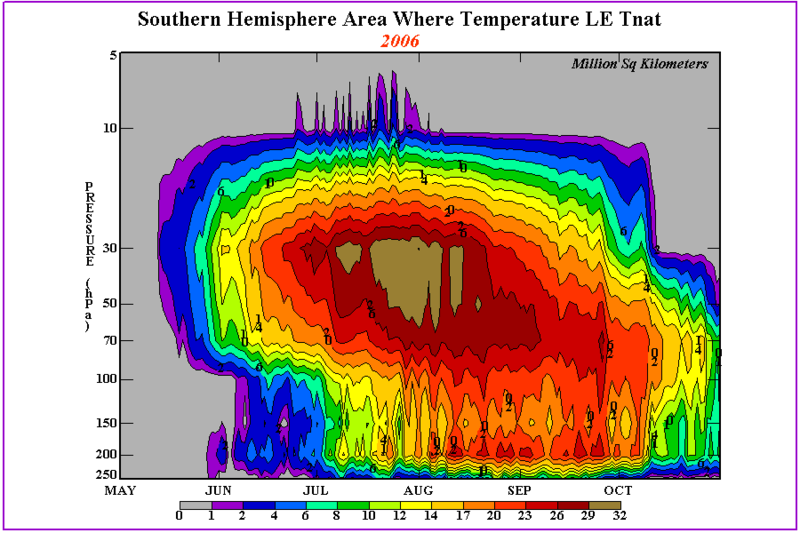 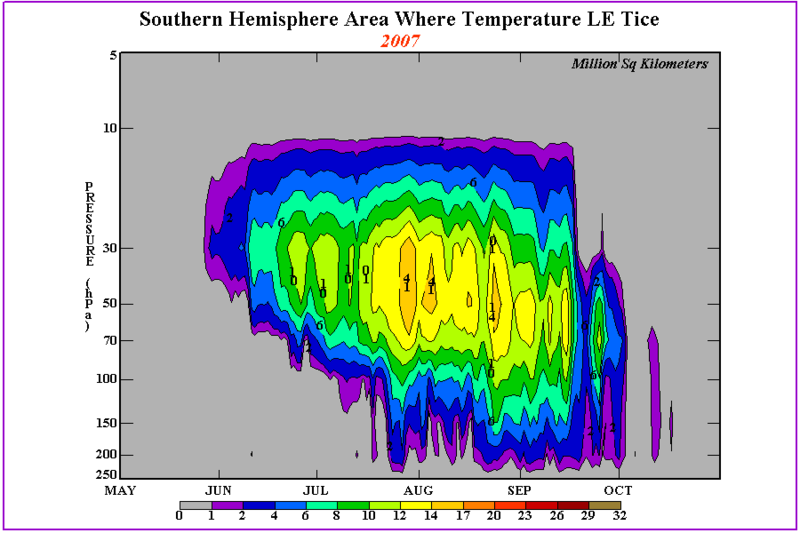 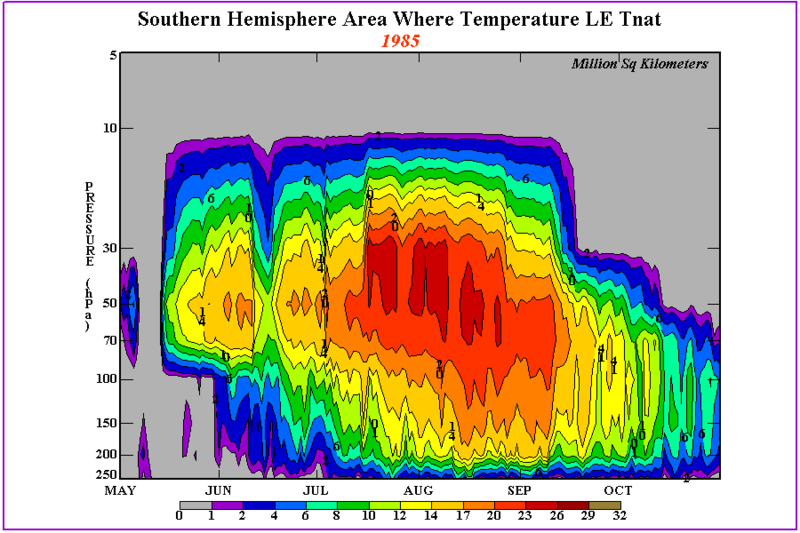 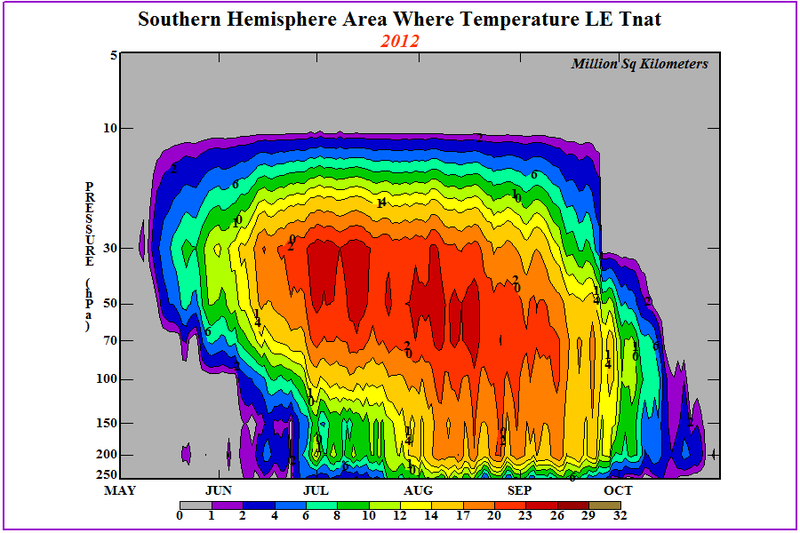 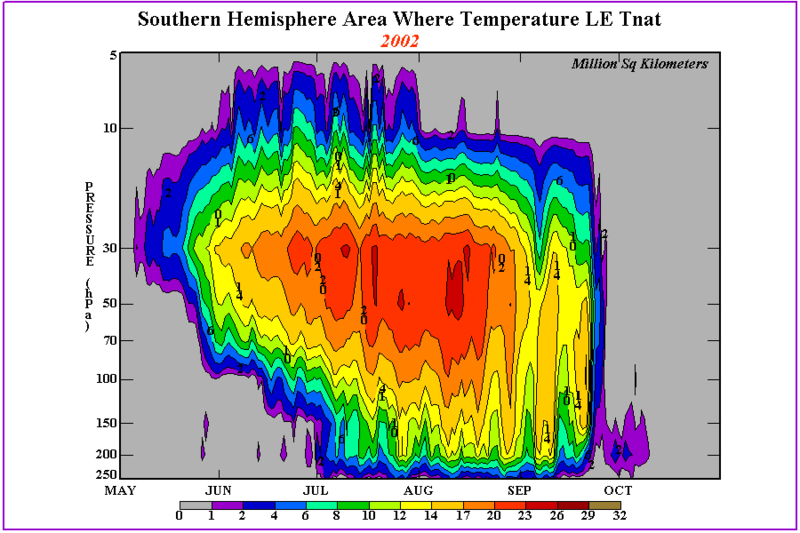 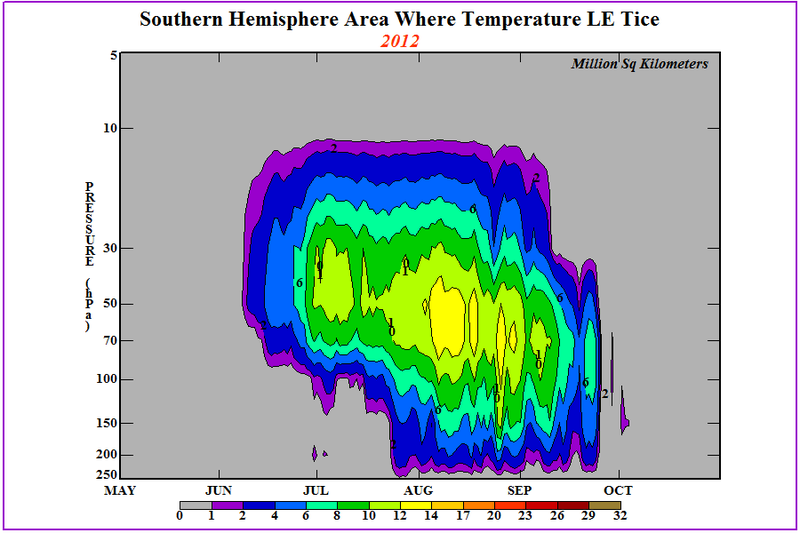 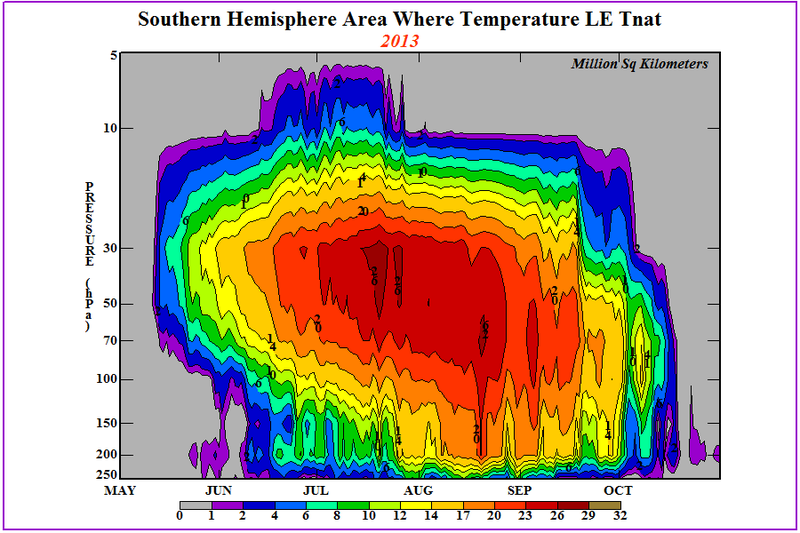 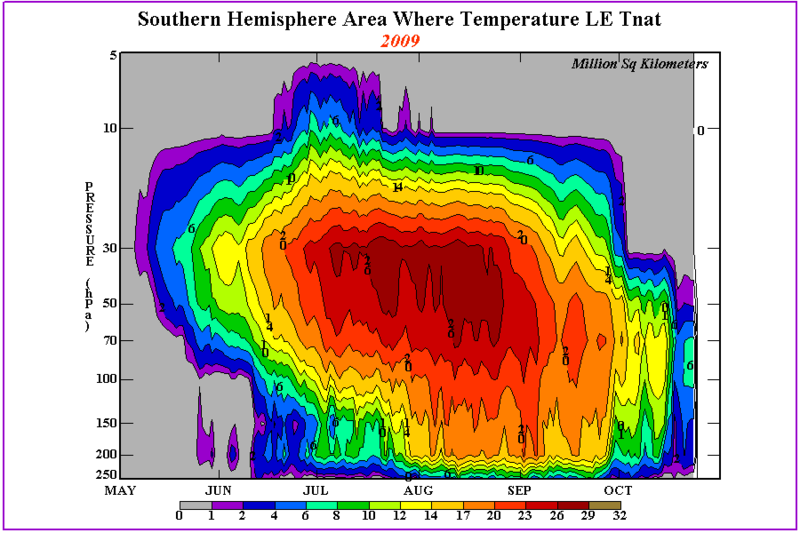 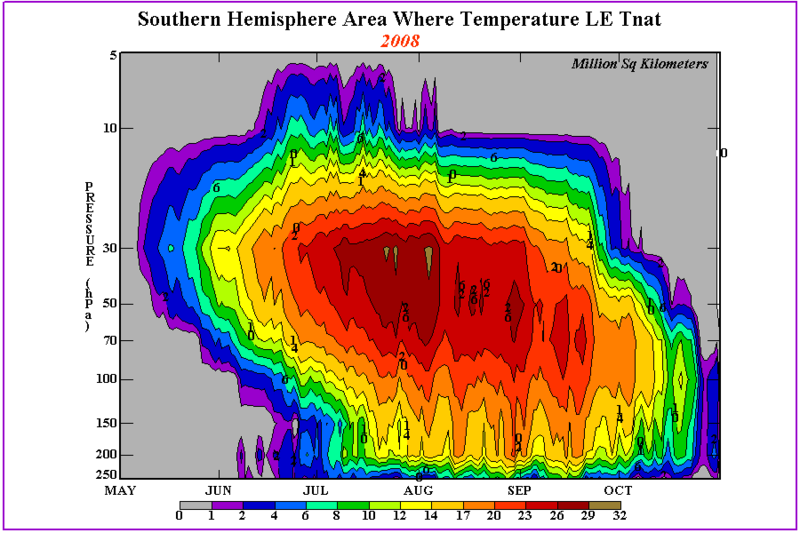 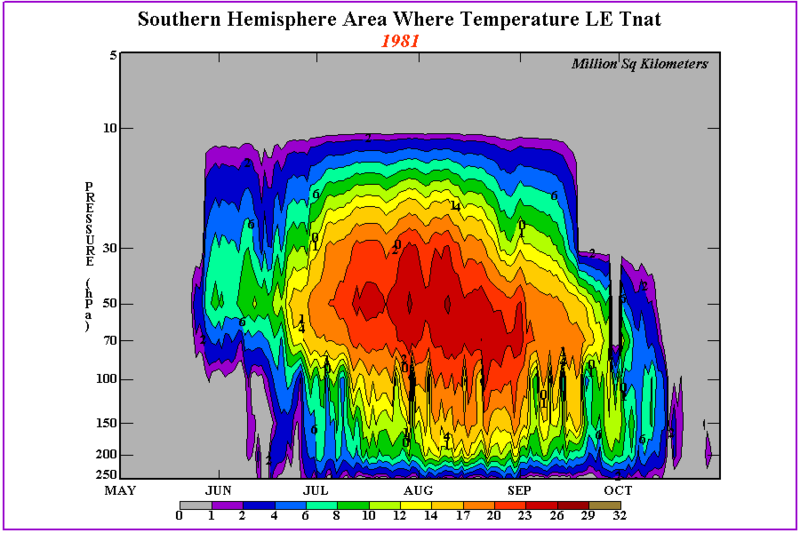 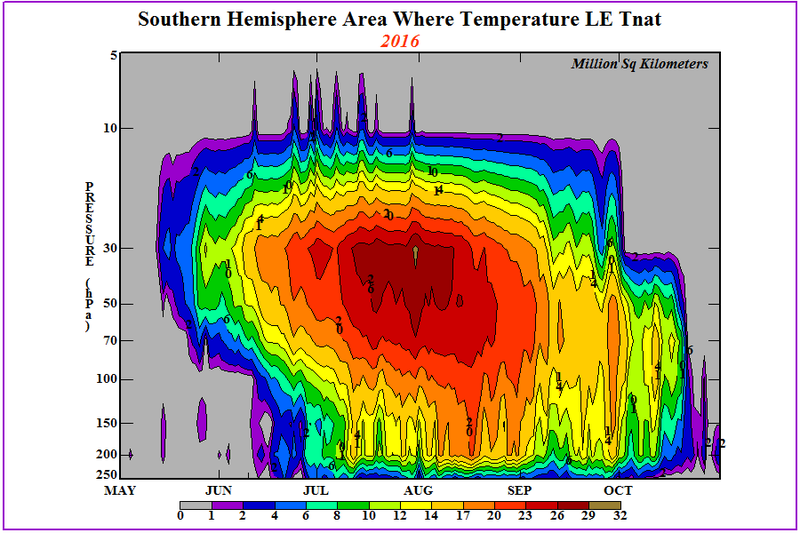 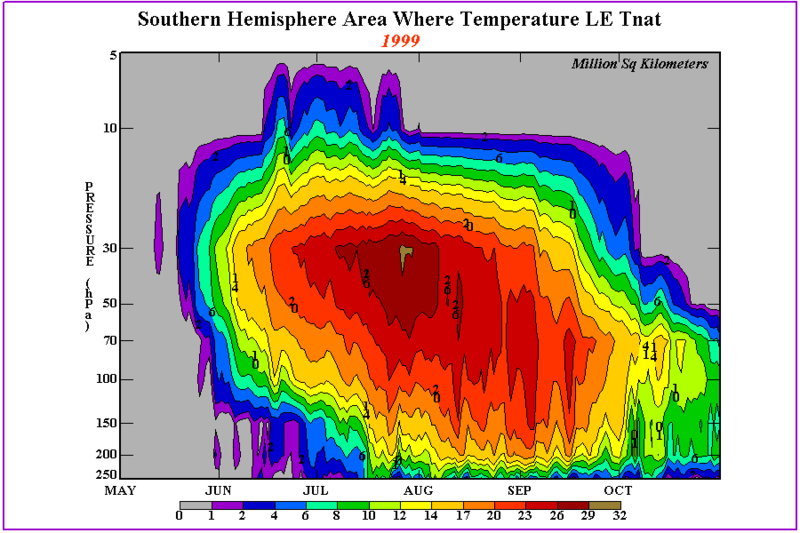 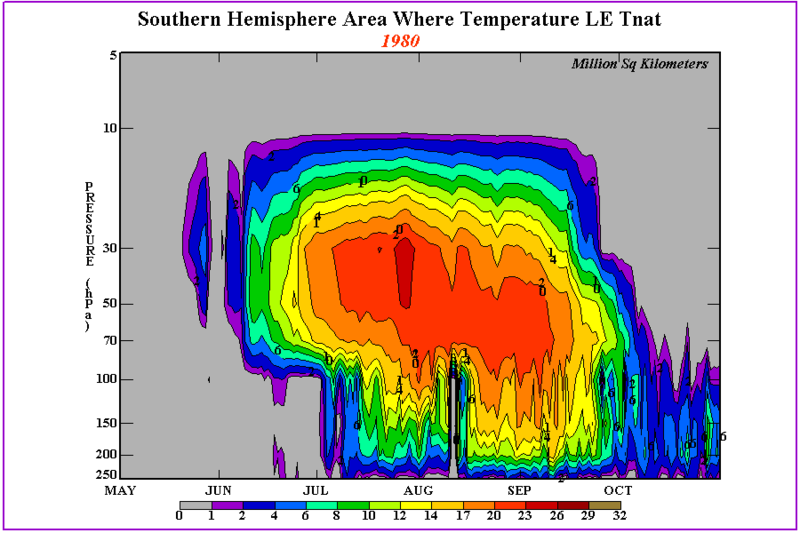 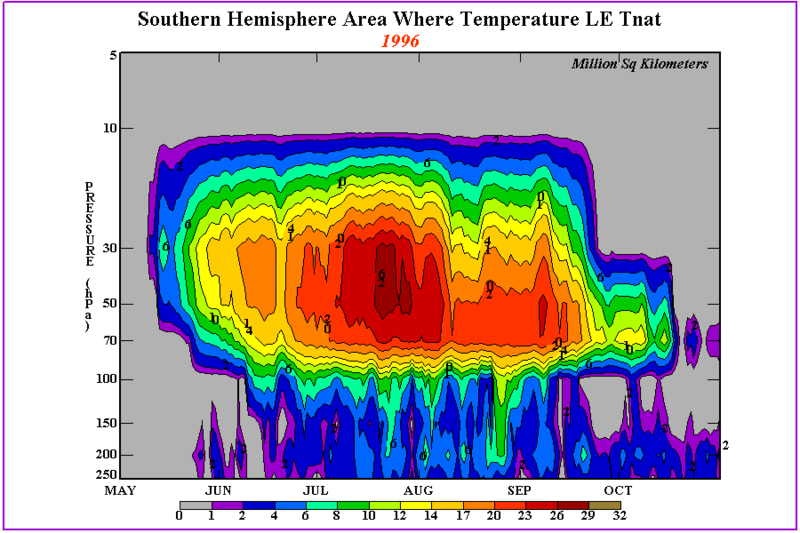 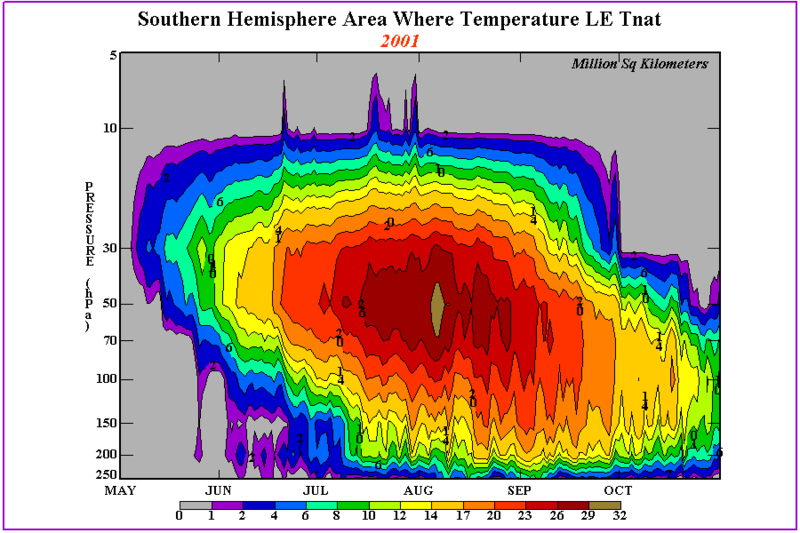 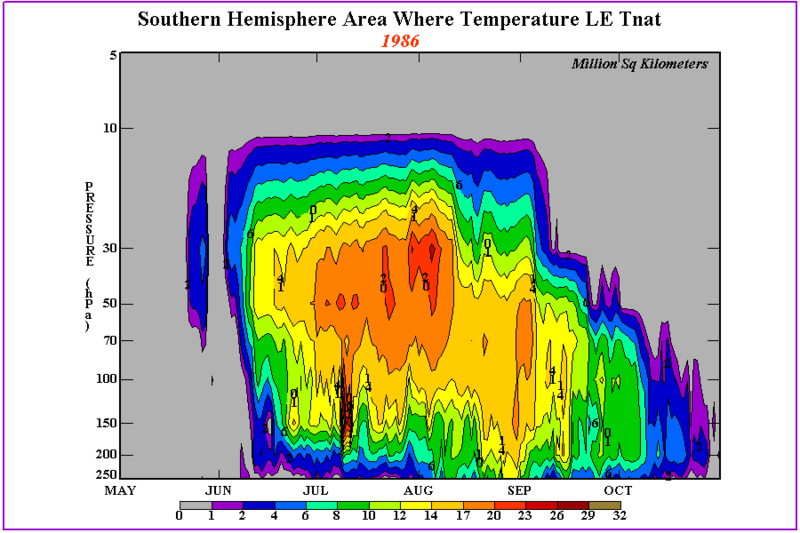 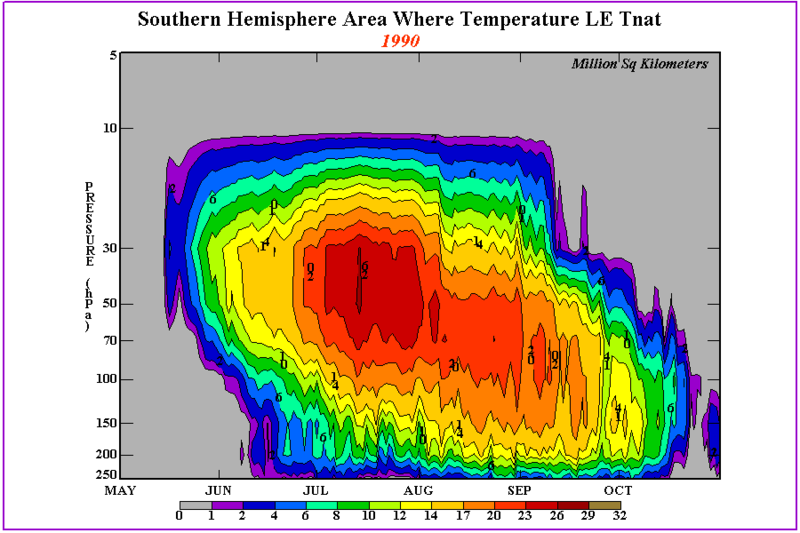 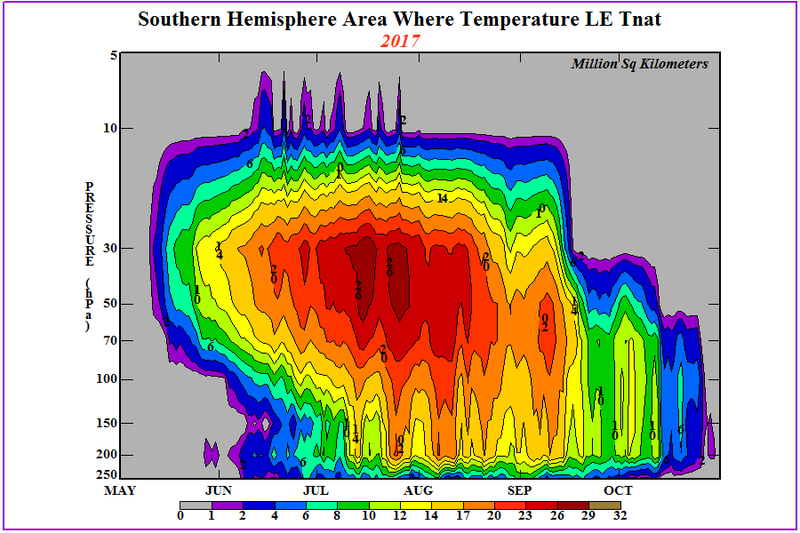 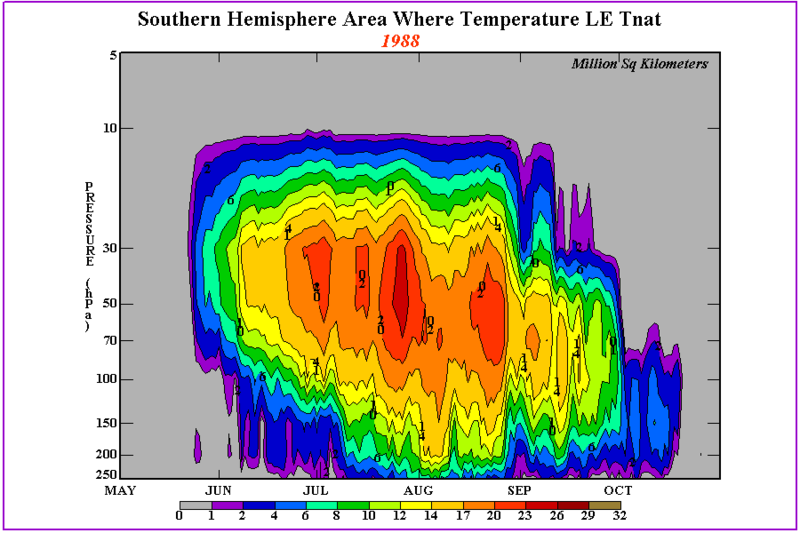 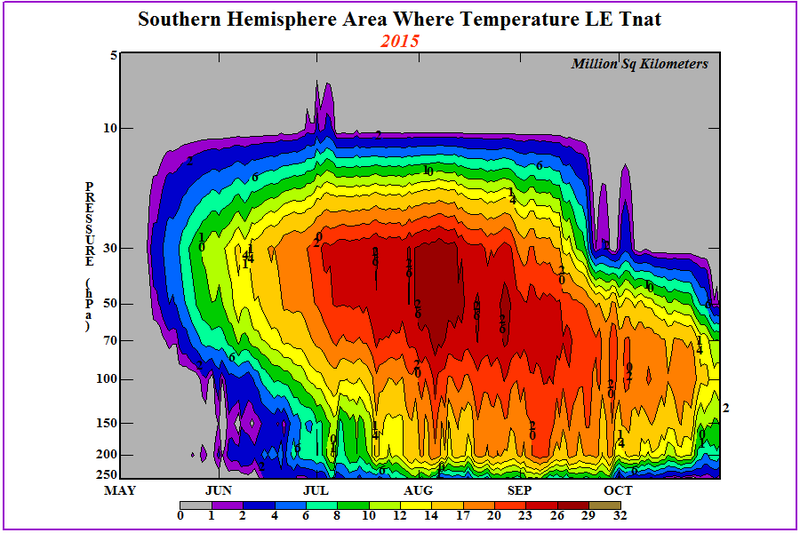 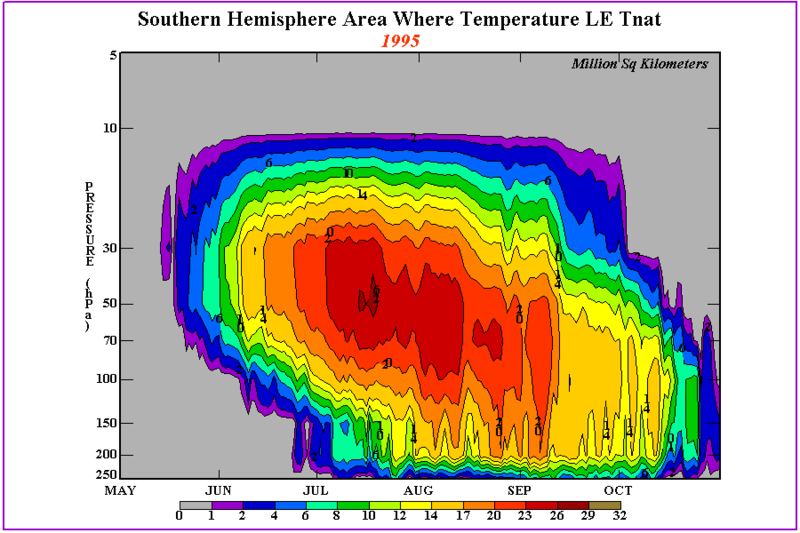 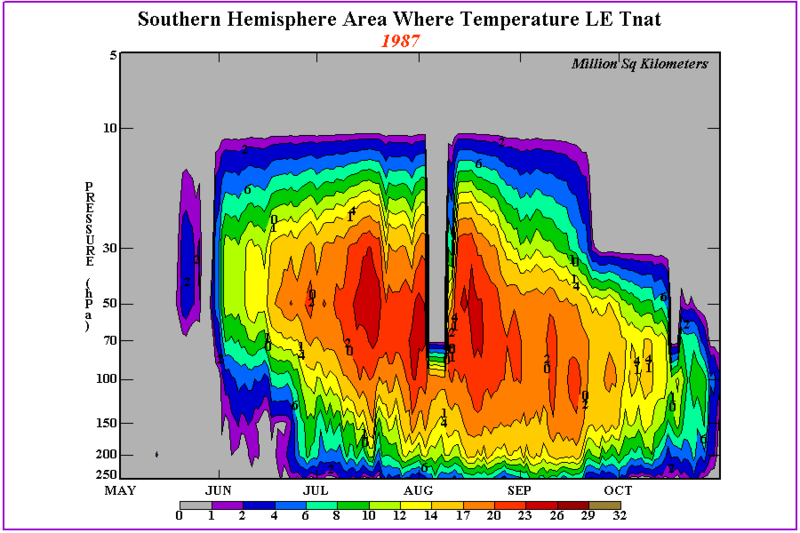 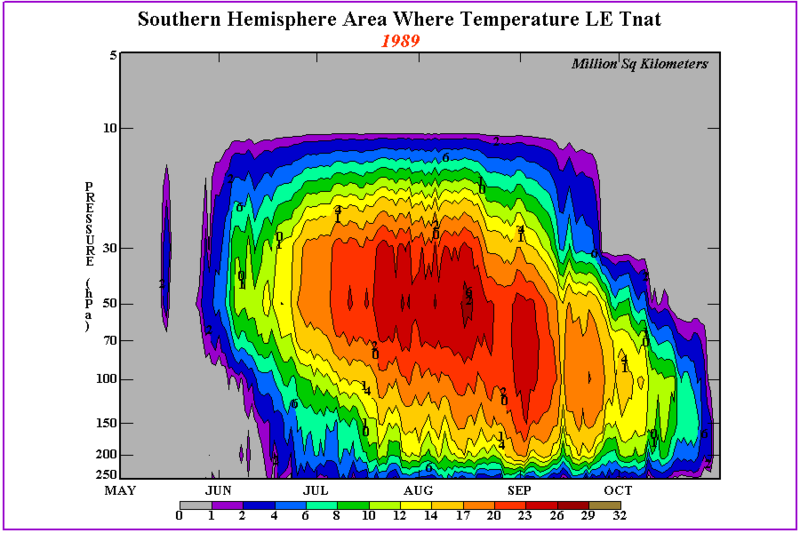 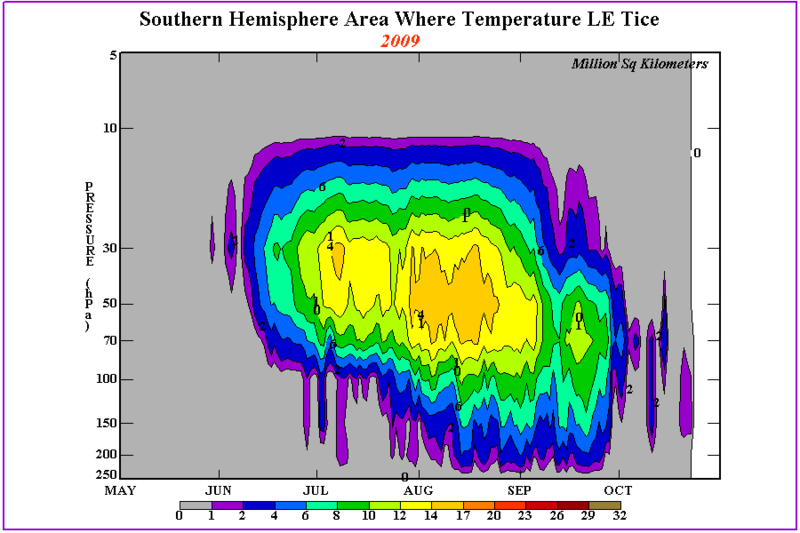 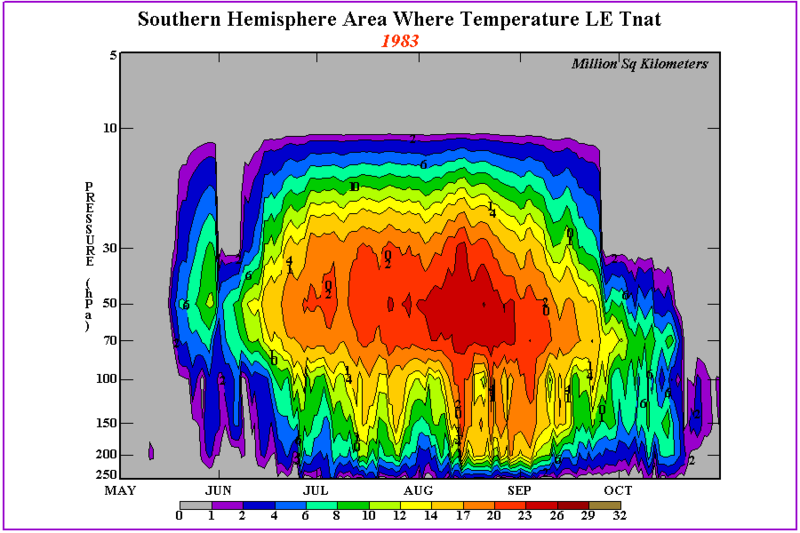 This figure shows the changes with time of temperatures over the South Pole throughout the troposphere and stratosphere. 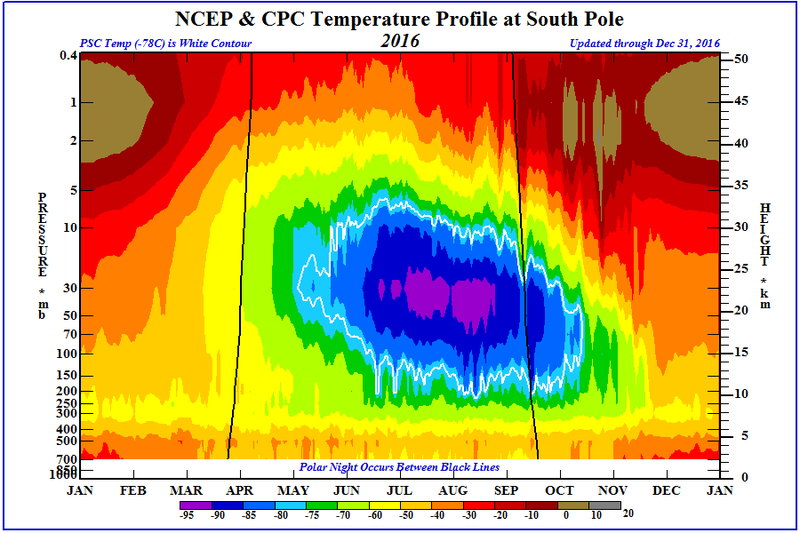 Very cold air dominates over the South Polar region during Austral Winter. 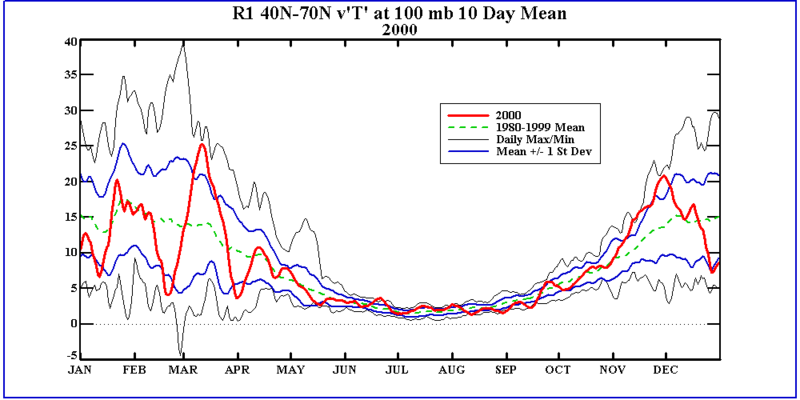 Adiabatically warmed descending air at the highest altitudes (lowest pressures) becomes apparent by mid September. 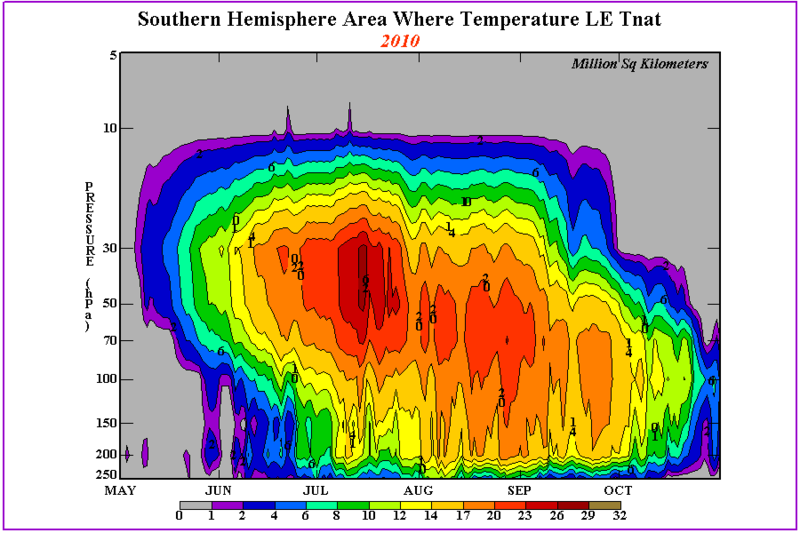 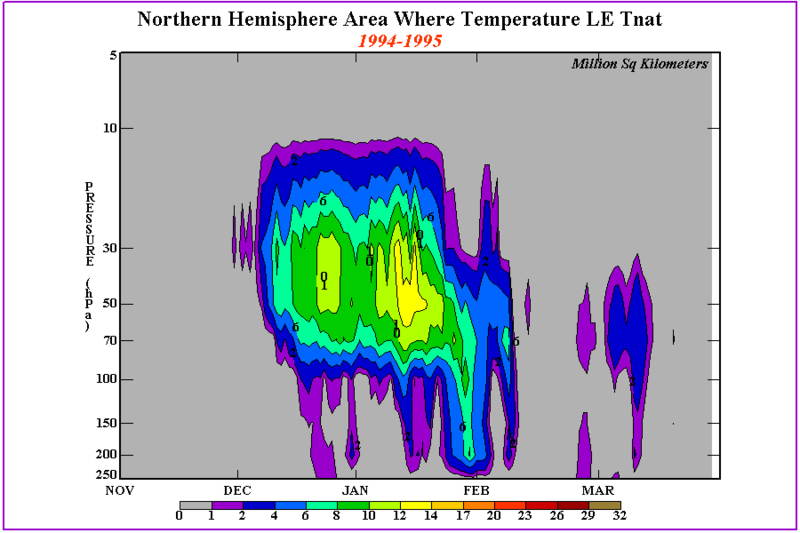 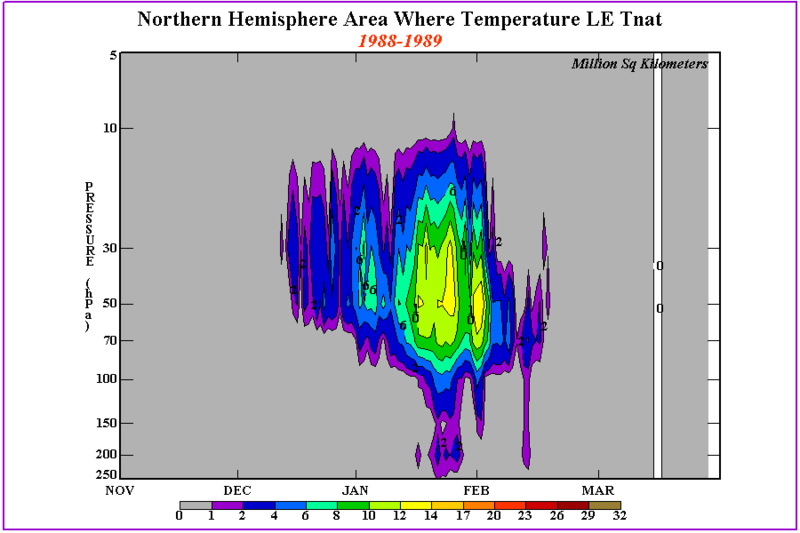 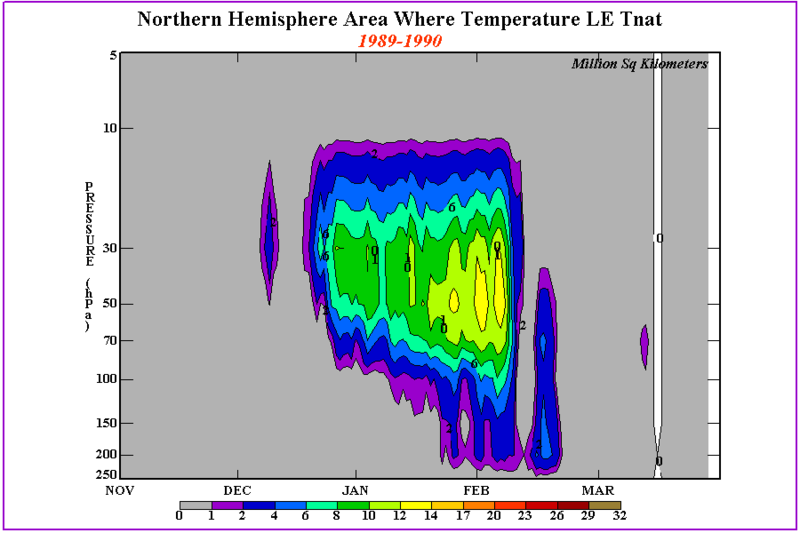 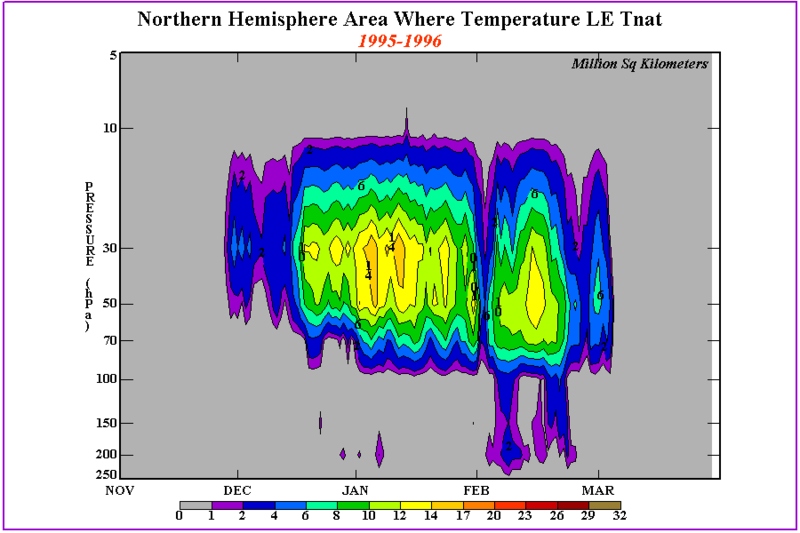 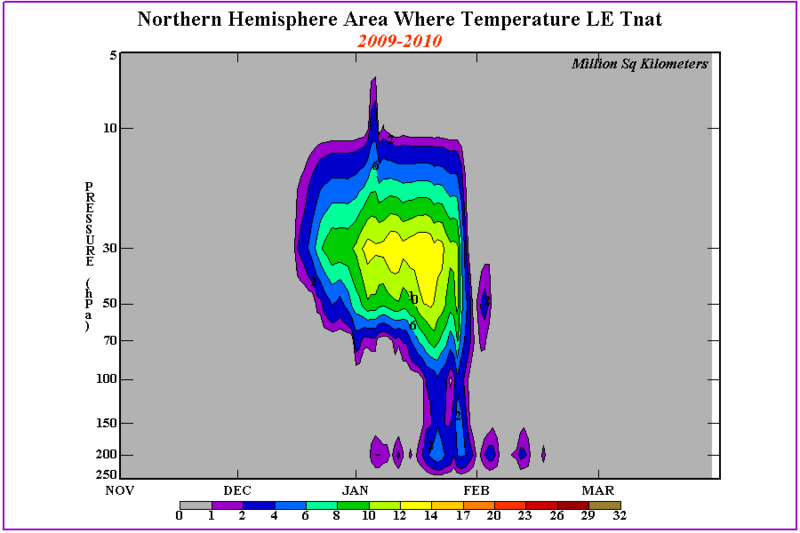 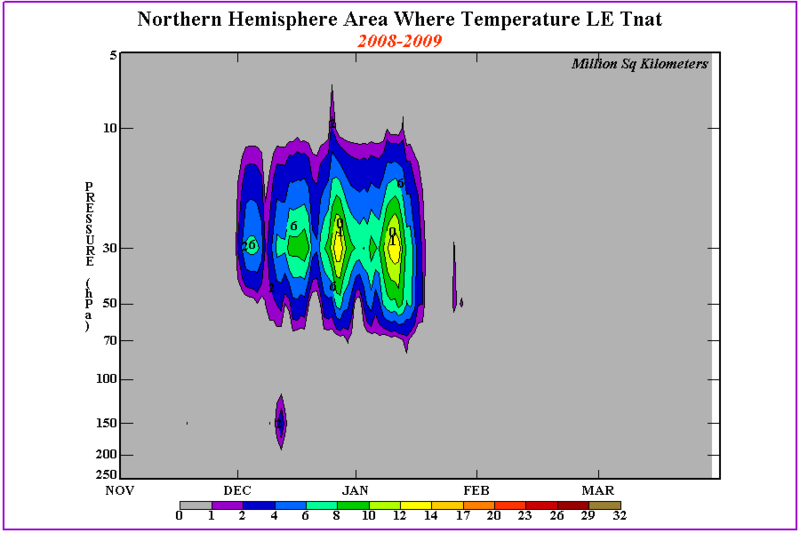 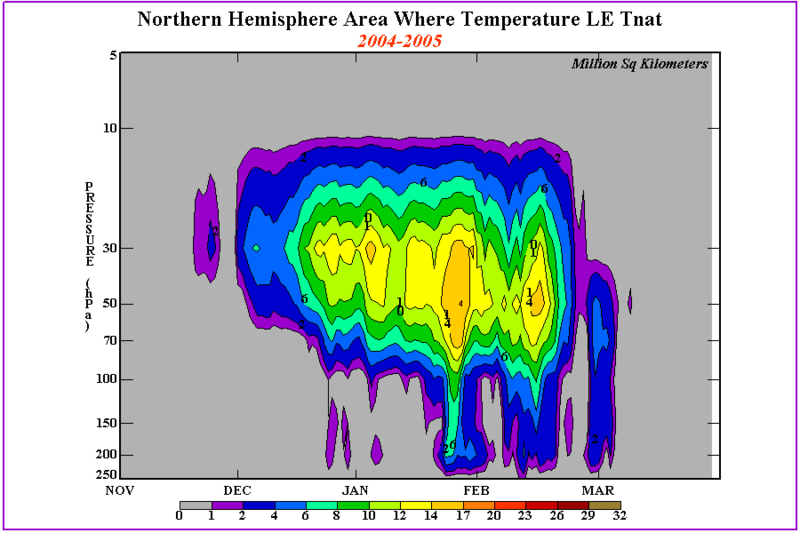 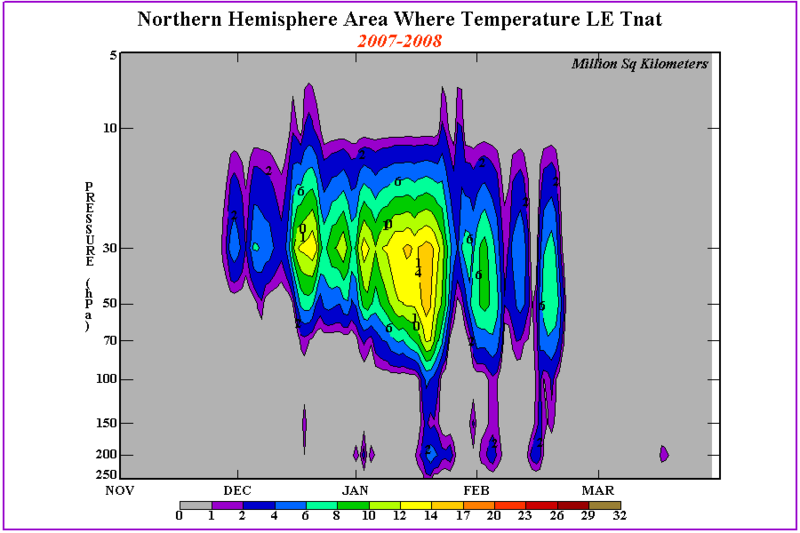 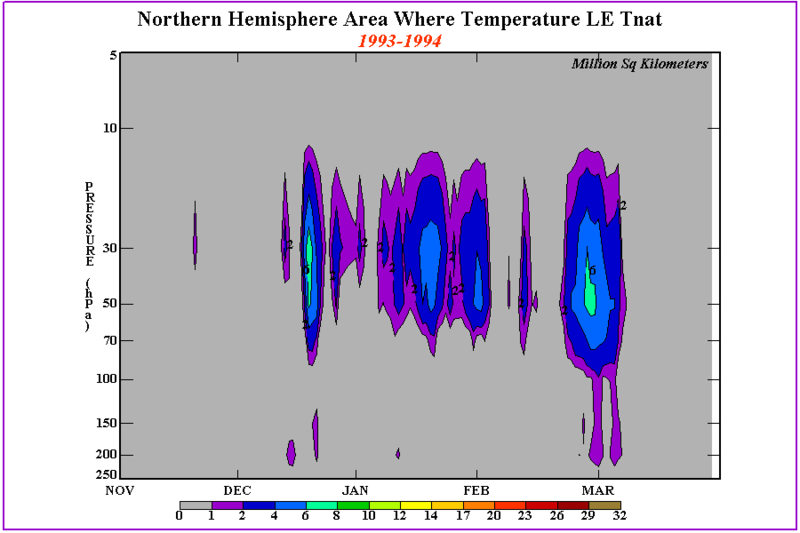 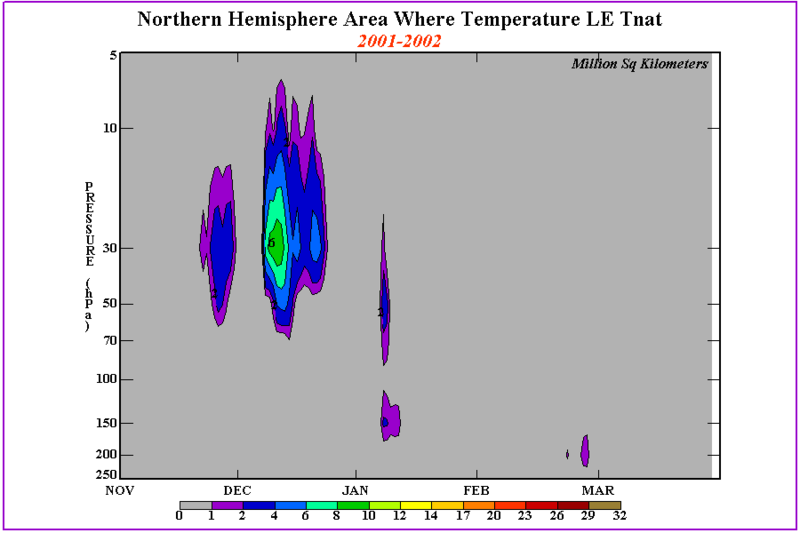 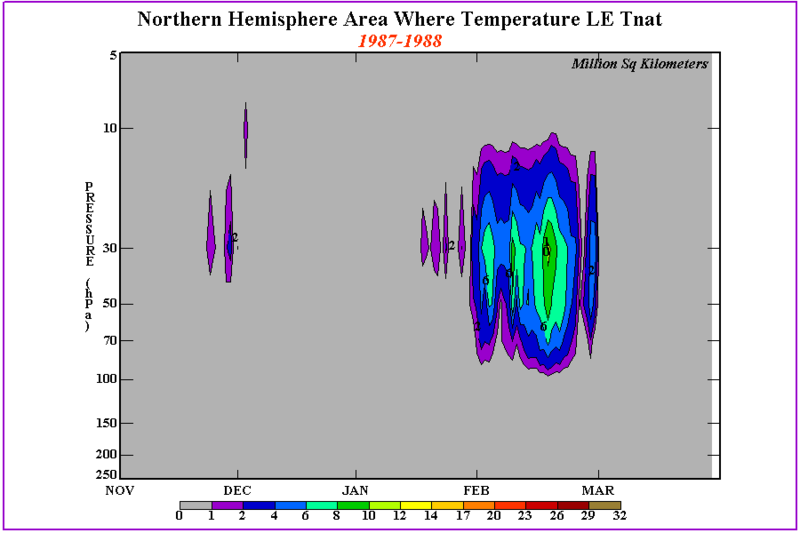 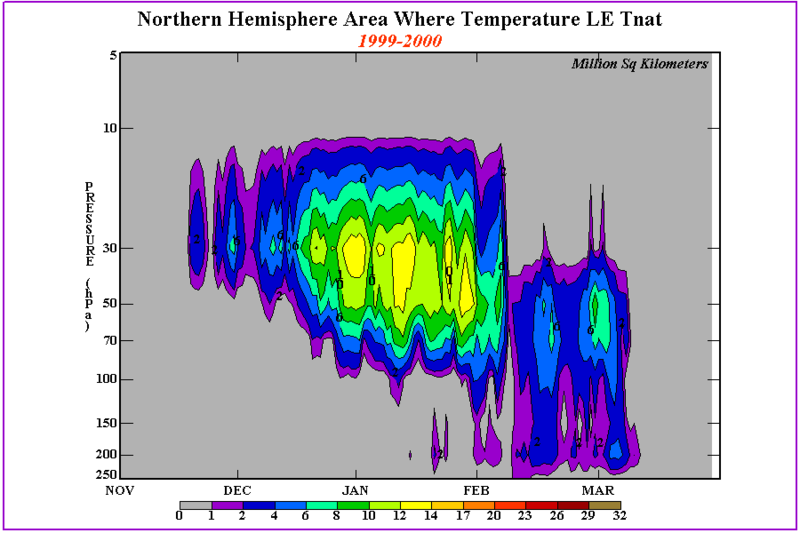 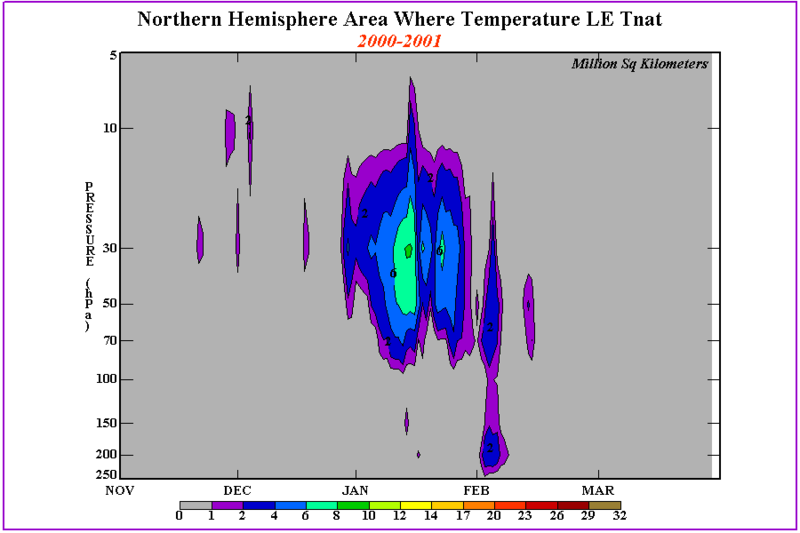 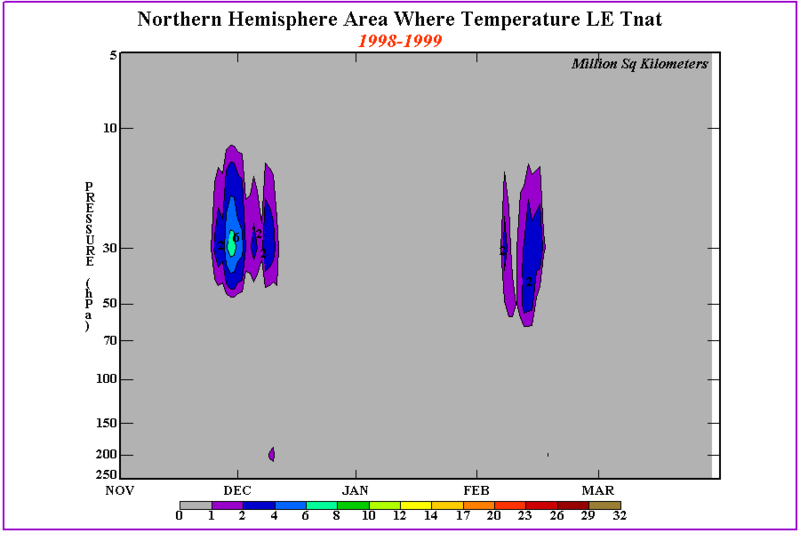 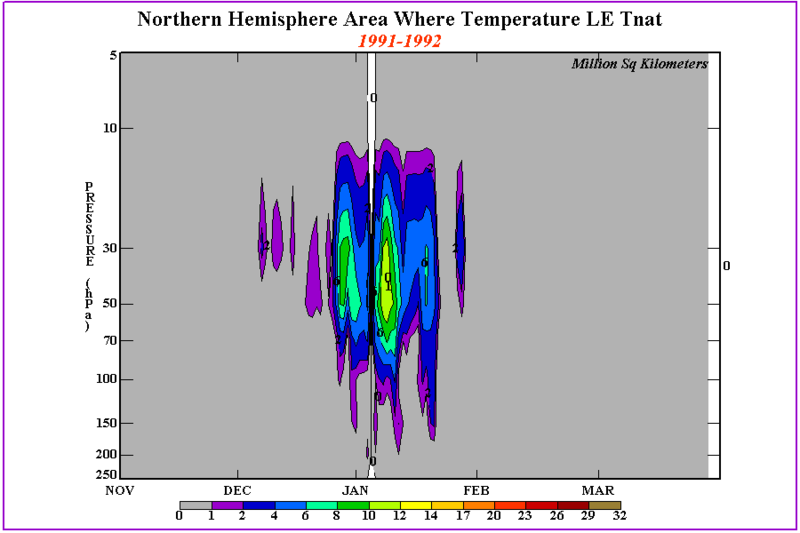 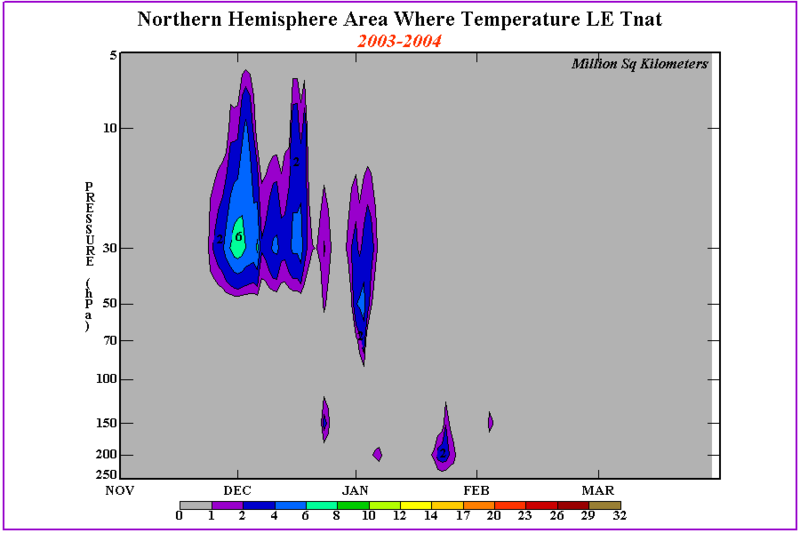 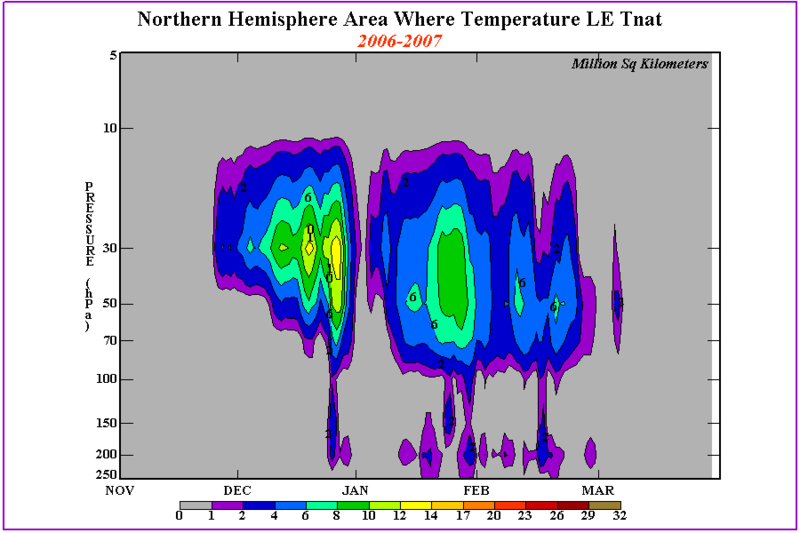 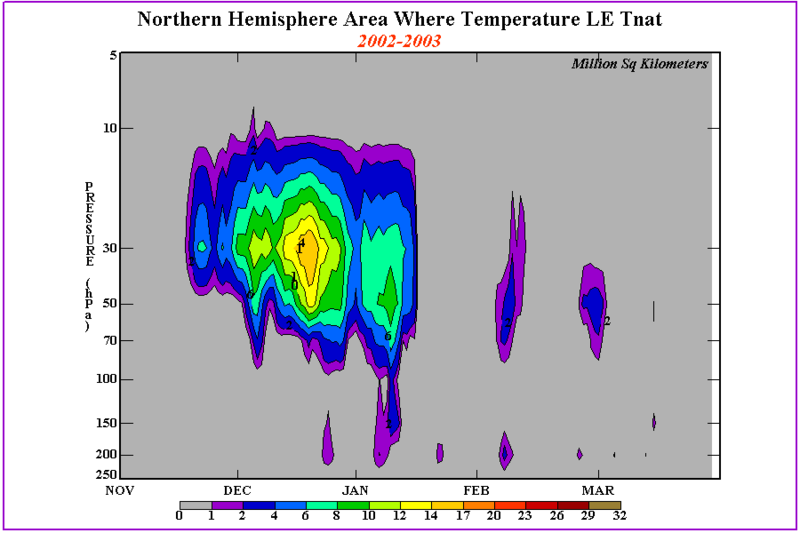 The dynamic heating and then solar heating (in spring time) spread with time throughout the polar stratosphere, leading to the weakening and breakup of the S.H. 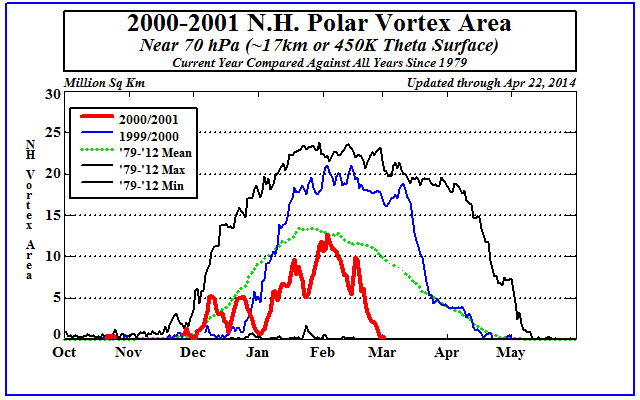 stratospheric polar vortex. 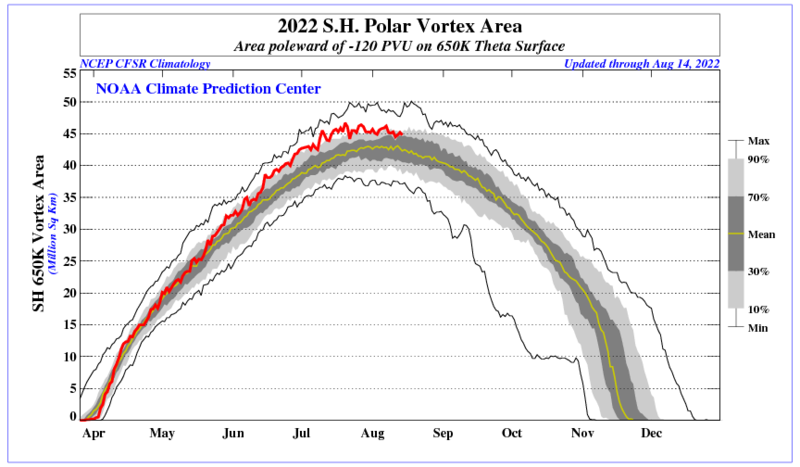 The white contour outlines the altitudes and time of temperatures lower than -78 C, where Polar Stratospheric Clouds may form.